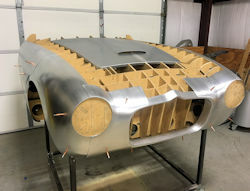 This very special car (S834369) was assembled as a rolling chassis at the Browns Lane factory in August 1957 as a special order for the Jaguar dealer in Geneva, who commissioned Zagato, the legendary Milanese coachbuilder, to design and build the unique alloy body. 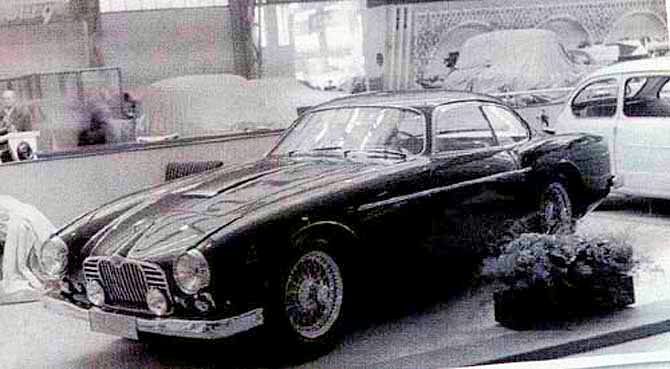 The finished car appeared on the Zagato stand at the Geneva Motor Show in March 1958. 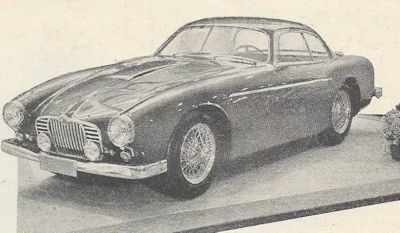 At one time it was thought that Zagato may have built three cars on XK150 chassis, one of which was displayed in Geneva in 1958, with a second shown at the Paris Salon in 1960. The current owner's father was under the impression that his car was the Paris car, although we have now established that it was in fact the 1958 Geneva car. 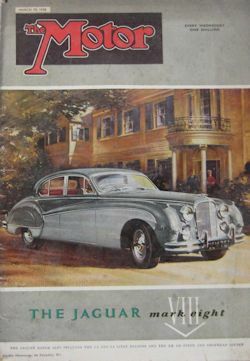 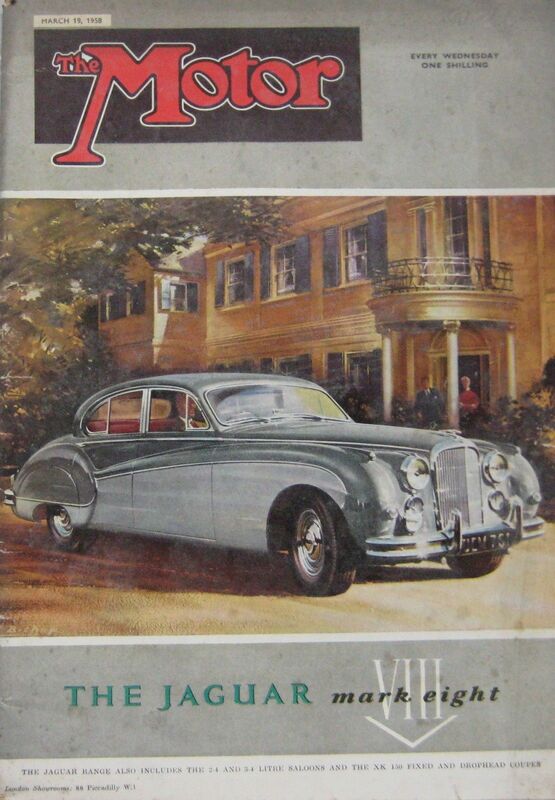 Photos of this car, which had previously been mistakenly attributed to the 1960 Paris show, appear in a Motor (UK magazine) Geneva Show report dated March 1958. 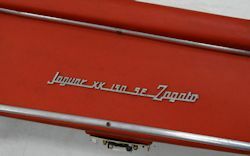 This discovery, together with the existence of several photographs of a clearly different XK150 Zagato, supports the theory that only two Jaguar XK150 Zagatos were ever built. 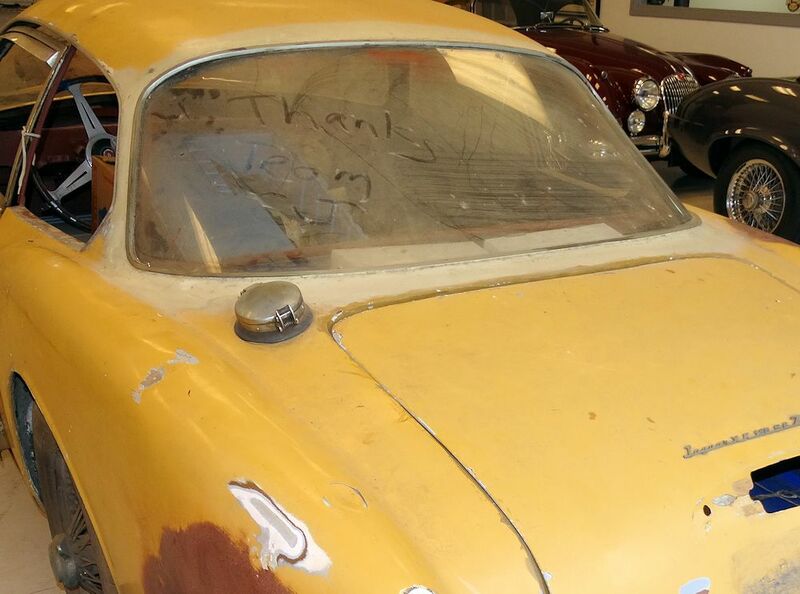 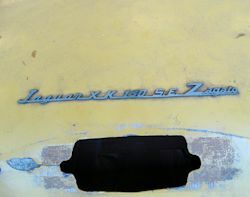 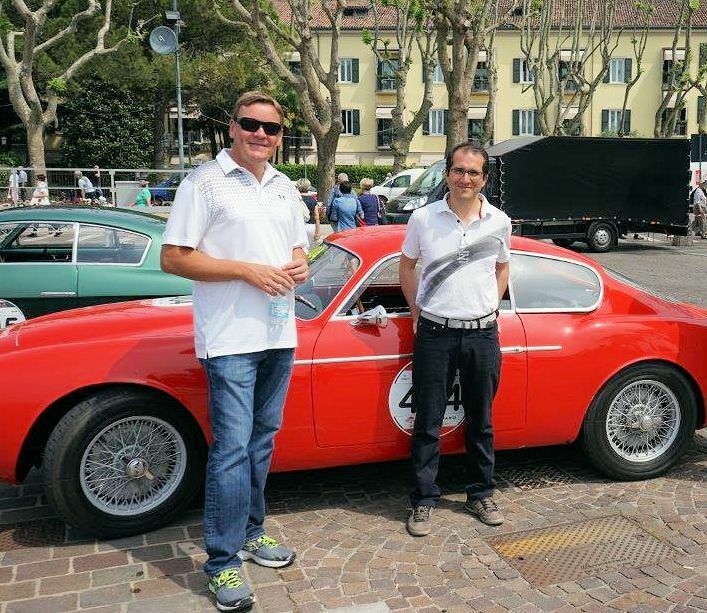 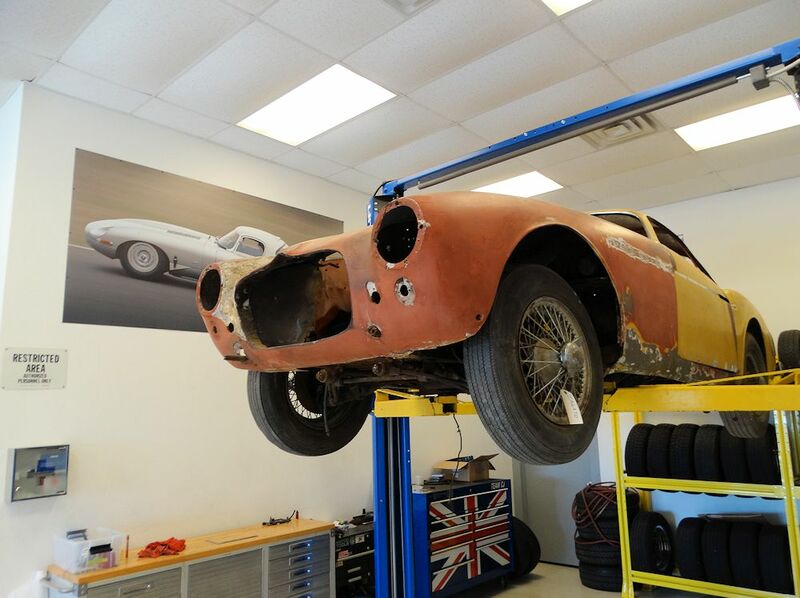 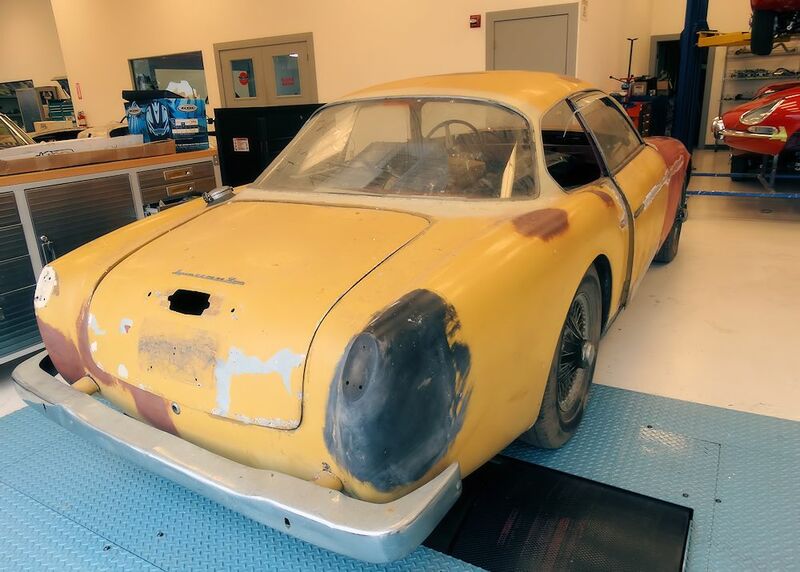 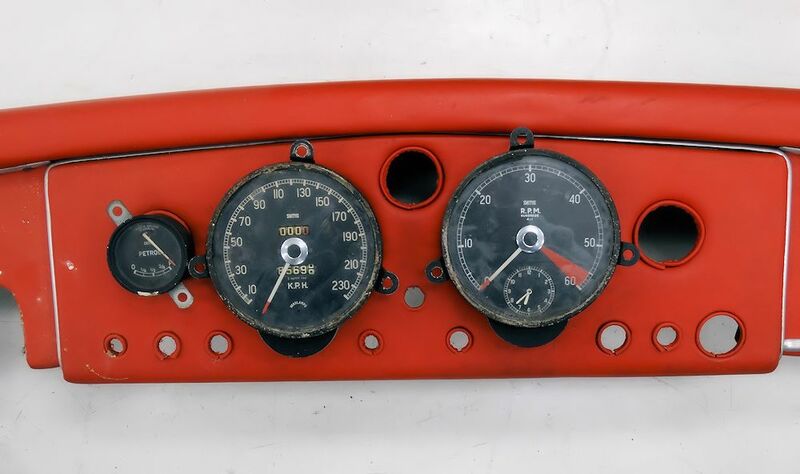 The whereabouts of the second XK150 Zagato are unknown. 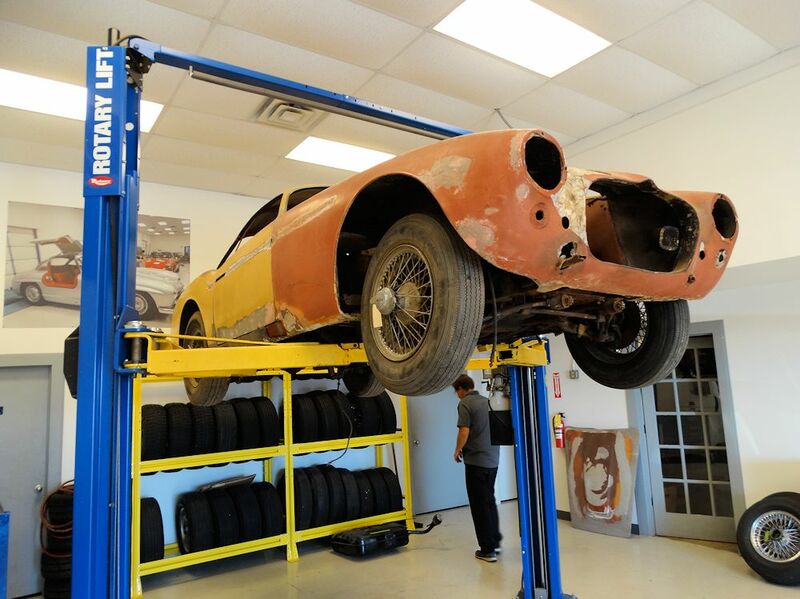 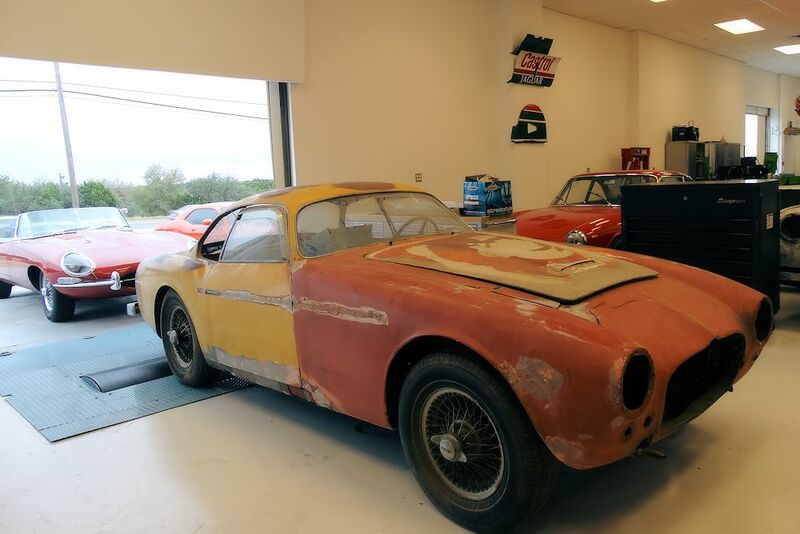 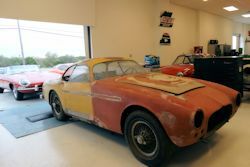 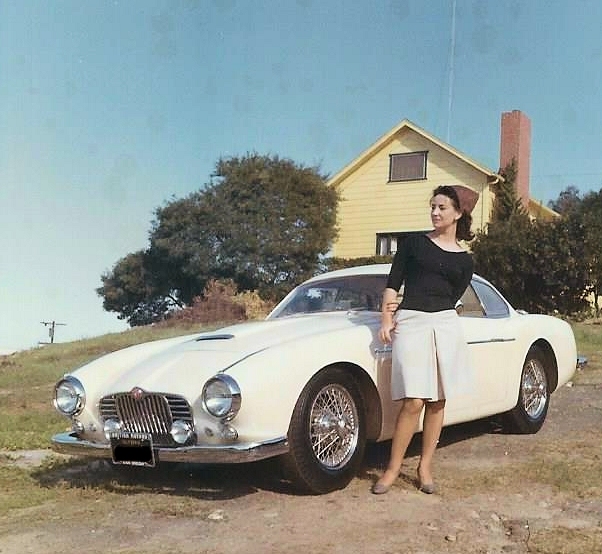 At some point in the very early 1960's, our Jaguar XK150 Zagato made its way to the United States where it was purchased by the current owner's father in 1964. 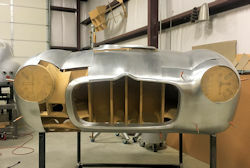 We are honored to have been entrusted with the restoration of this very special and unique motor car. Shaping the rear lamp panels. Interesting to see the new nose alongside the original body yesterday. 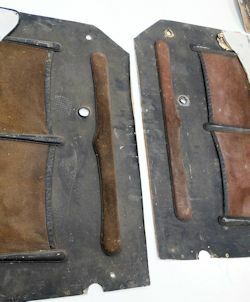 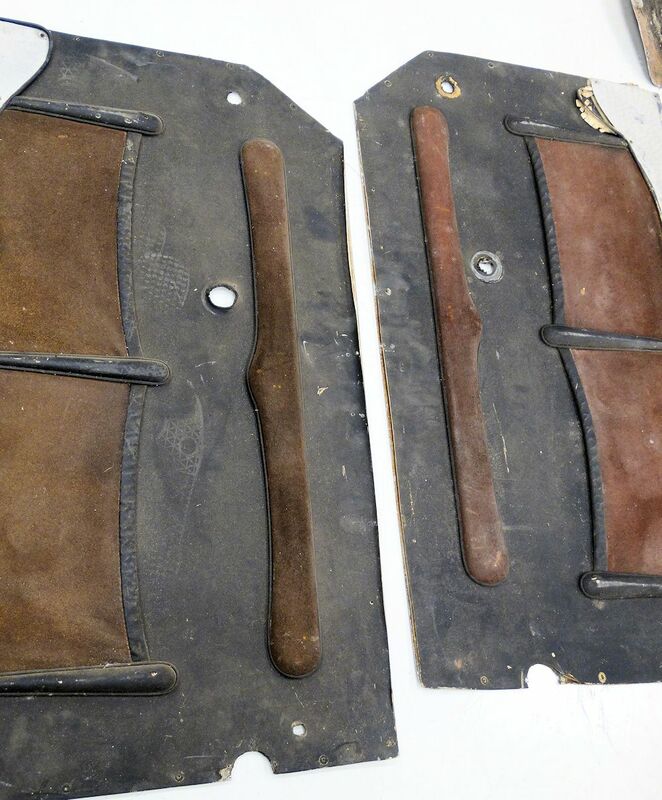 Edward has now cut and assembled the rear station buck and has made the first two panels for the rear end. 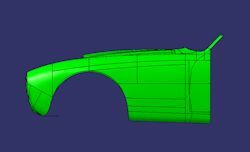 Edward has now completed the design of the station buck for the rear bodywork. 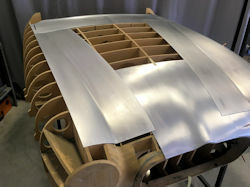 Edward has now welded together all the various newly fabricated panels which form the outer skin of the bonnet. 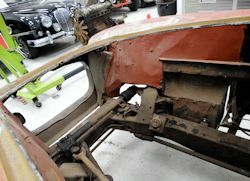 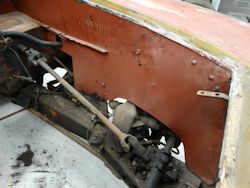 Next task is to recreate the steel tubing that acts as the lower frame of the bonnet. 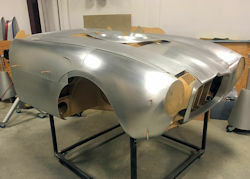 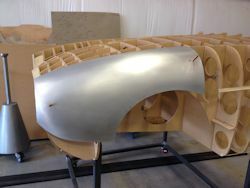 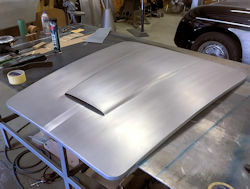 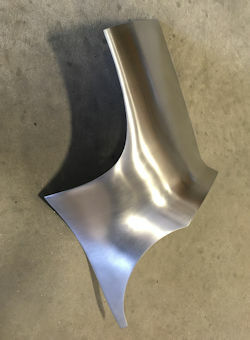 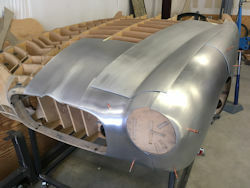 Edward has been busy fabricating a new bonnet for the Zagato. 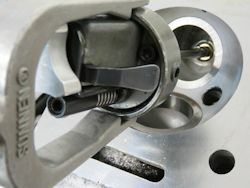 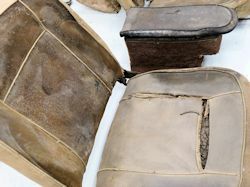 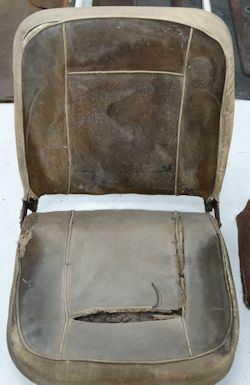 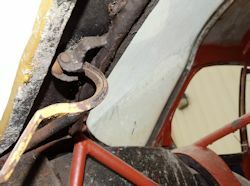 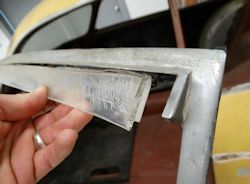 The original bonnet had suffered serious galvanic corrosion where the aluminum skin was wrapped around the steel Superleggera frame. 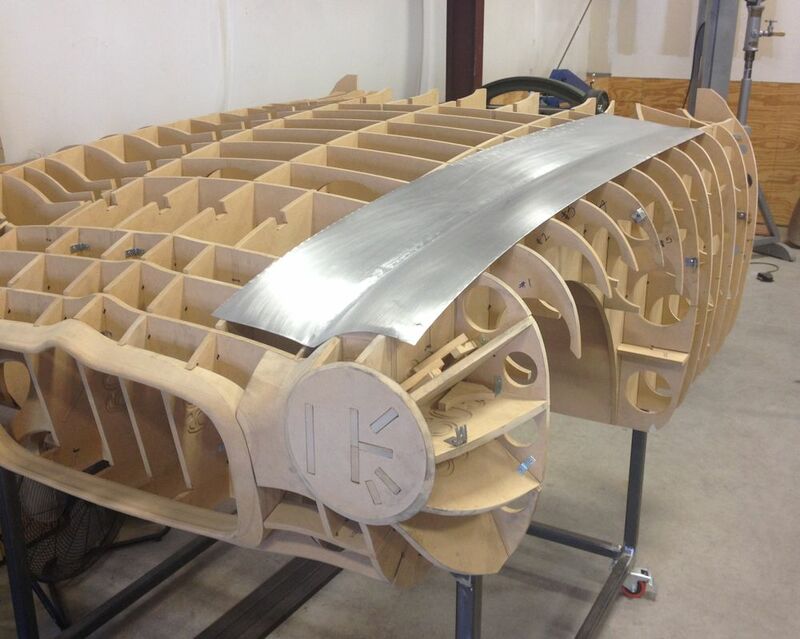 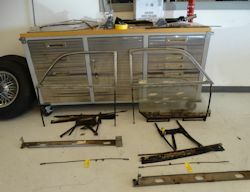 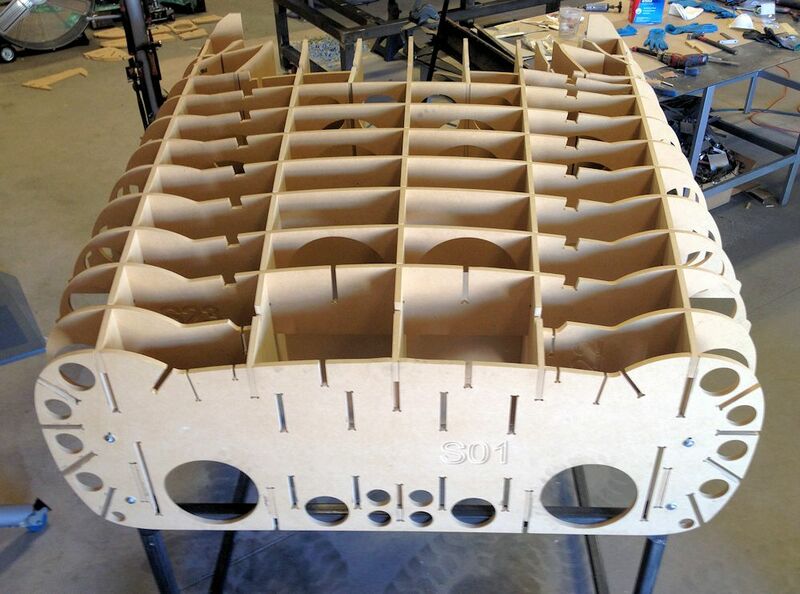 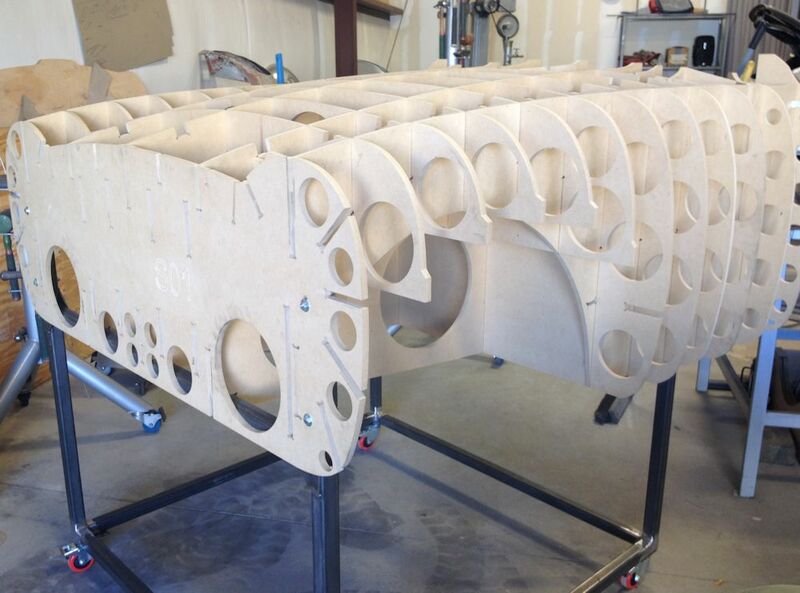 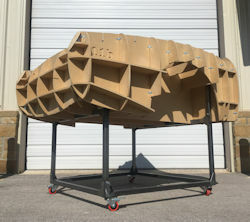 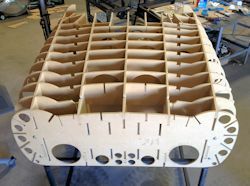 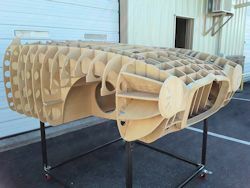 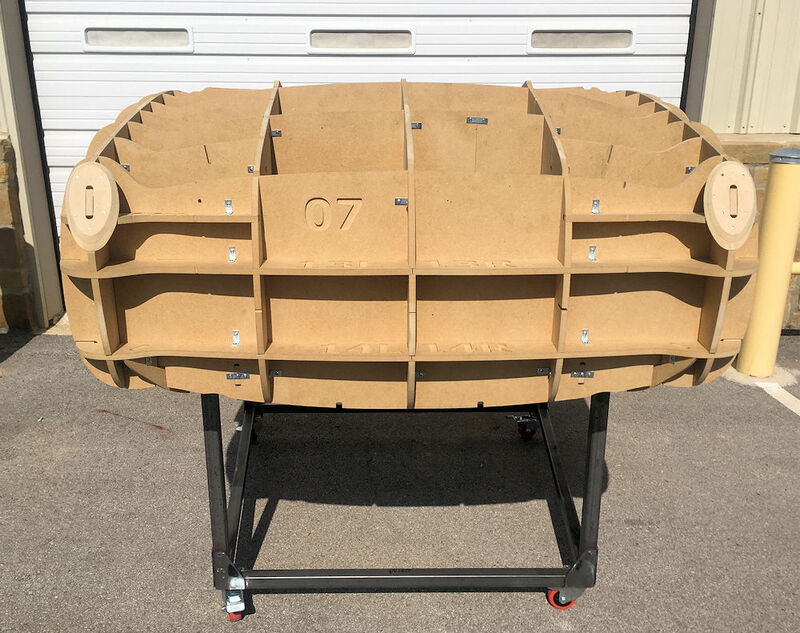 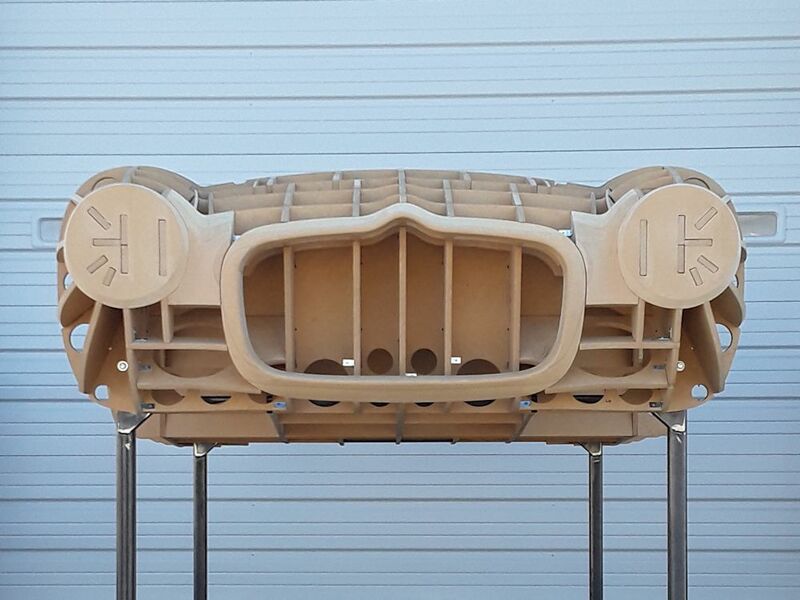 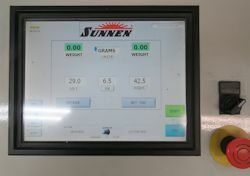 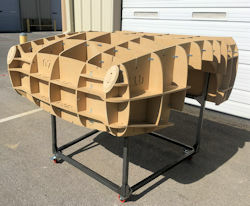 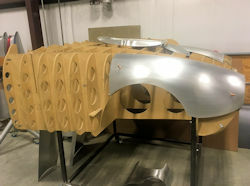 With 18 panels for the front end now completed, I thought it might be interesting to assemble what we have so far. 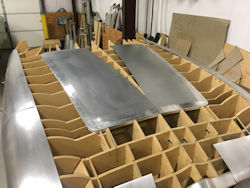 It is really starting to take shape now. 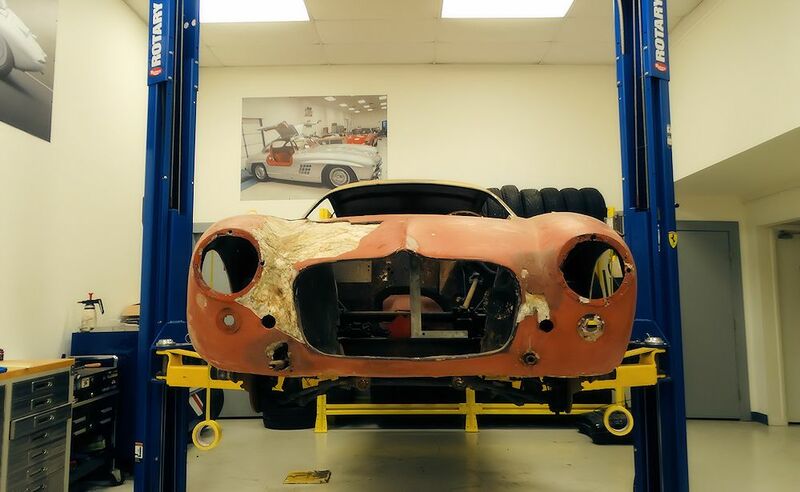 Edward continuing to work on the Zagato front end. 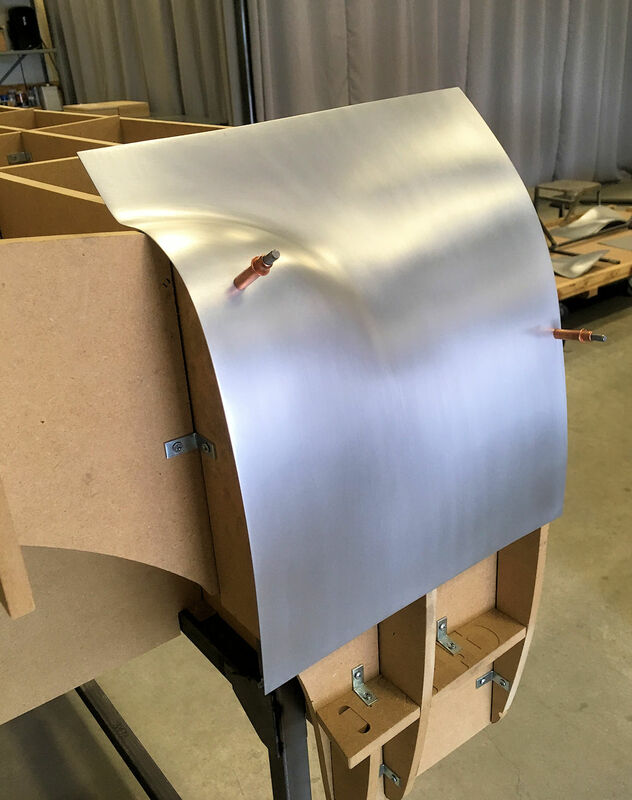 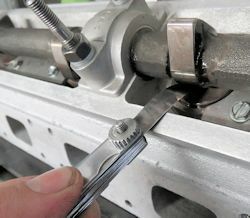 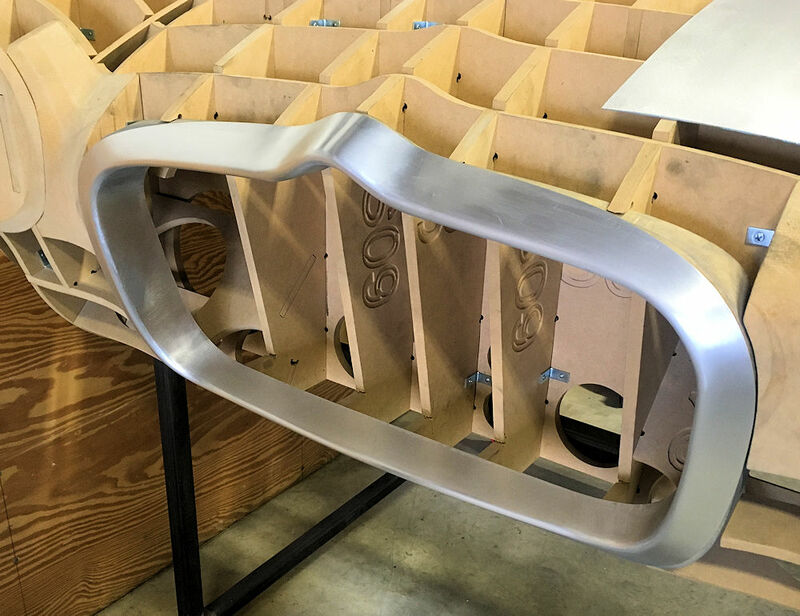 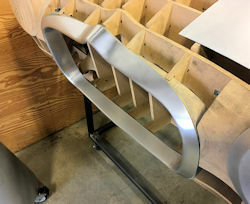 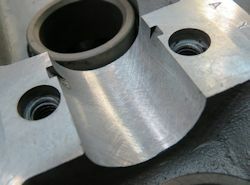 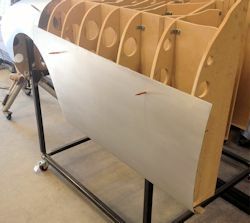 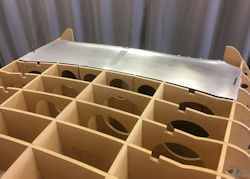 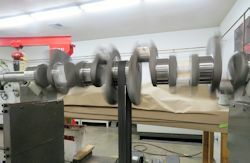 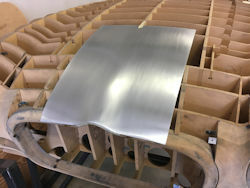 Fabrication of the new aluminum panels for the front end, continued. 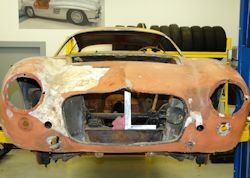 More progress with the Zagato front end. 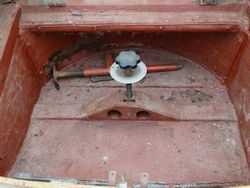 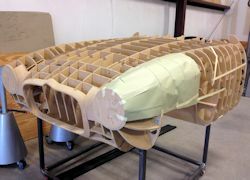 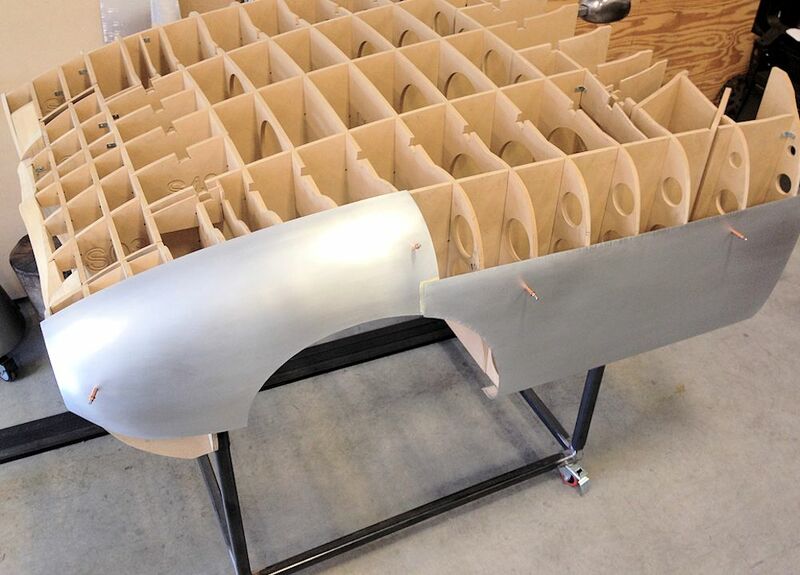 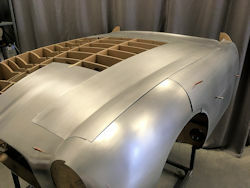 More panels taking shape at the front end of the Zagato. 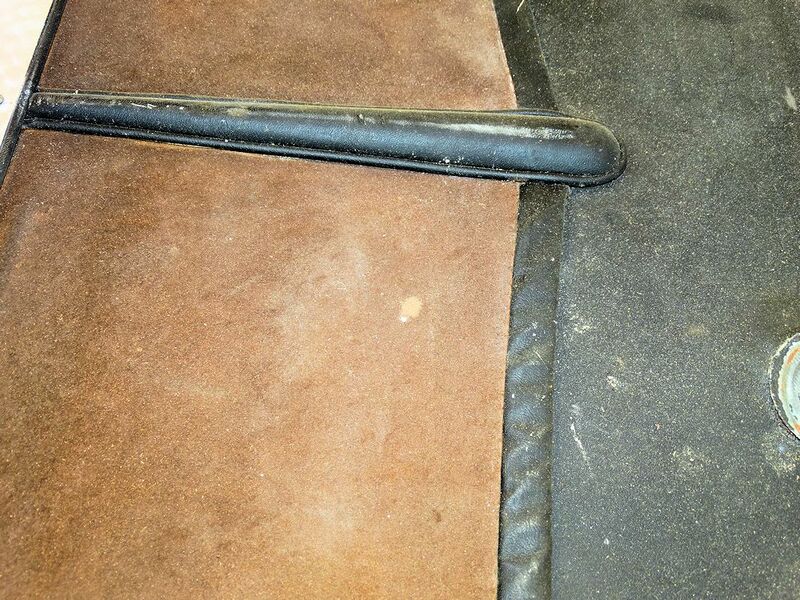 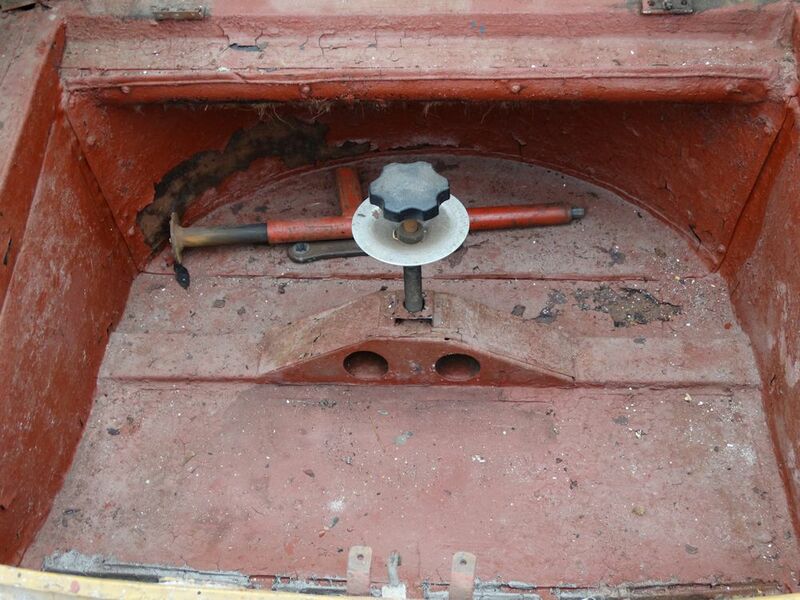 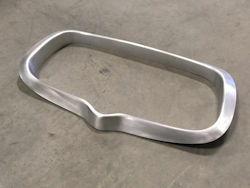 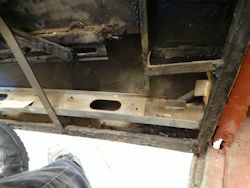 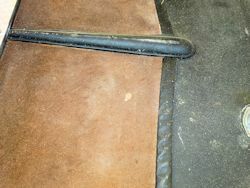 Edward has been busy shaping the grill opening to the station buck. 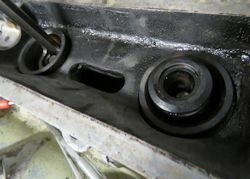 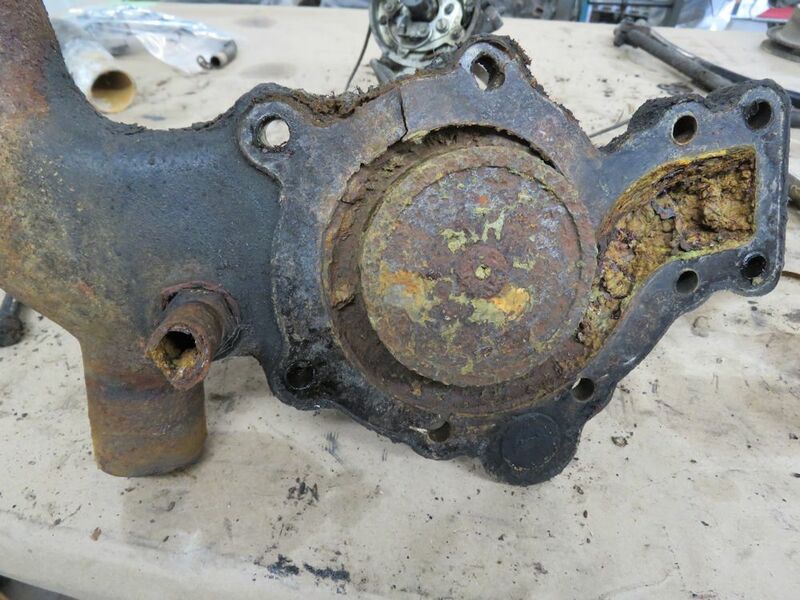 The engine block for our Zagato project was probably the worst we have ever seen in terms of internal corrosion and blocked water jackets. 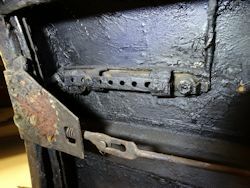 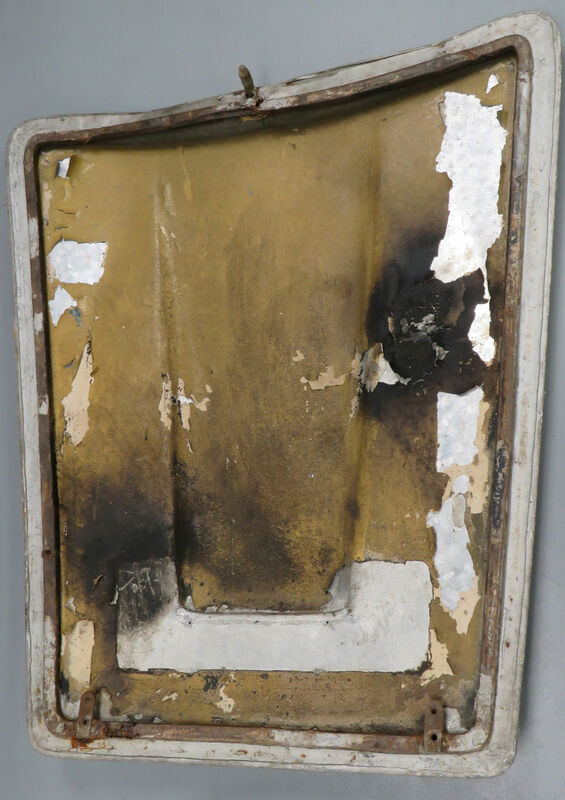 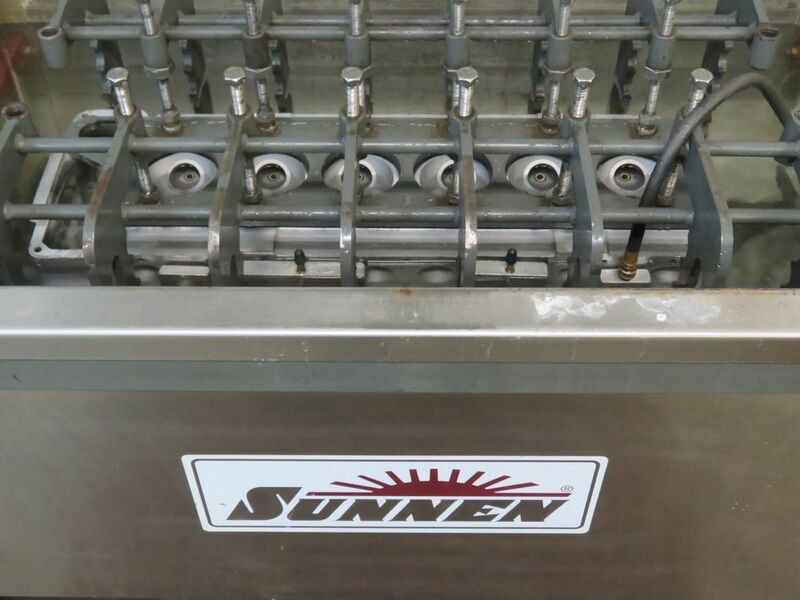 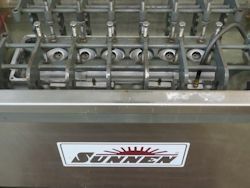 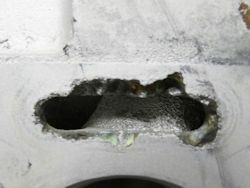 In fact the block was so bad that even after multiple trips to the detergent oven we still had significant internal blockages that we were unable to flush out. 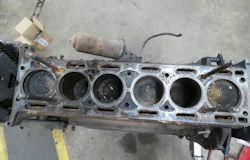 In the end we had to submerge the block in an alkaline bath, which finally did the trick. 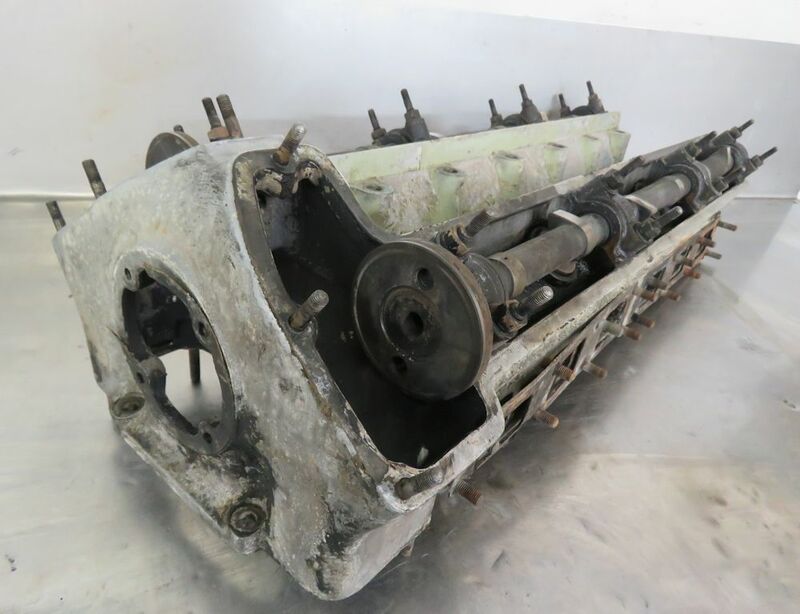 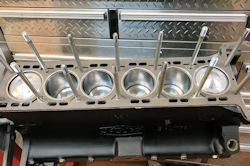 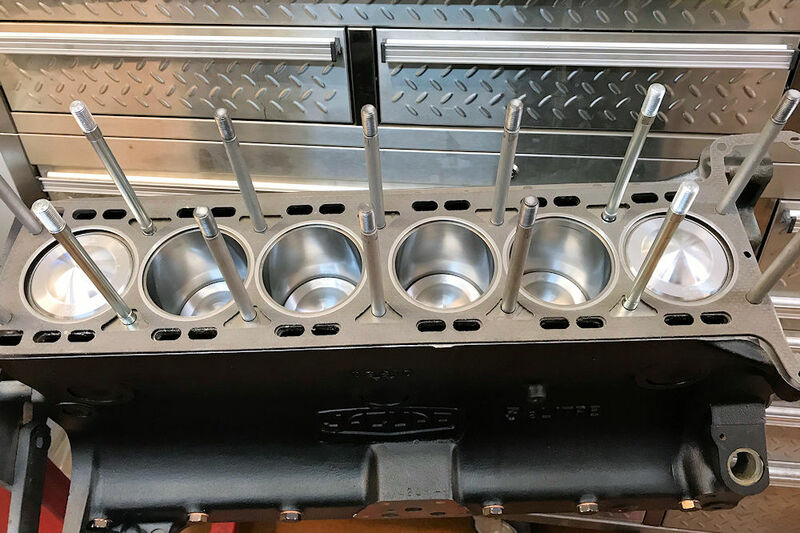 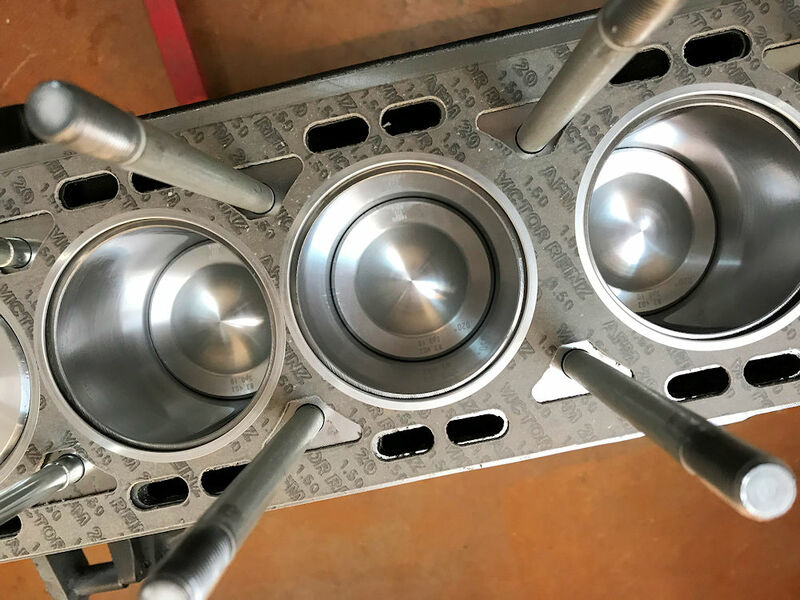 After overcoming this significant hurdle, I am pleased to report that we have now completed all of the machine work and assembled this engine. 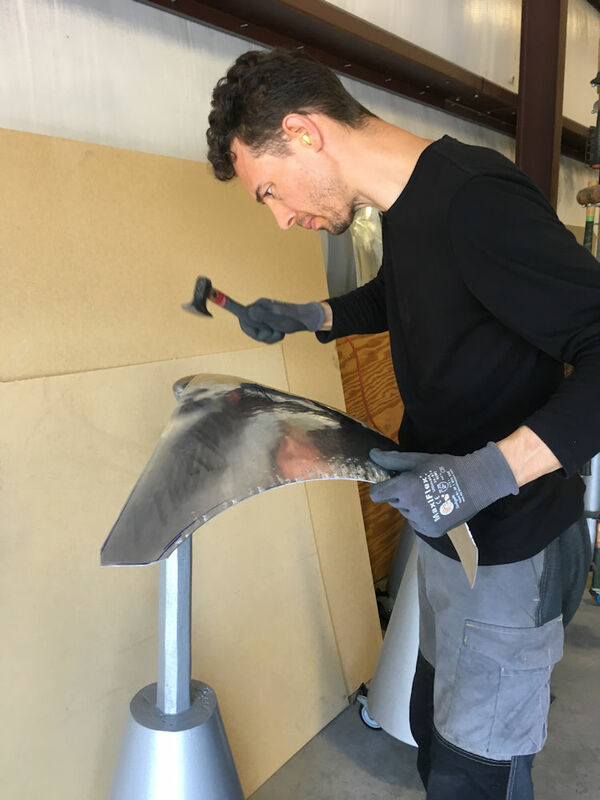 Edward has now shaped the fifth and sixth panels and welded them to panel #1. 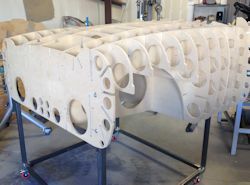 Edward has now completed the fourth panel for the left front wing. 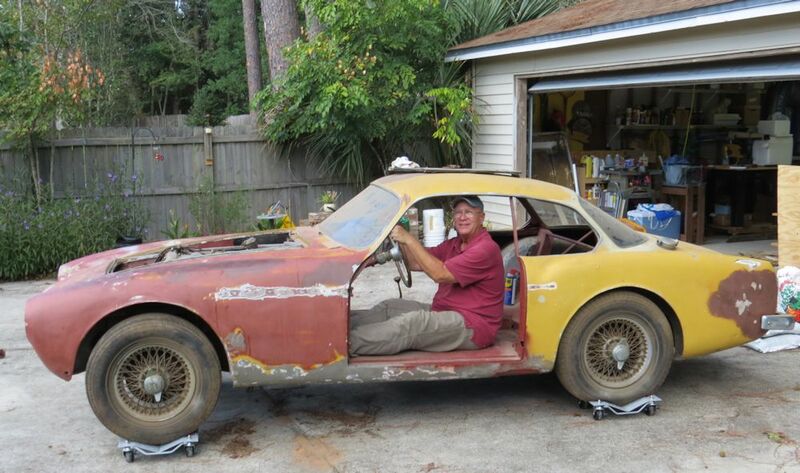 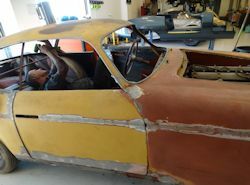 Next he will fabricate the panel beneath the left hand headlamp. 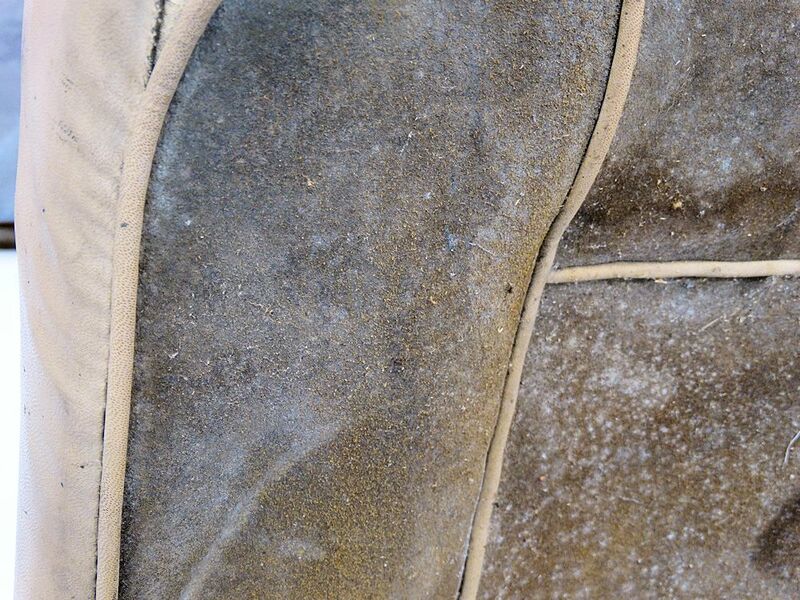 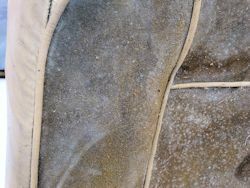 Edward has now finished shaping the third panel. 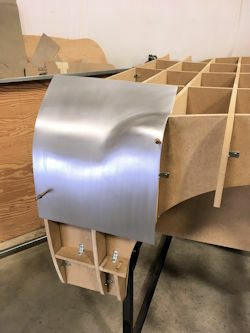 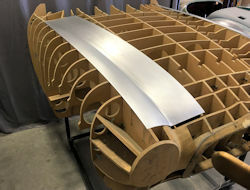 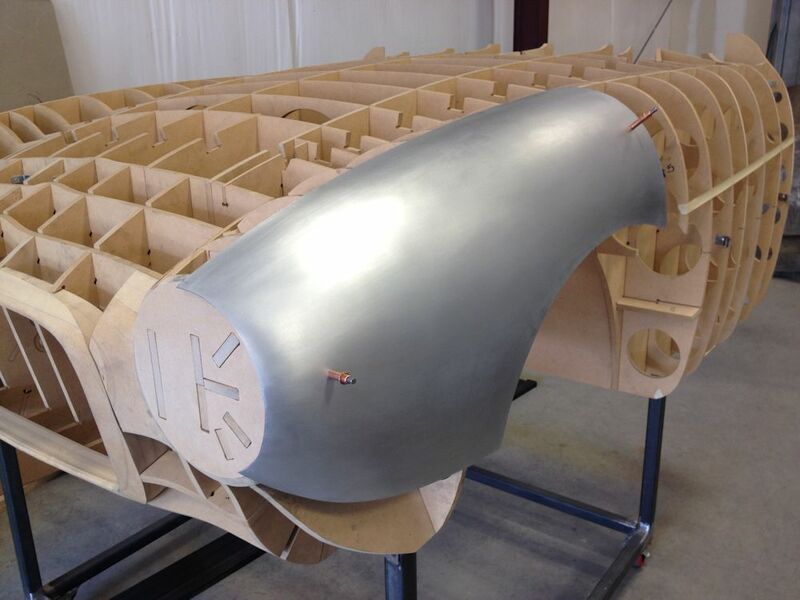 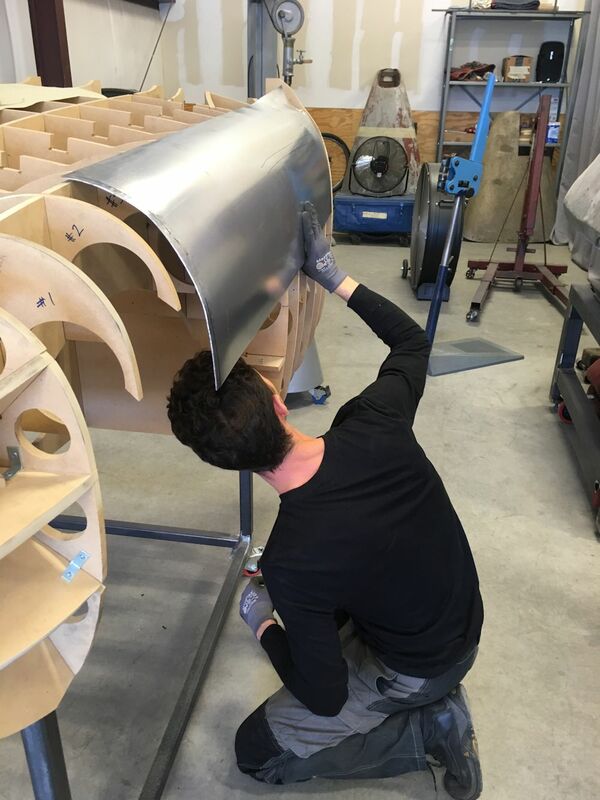 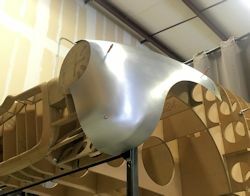 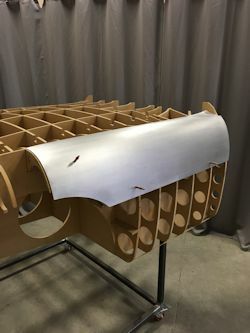 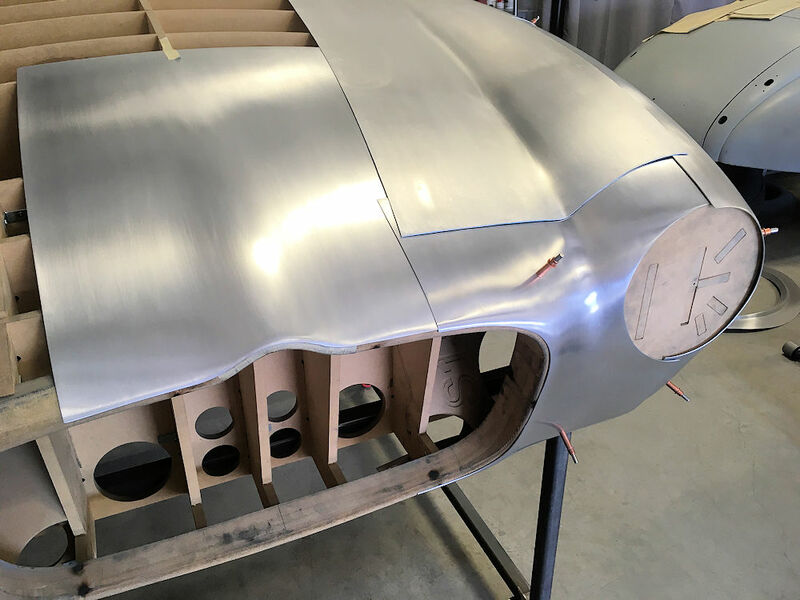 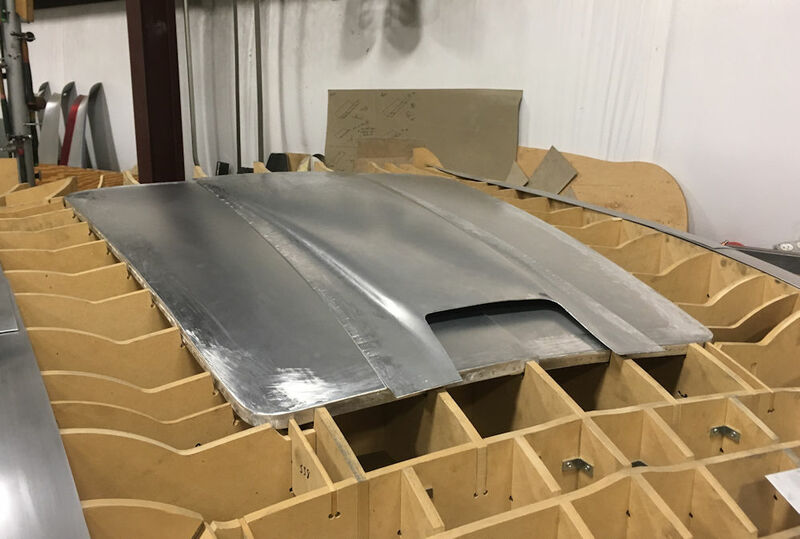 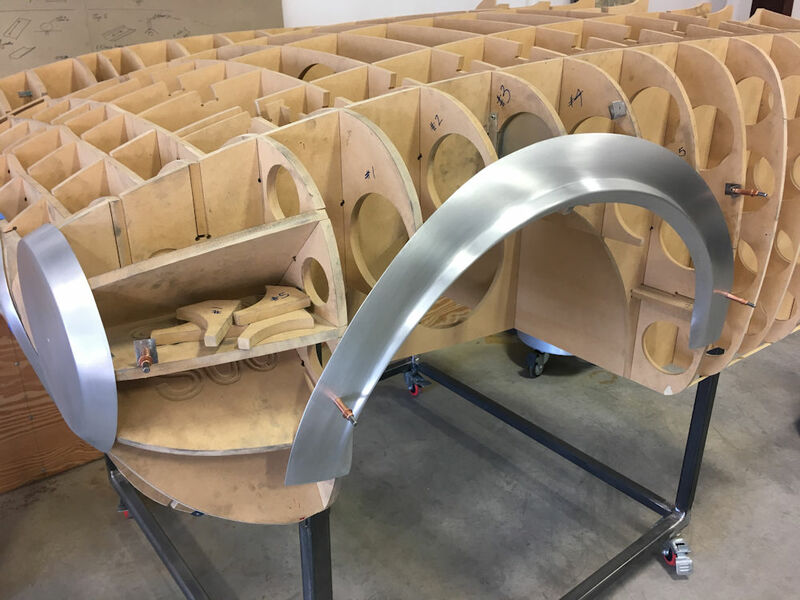 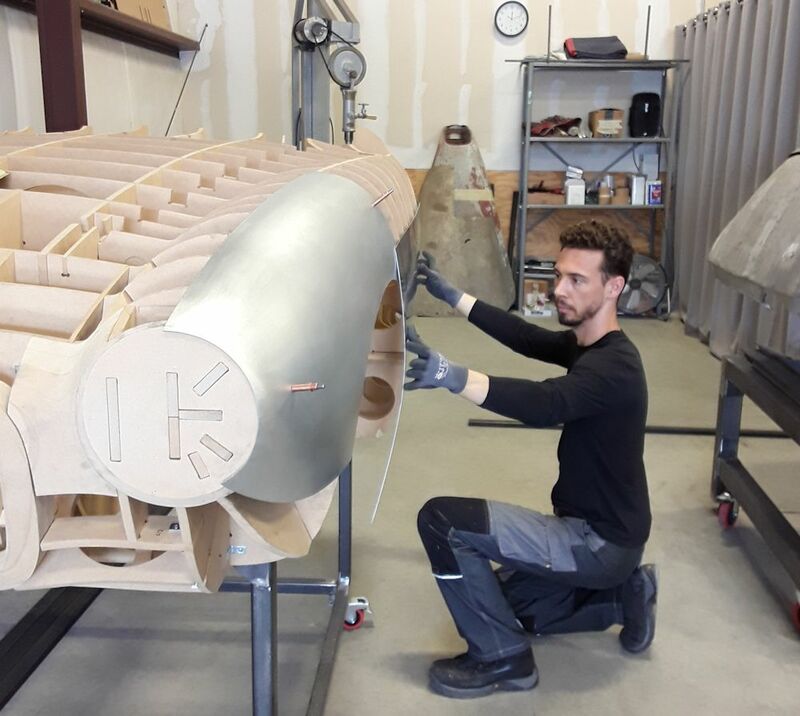 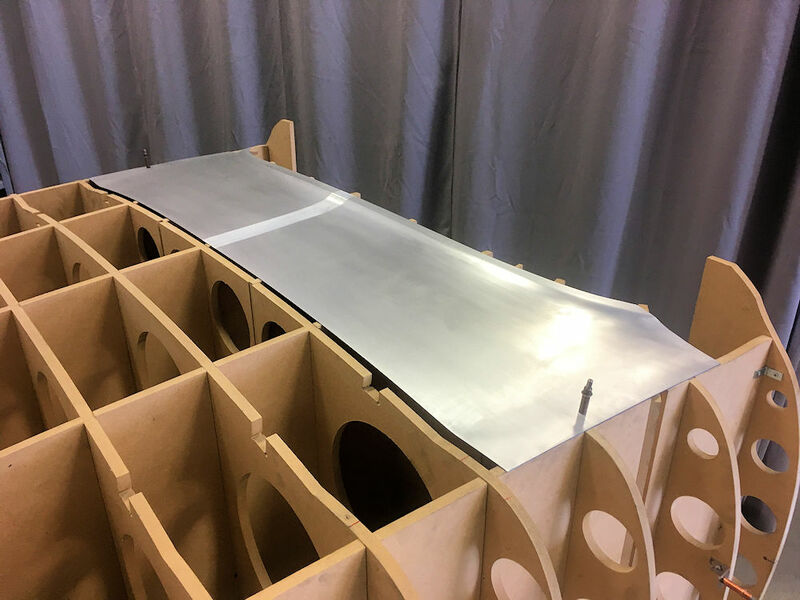 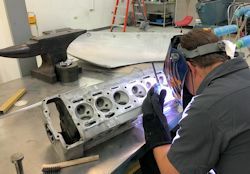 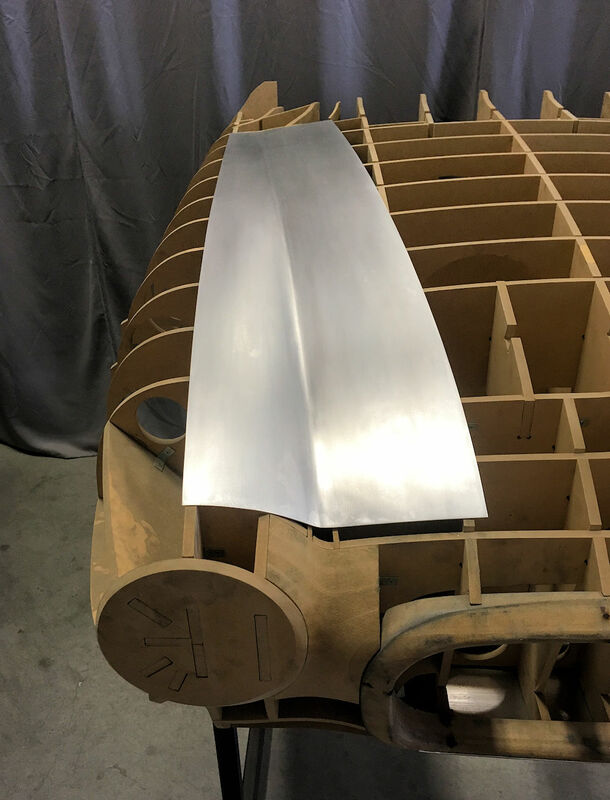 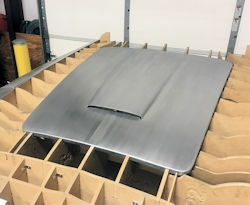 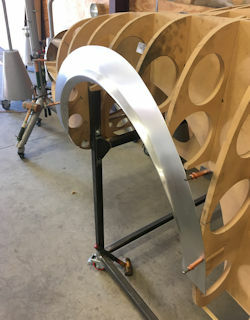 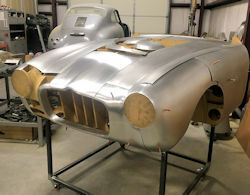 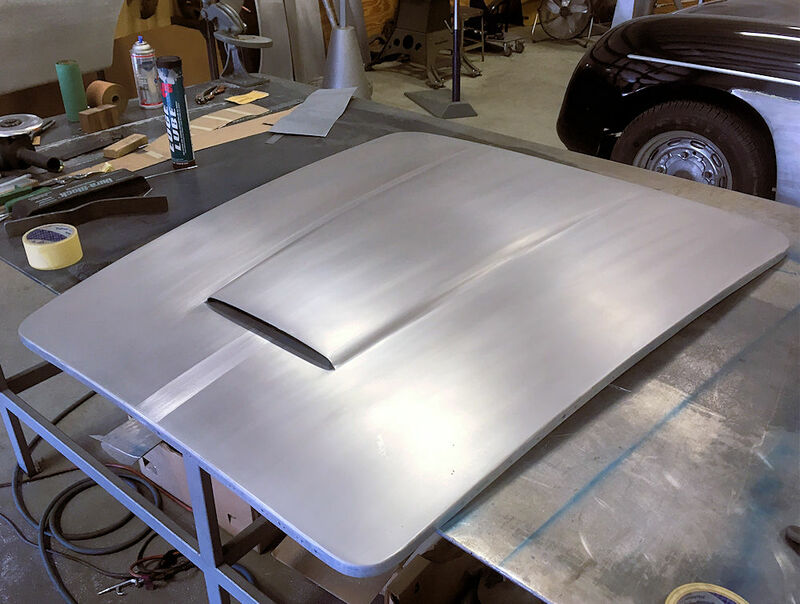 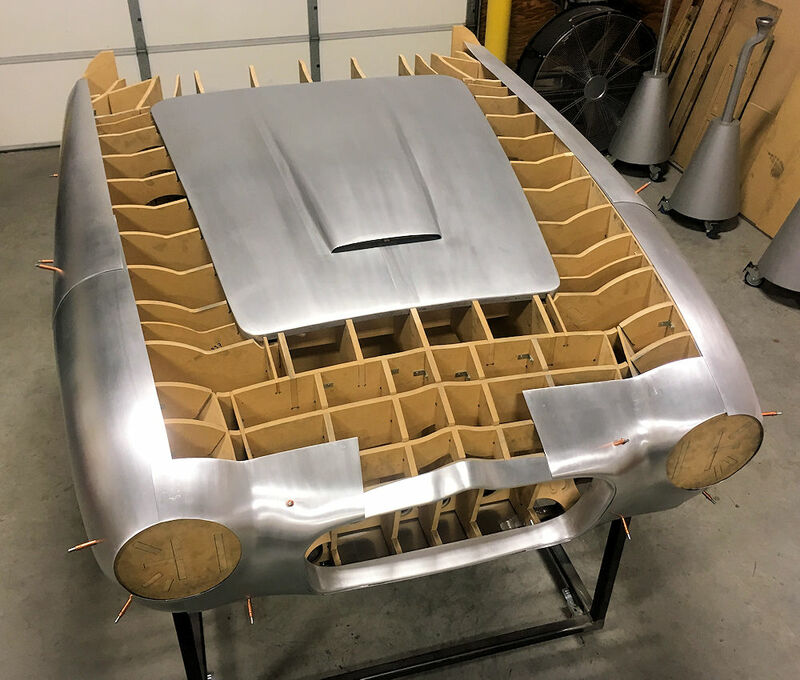 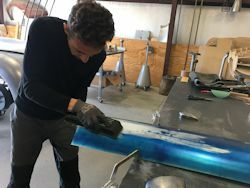 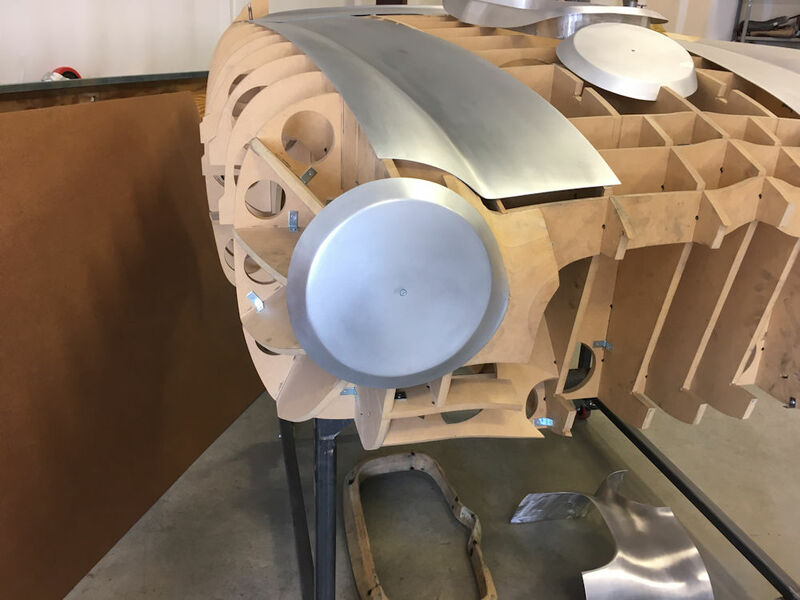 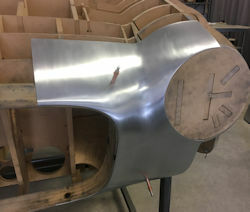 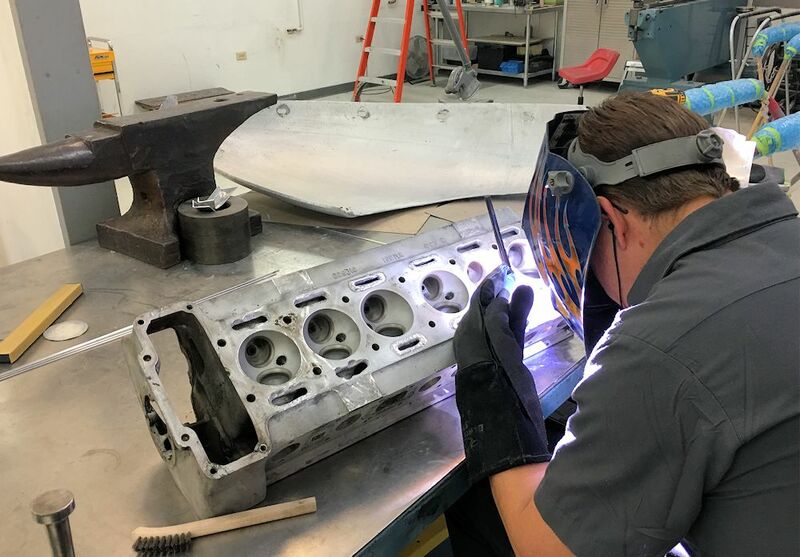 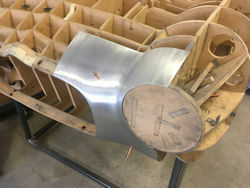 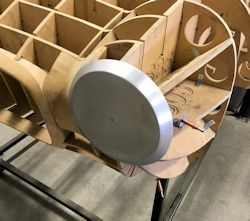 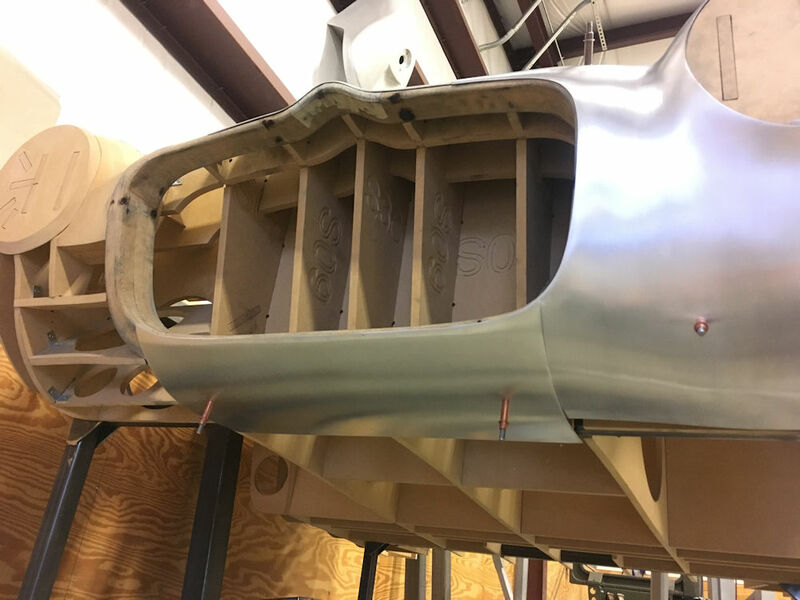 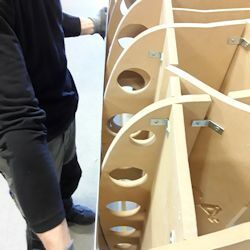 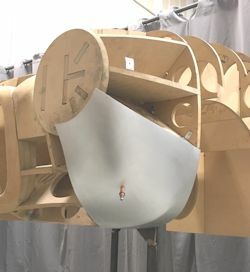 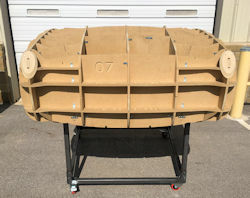 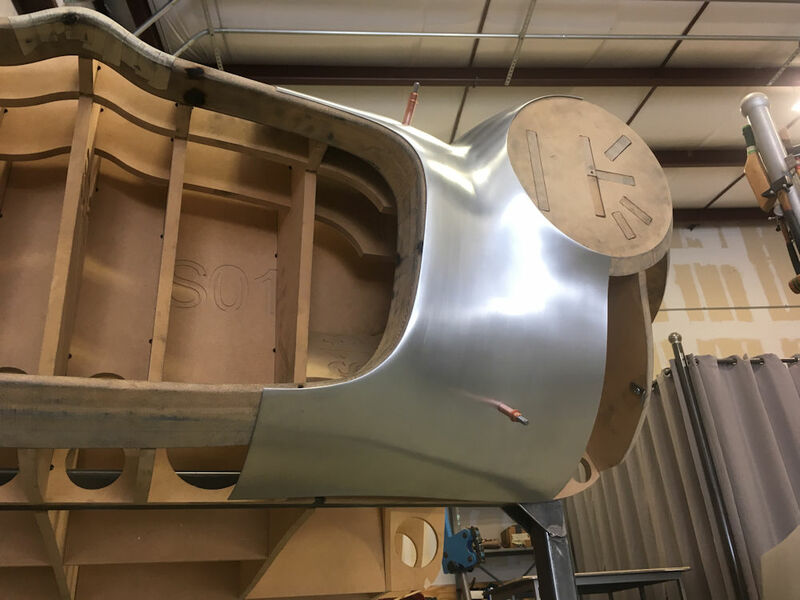 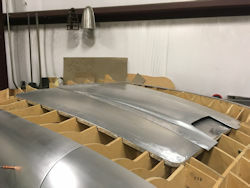 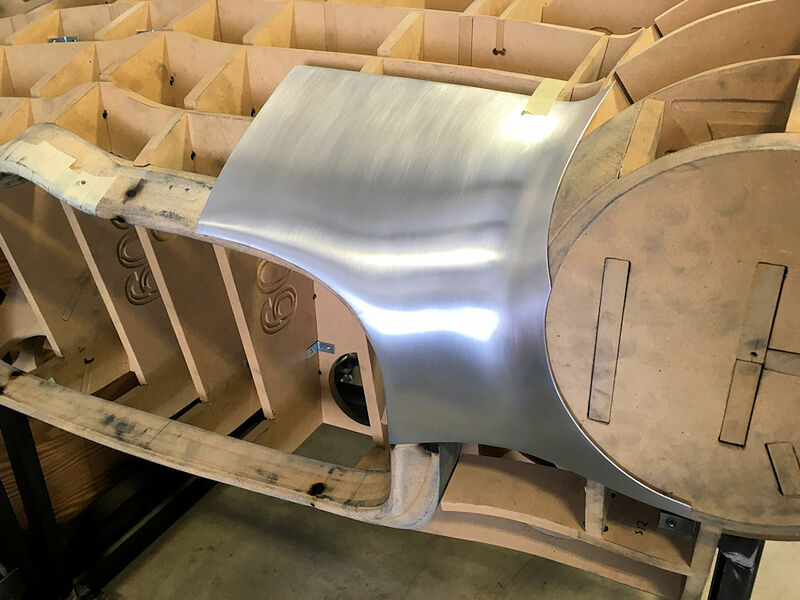 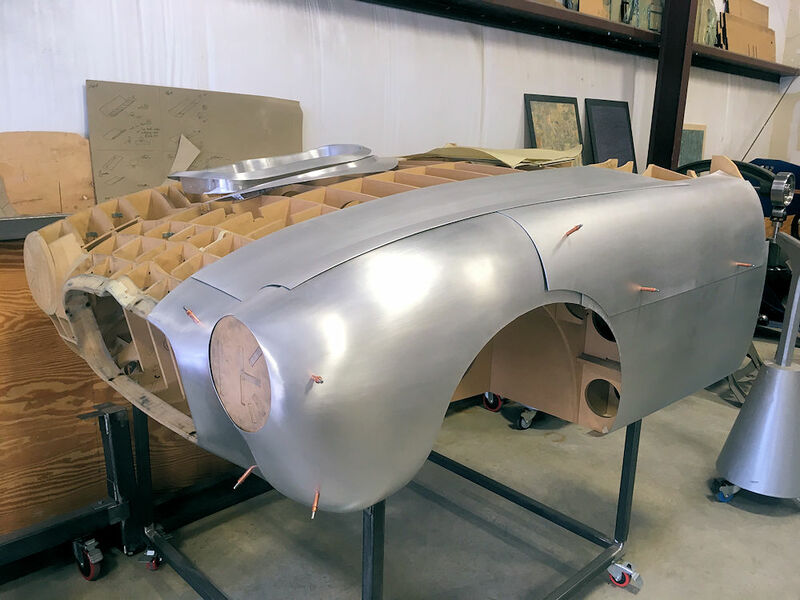 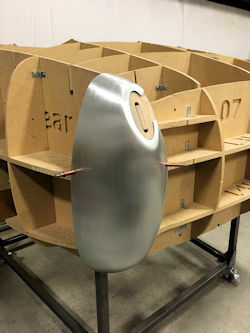 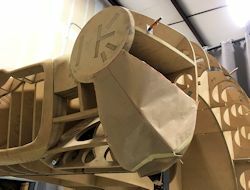 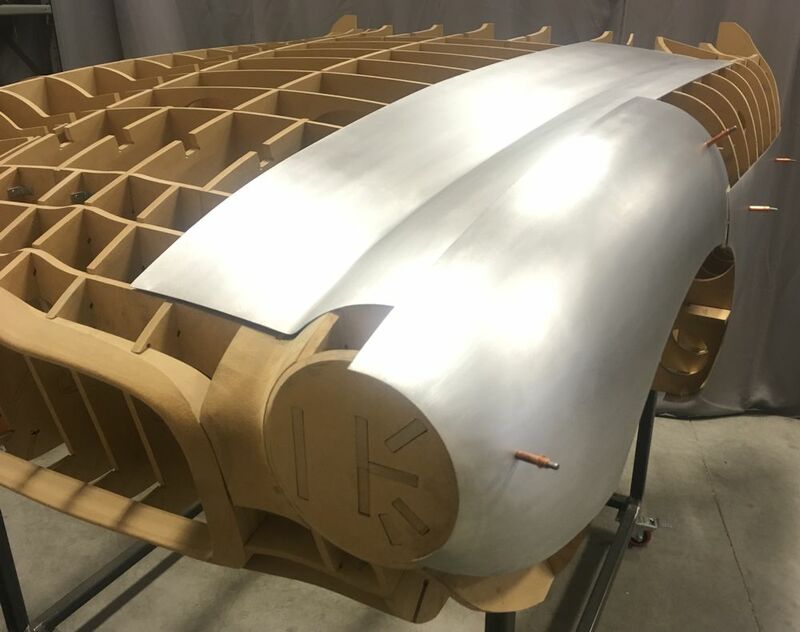 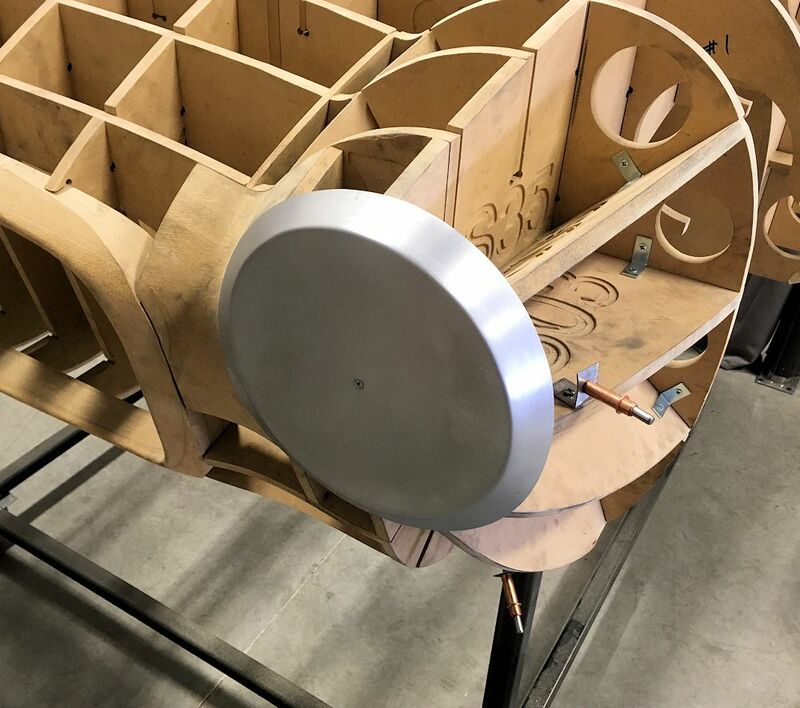 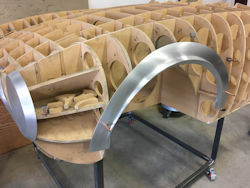 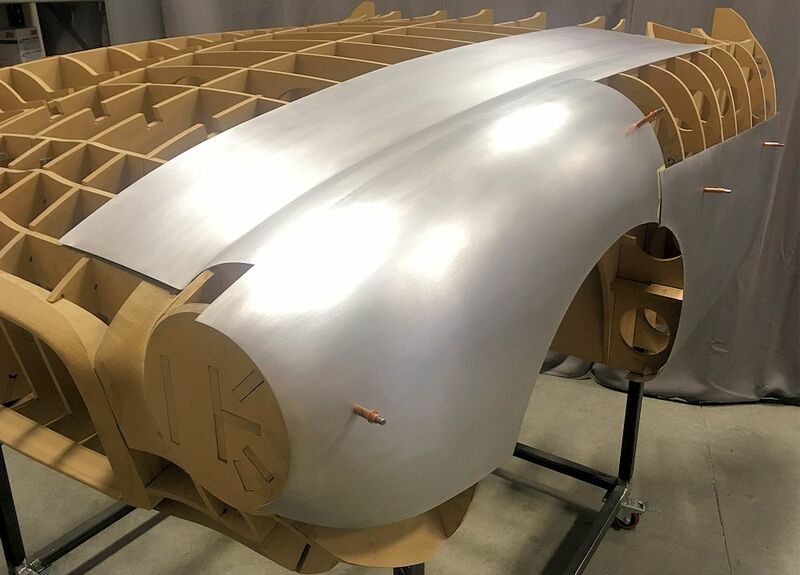 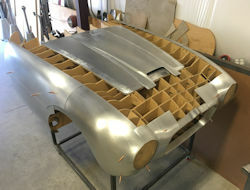 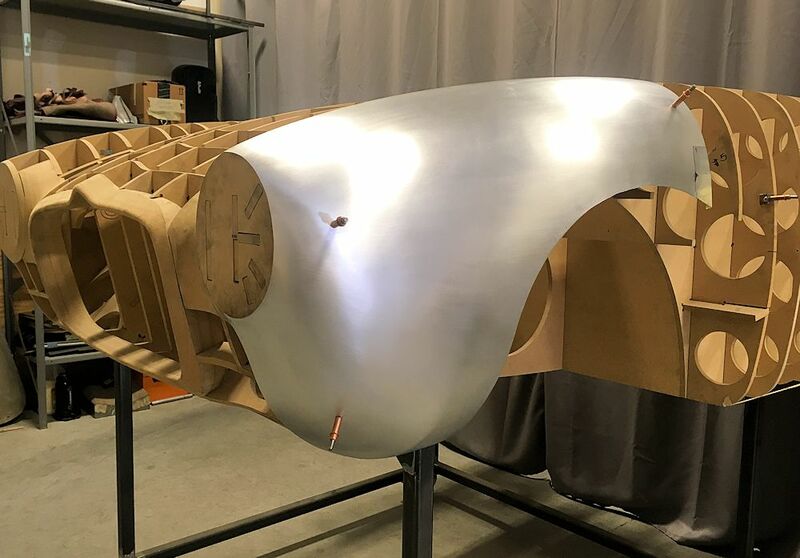 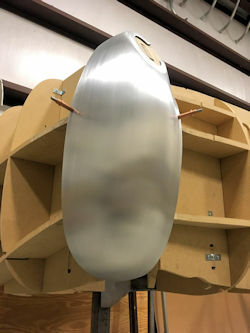 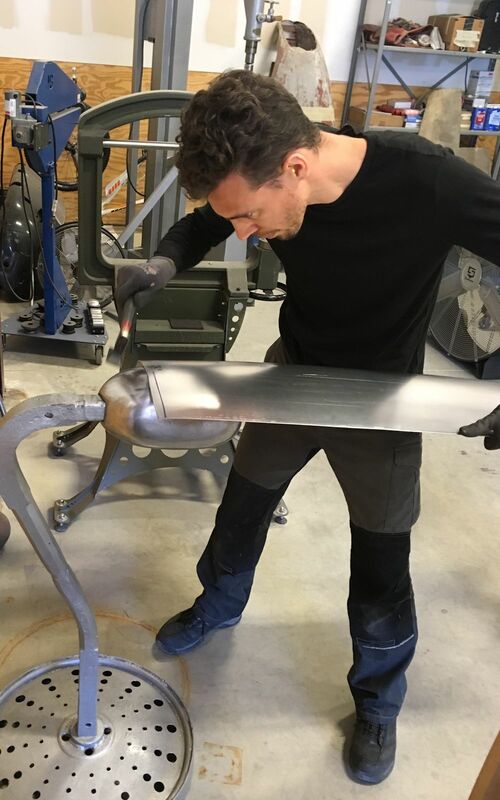 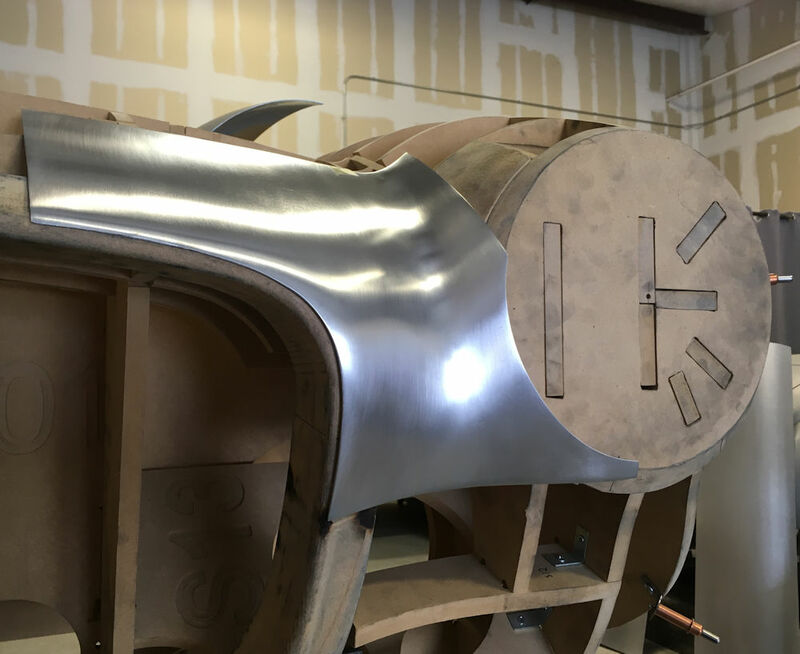 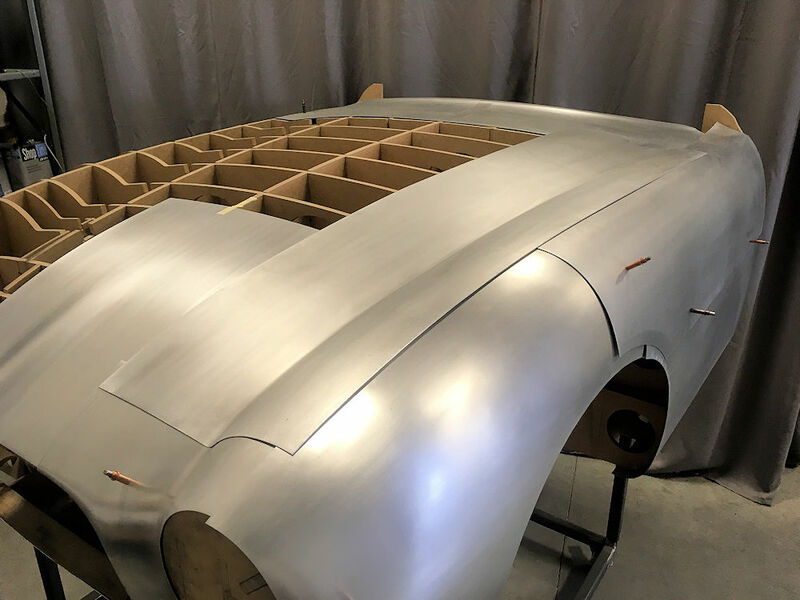 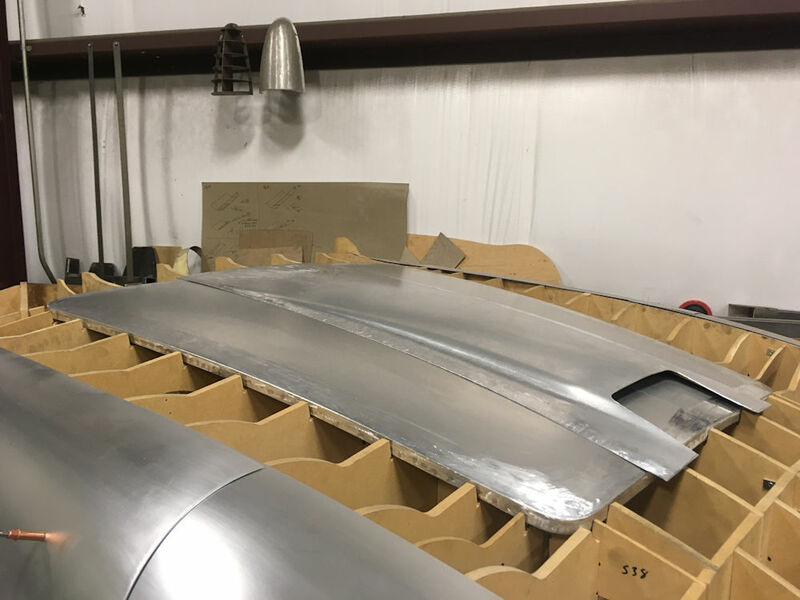 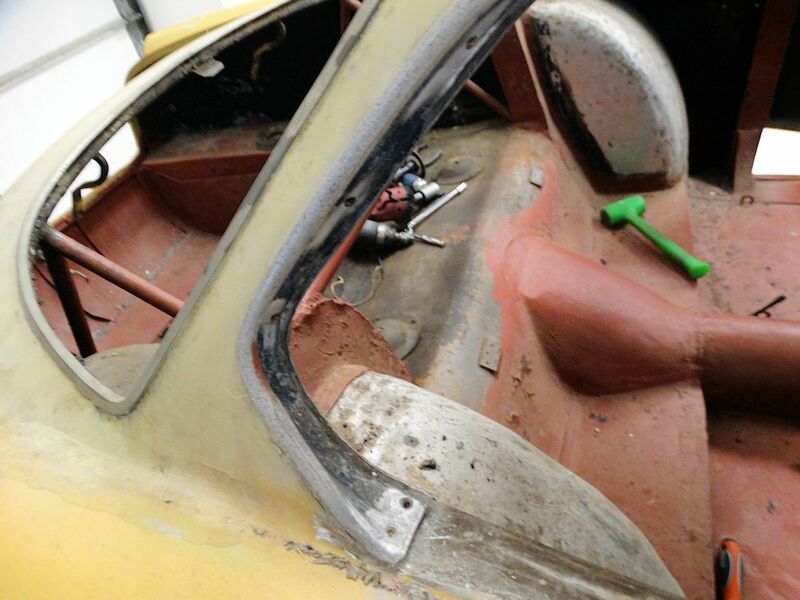 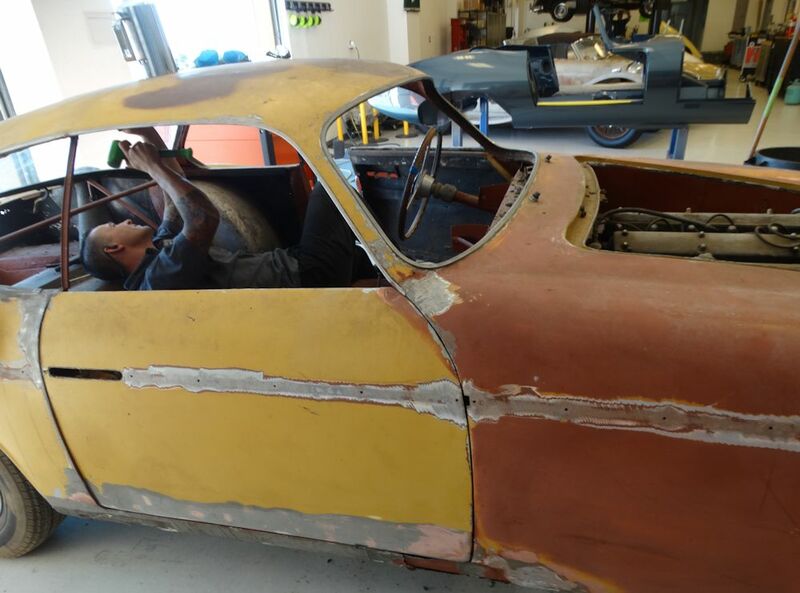 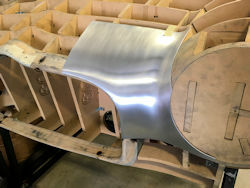 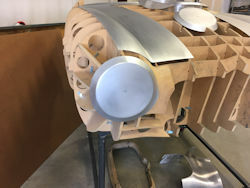 Edward has now finished shaping and metal finishing the second panel and has begun working on the transition panel at the top of the left front wing to the bonnet opening. 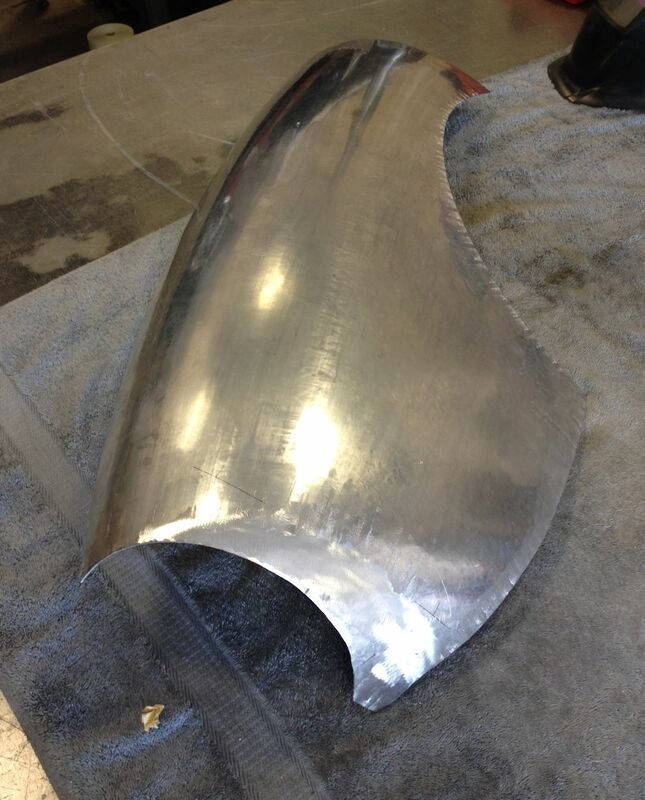 Edward has now made a start fabricating the new left front wing. 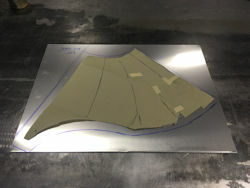 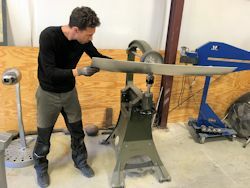 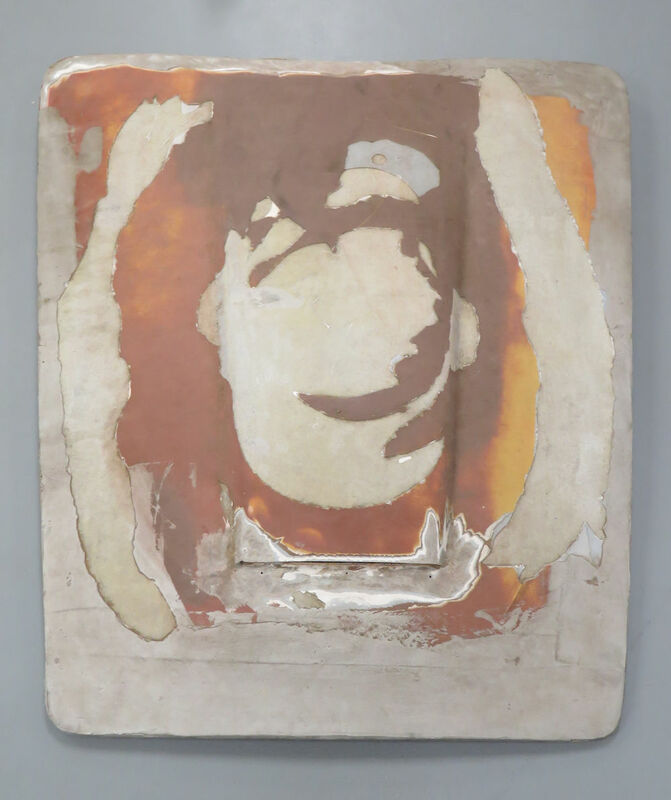 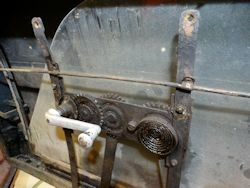 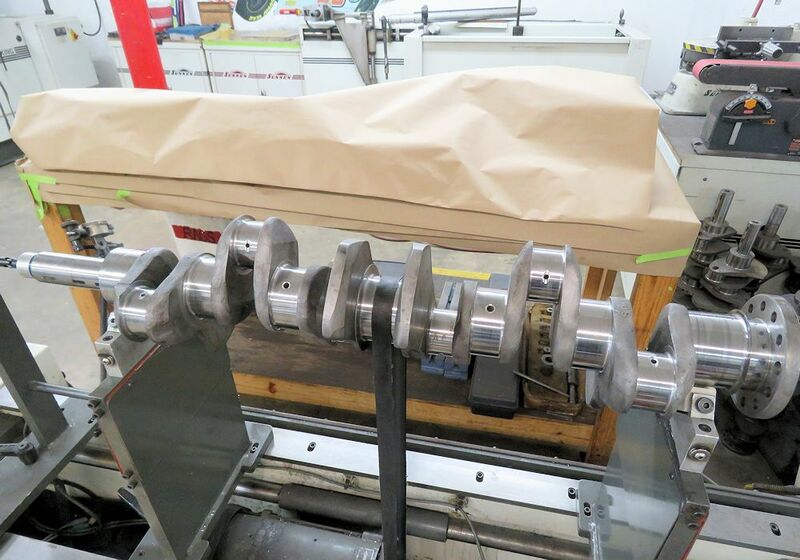 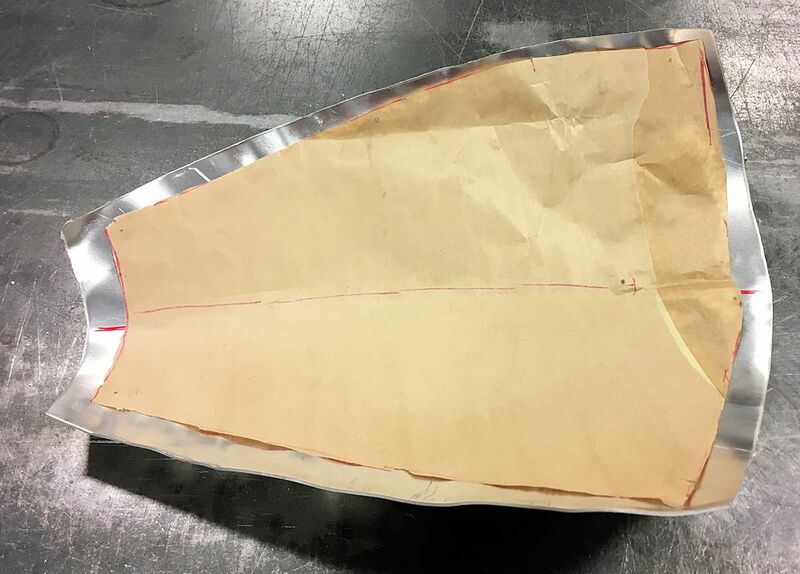 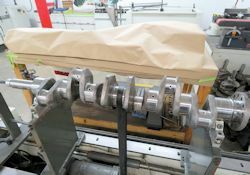 In the photos below you can see how he first creates a paper template which is then transferred to the alloy sheet, which is then worked with the English wheel and planishing hammer until it follows the contour and form of the station buck. 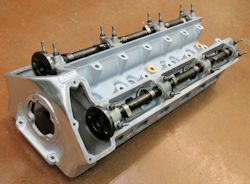 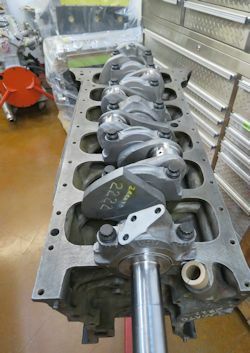 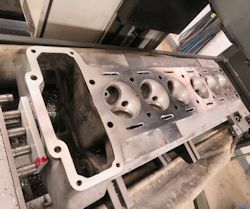 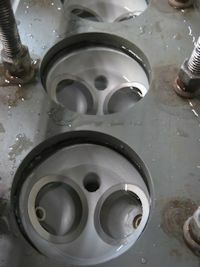 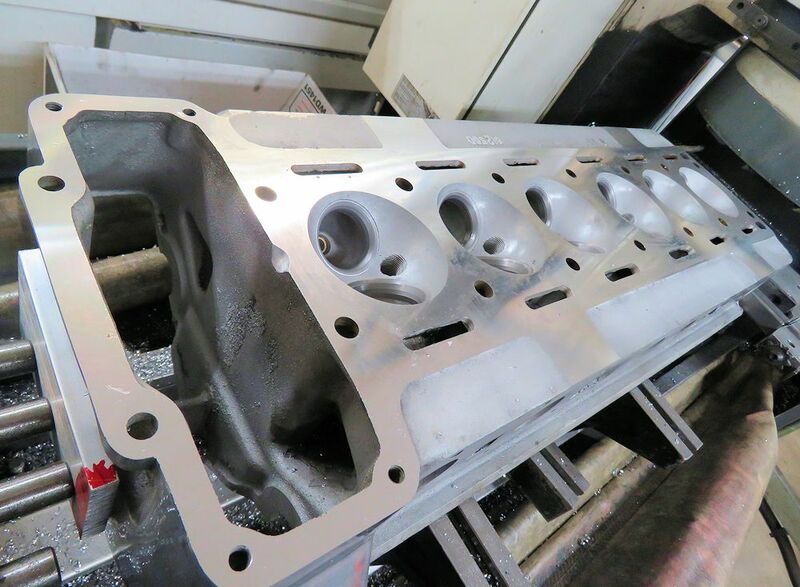 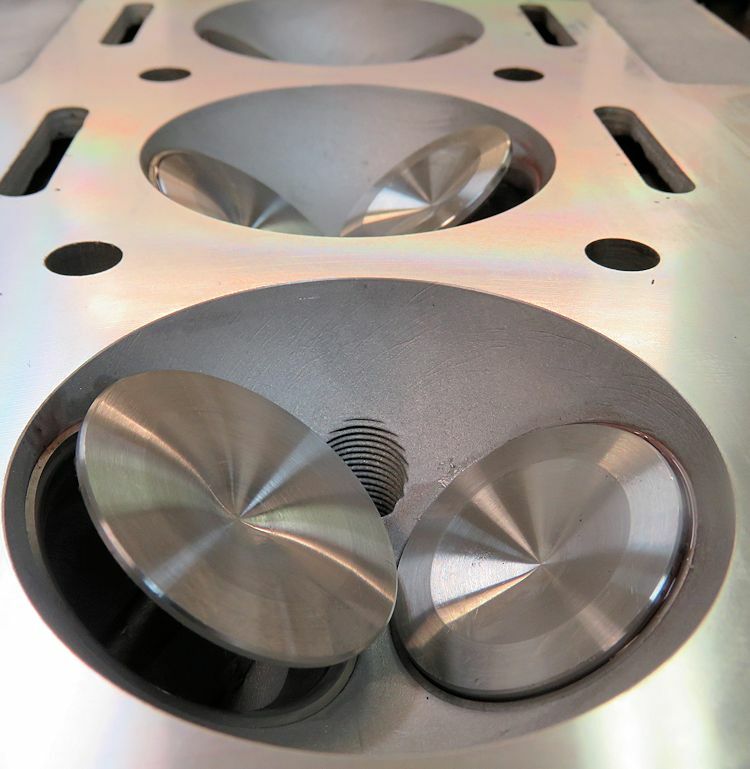 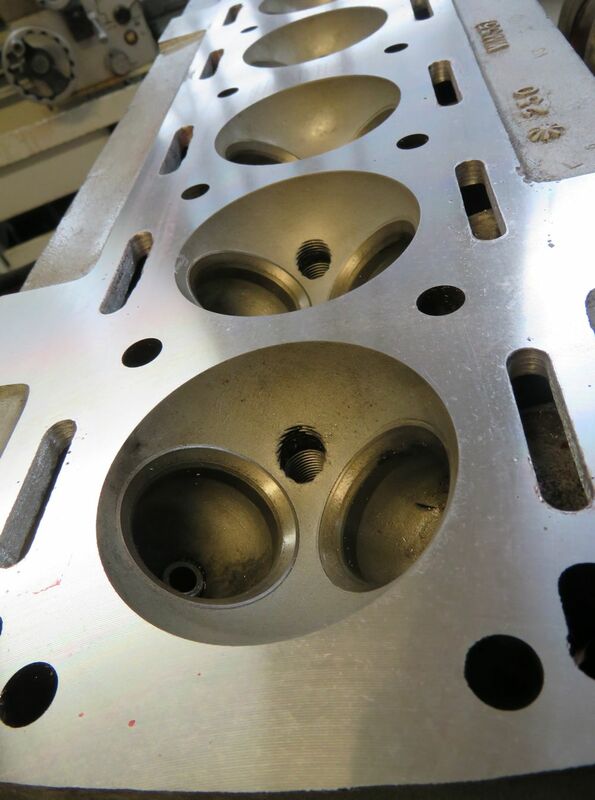 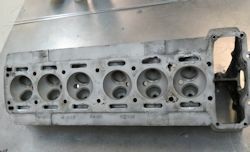 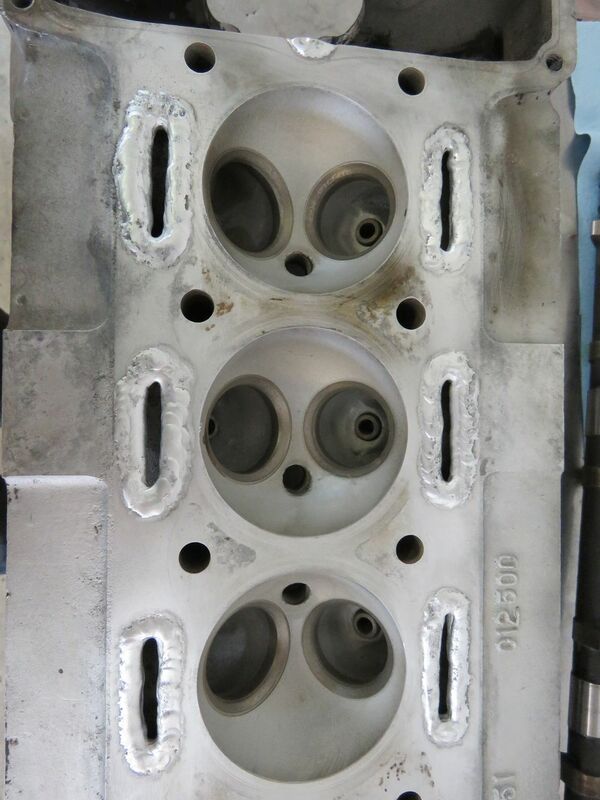 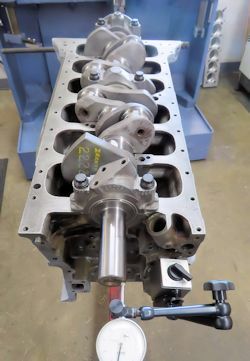 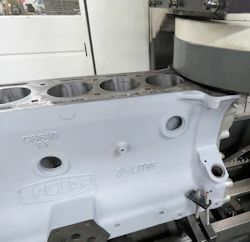 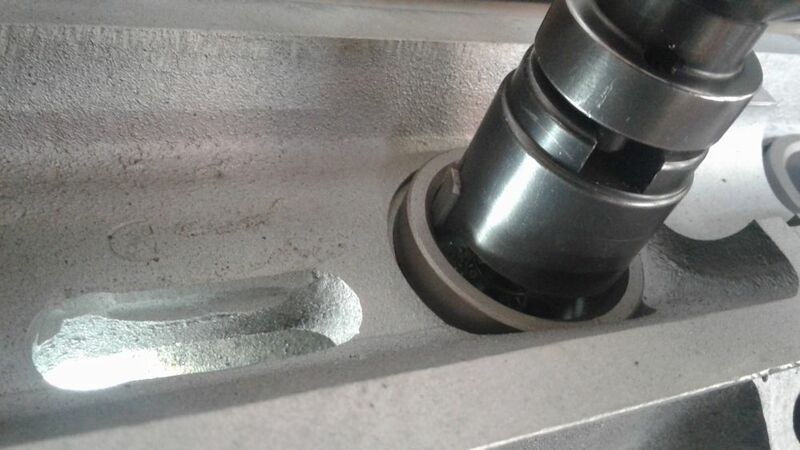 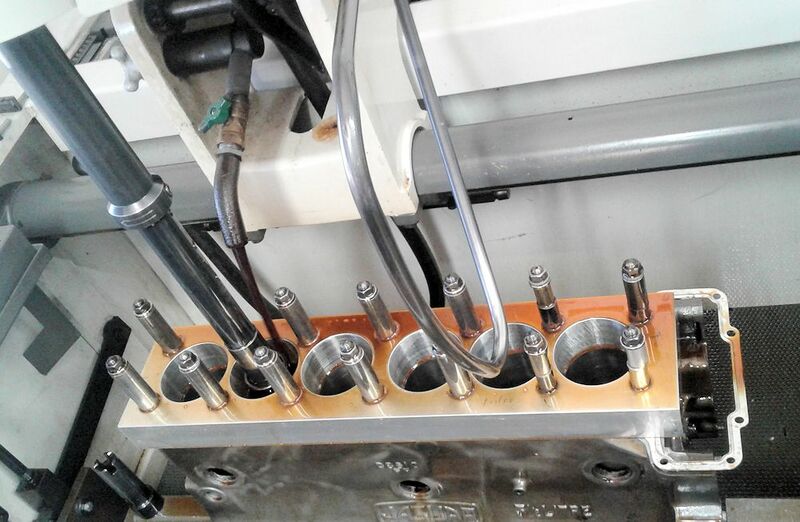 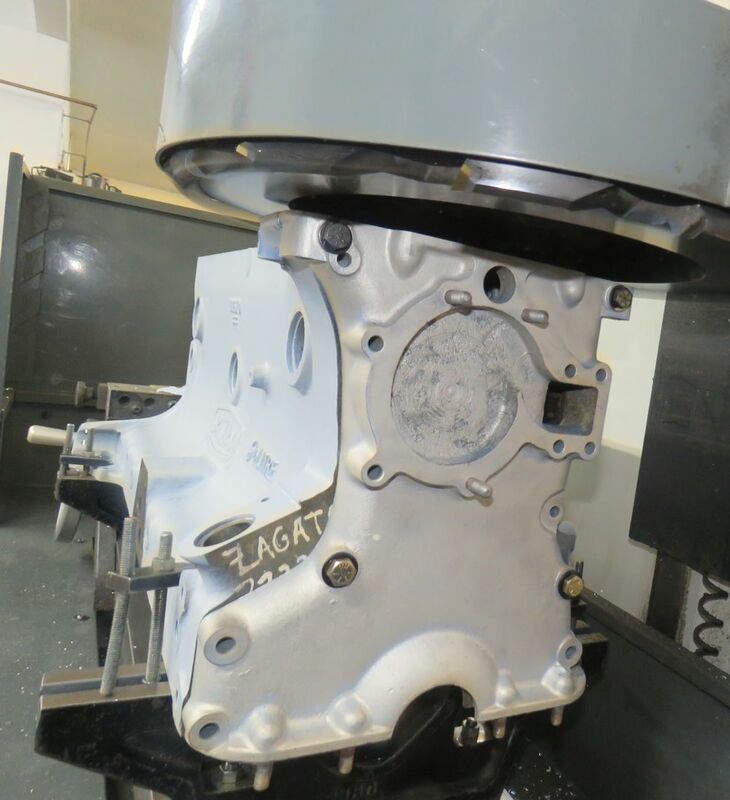 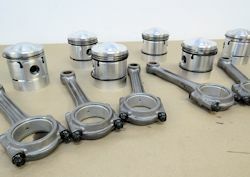 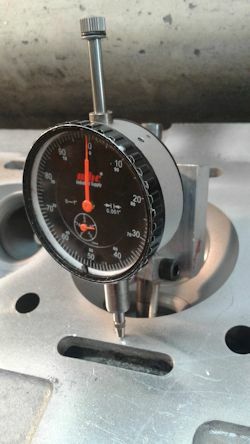 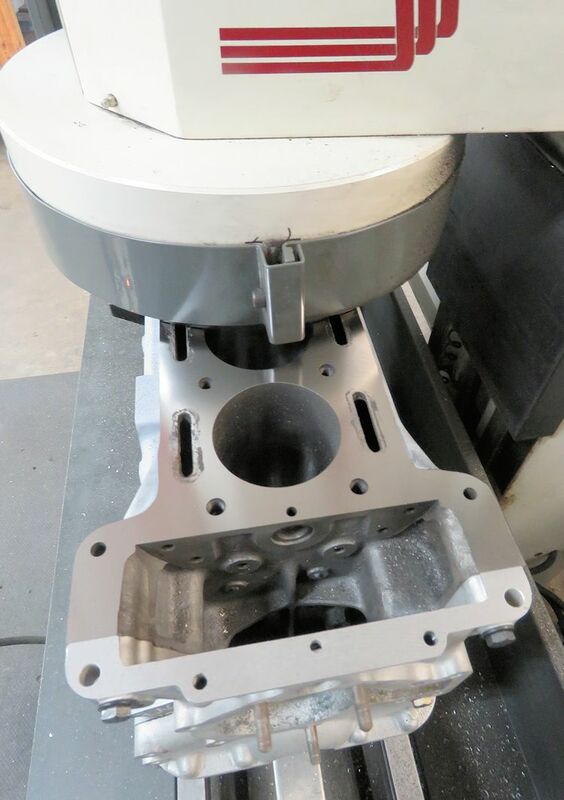 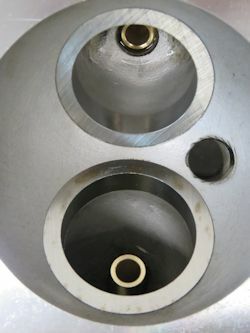 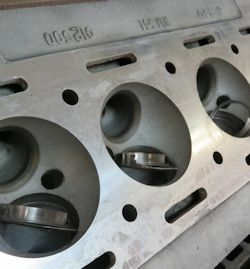 I am pleased to report that we have now completed our rebuild of the Zagato cylinder head. 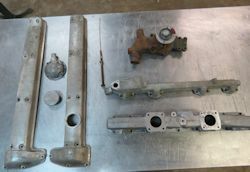 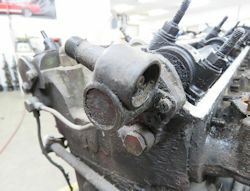 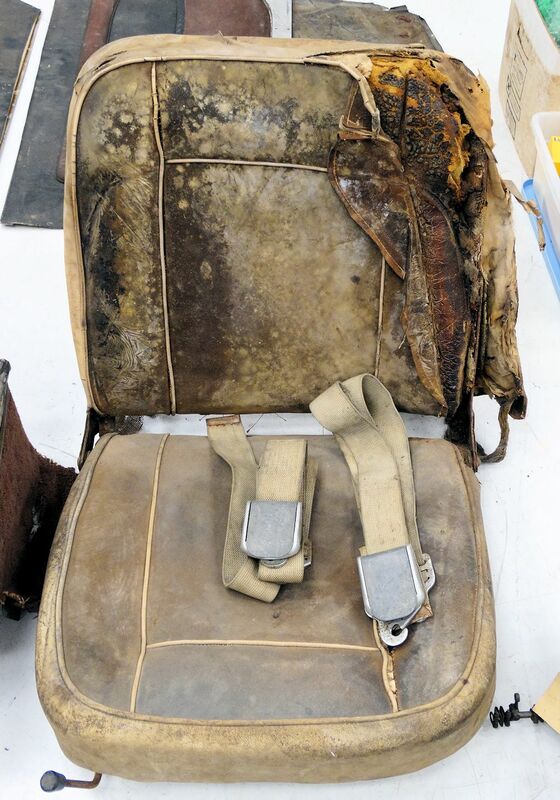 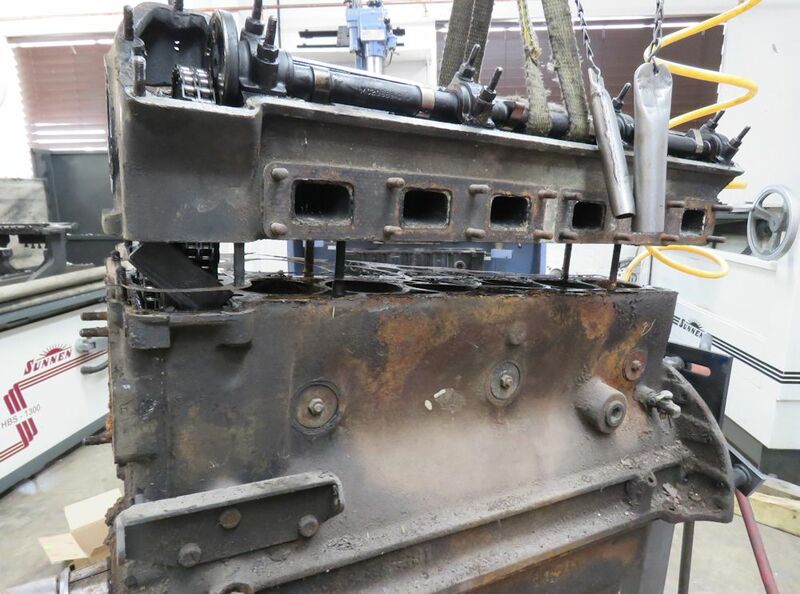 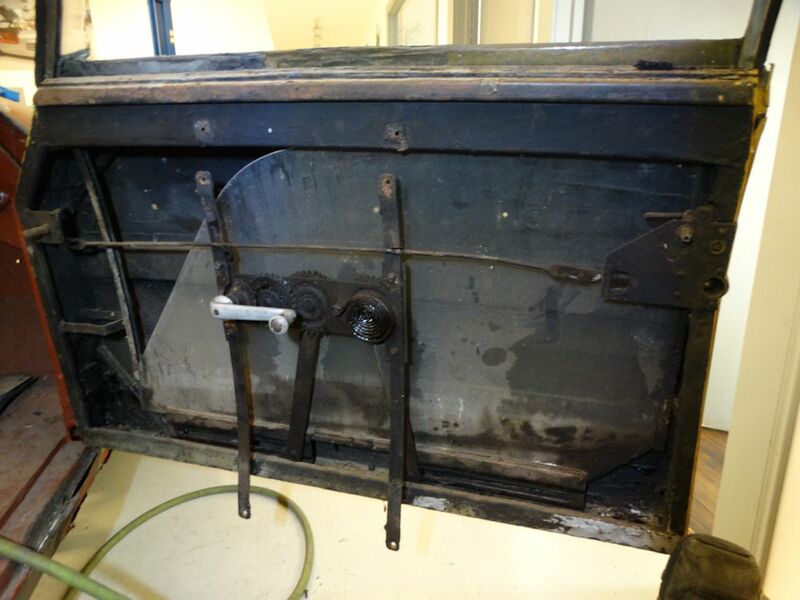 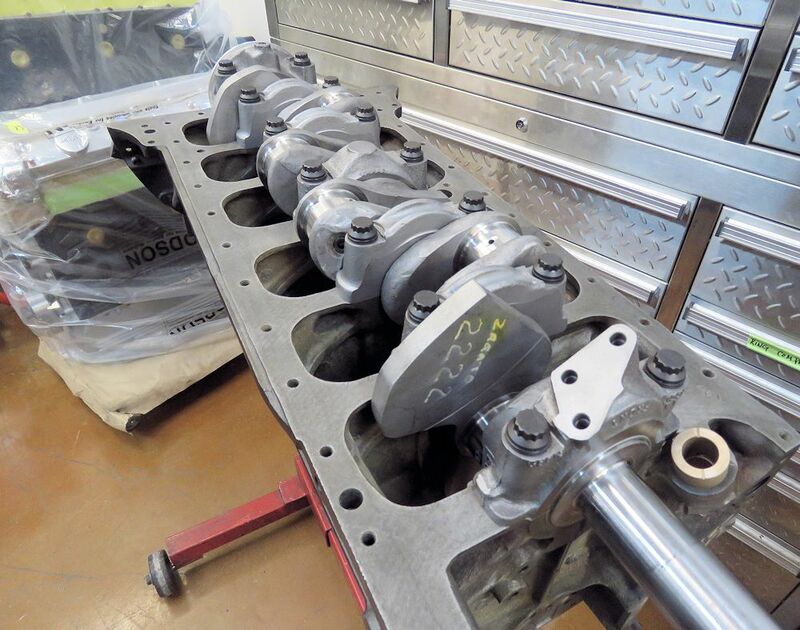 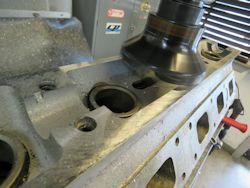 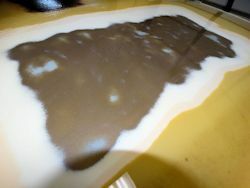 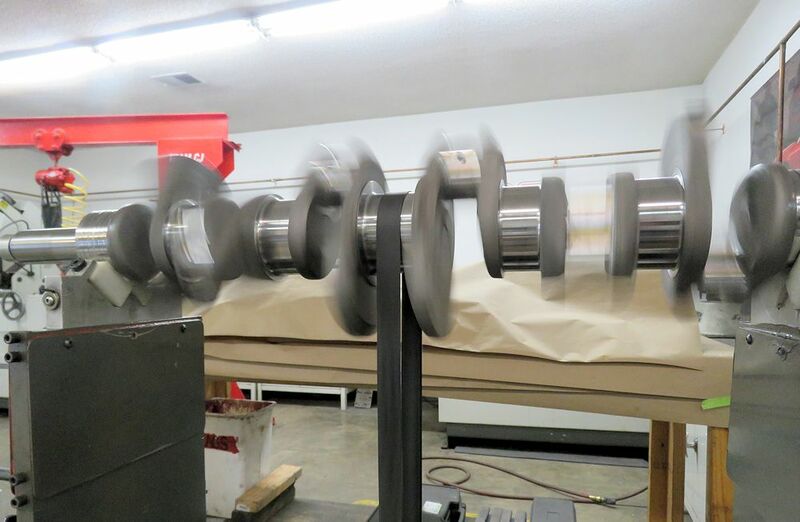 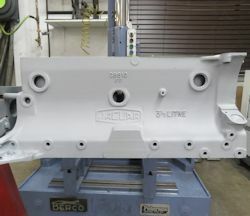 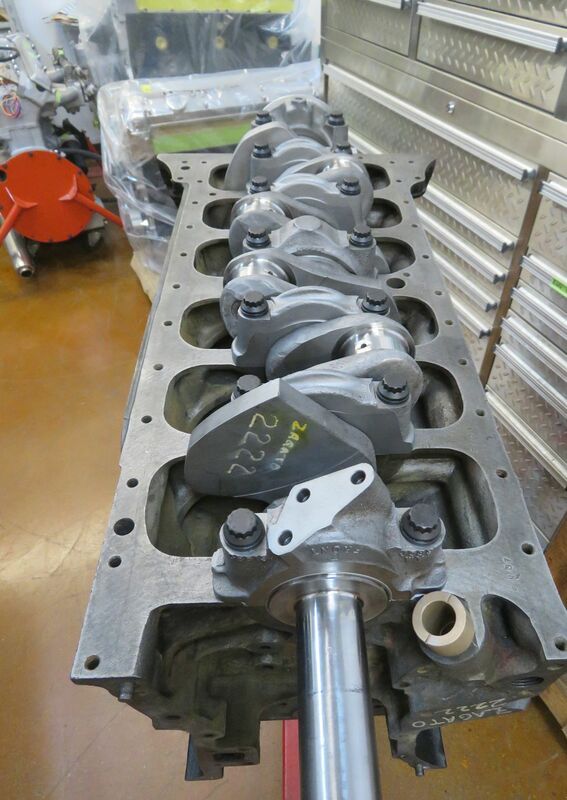 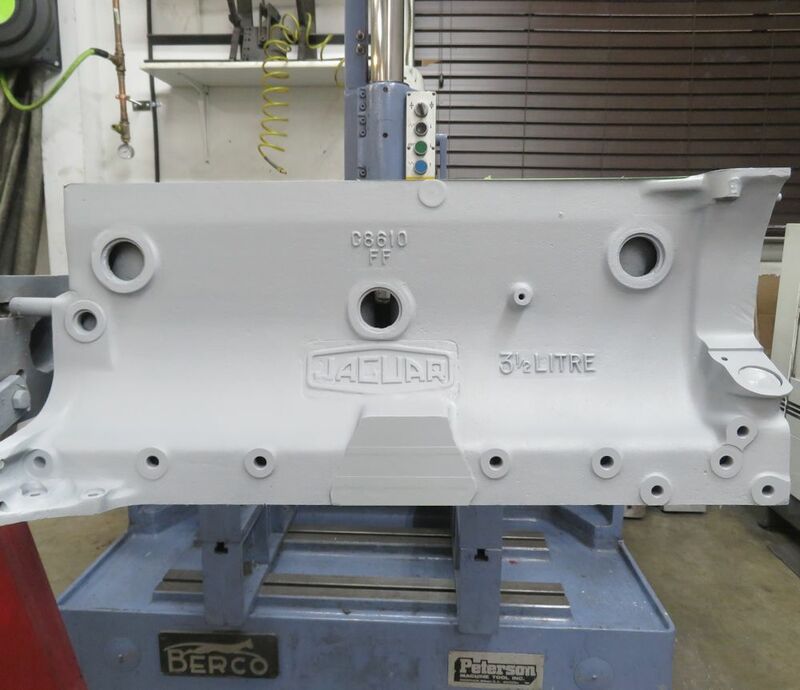 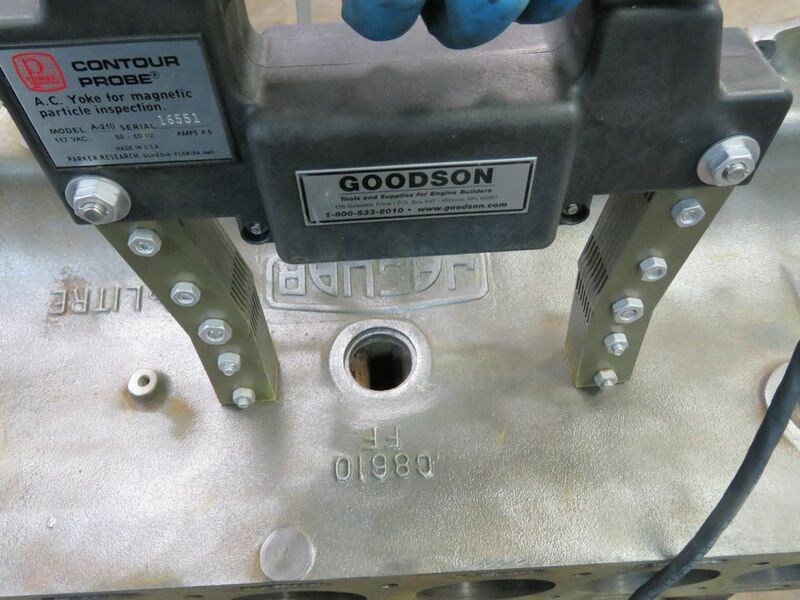 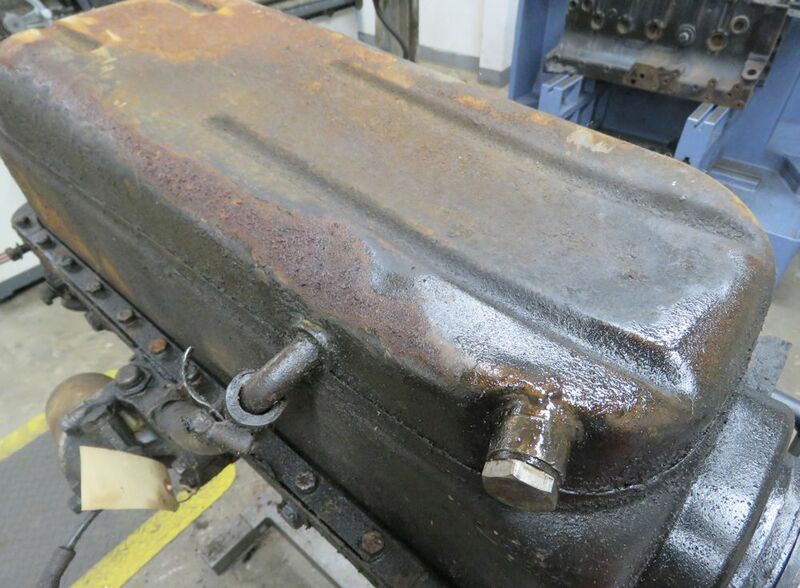 The block is going to be cleaned and degreased using an industrial acid dipping process in the next few days. 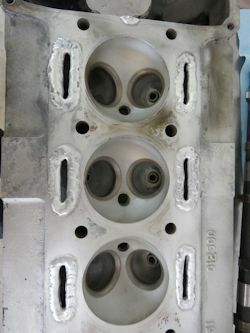 Great before and after photos with this head! 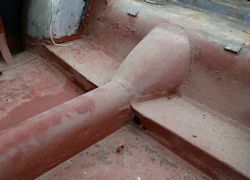 Deck surface now looking much better! 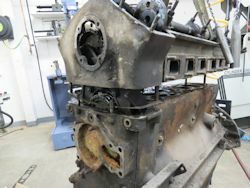 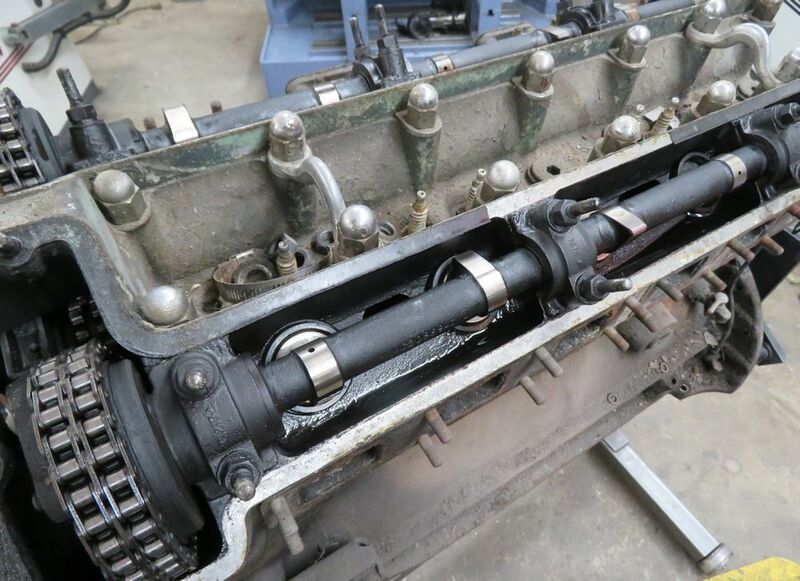 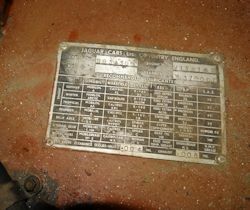 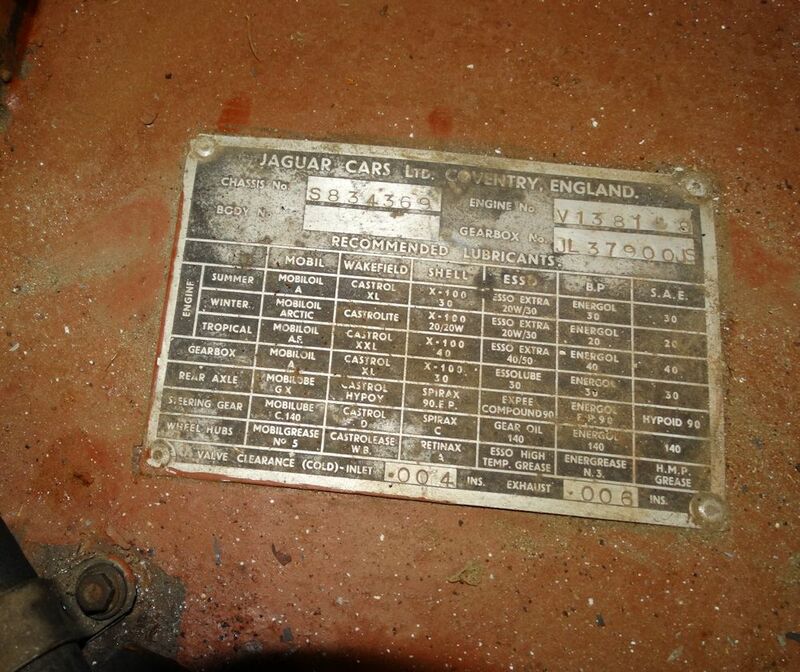 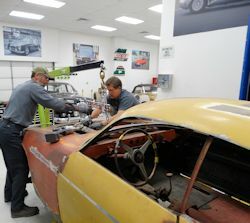 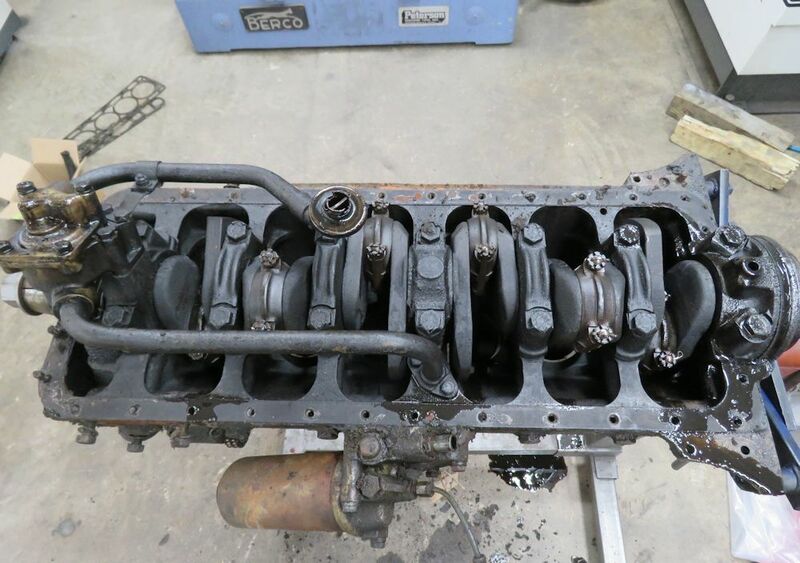 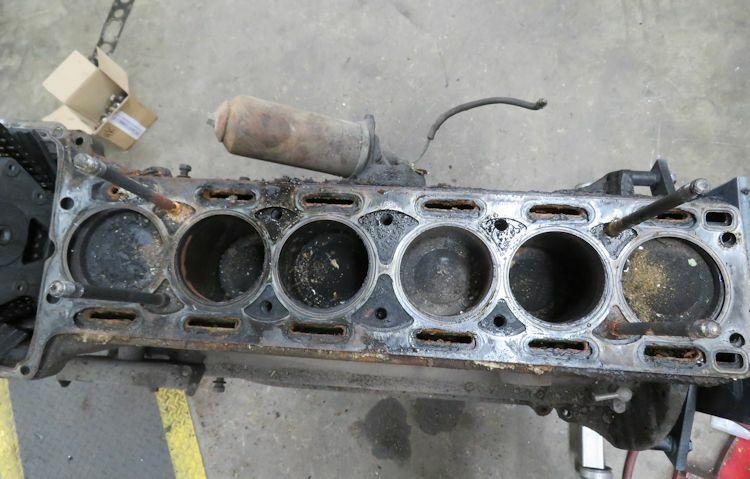 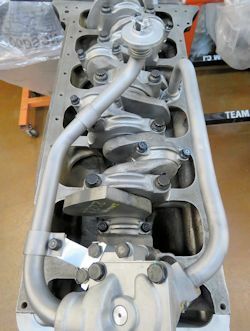 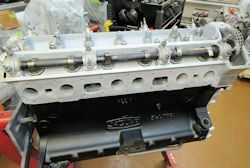 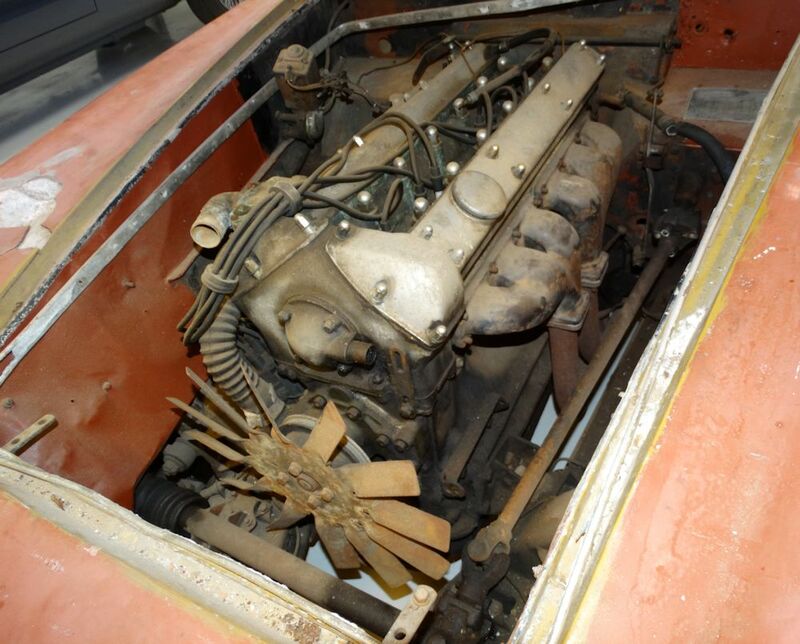 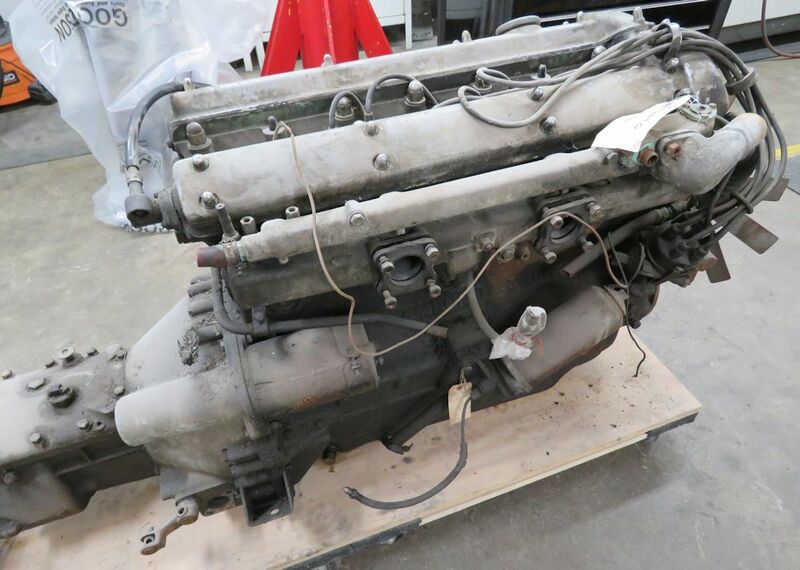 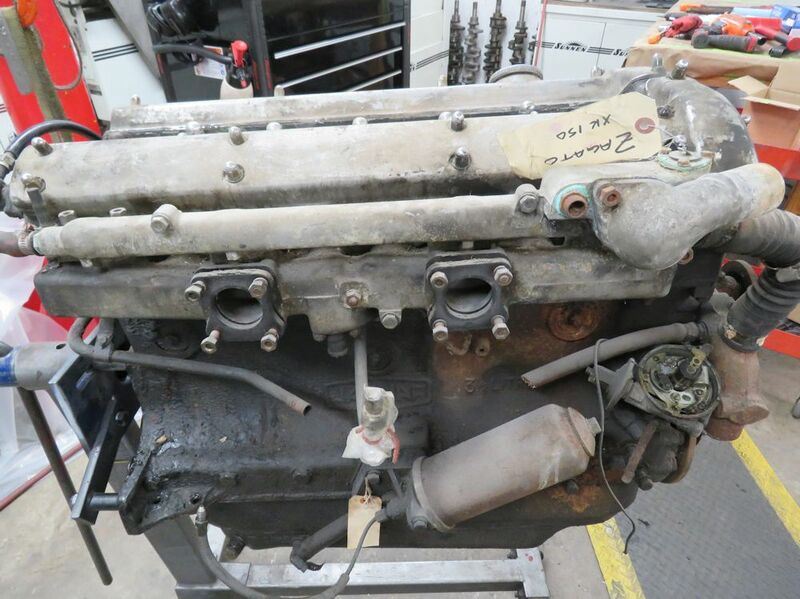 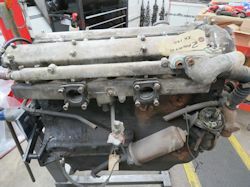 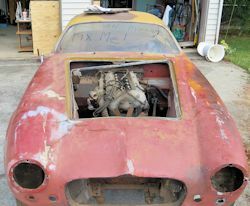 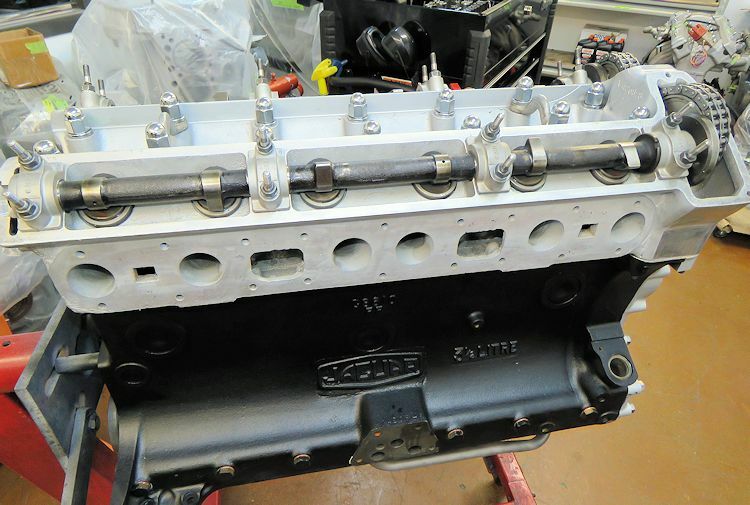 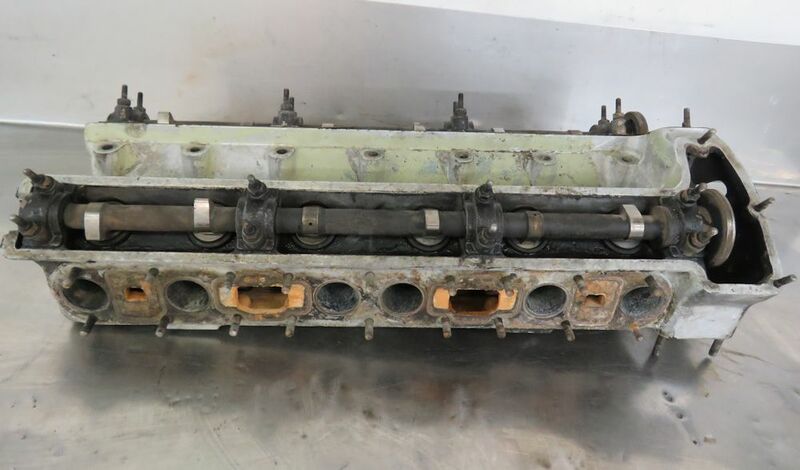 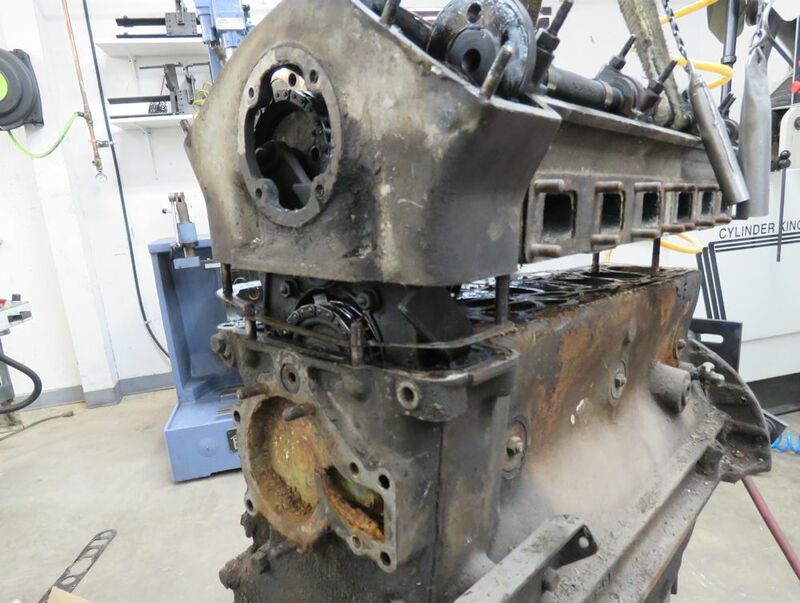 I am pleased to report that we now have your Zagato (XK150) engine rebuild well underway. 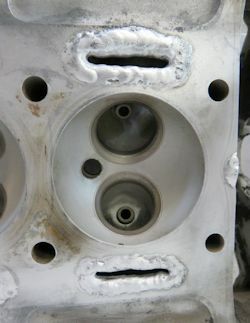 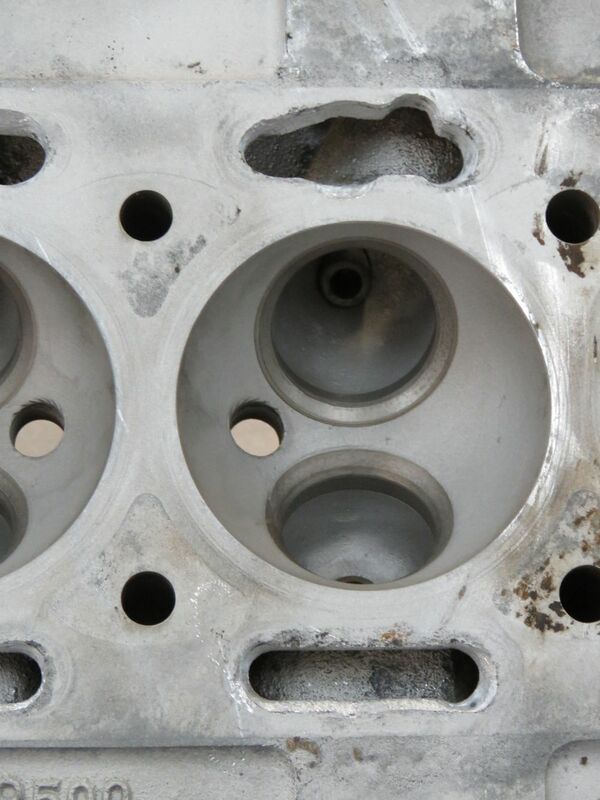 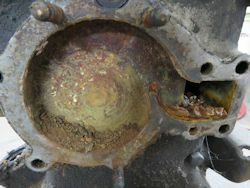 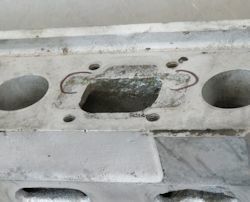 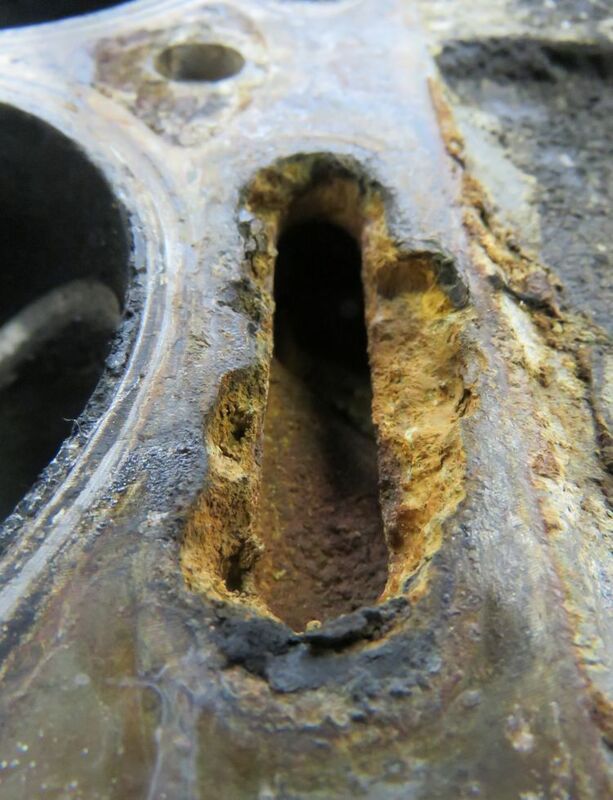 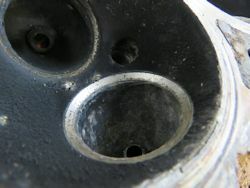 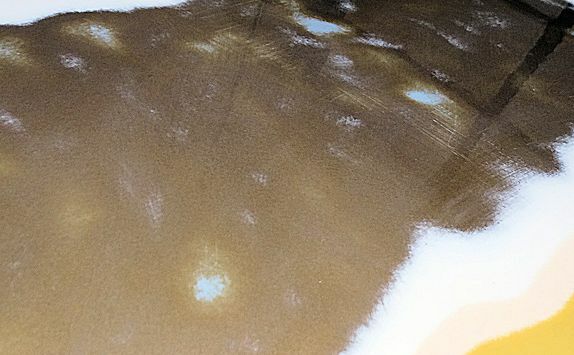 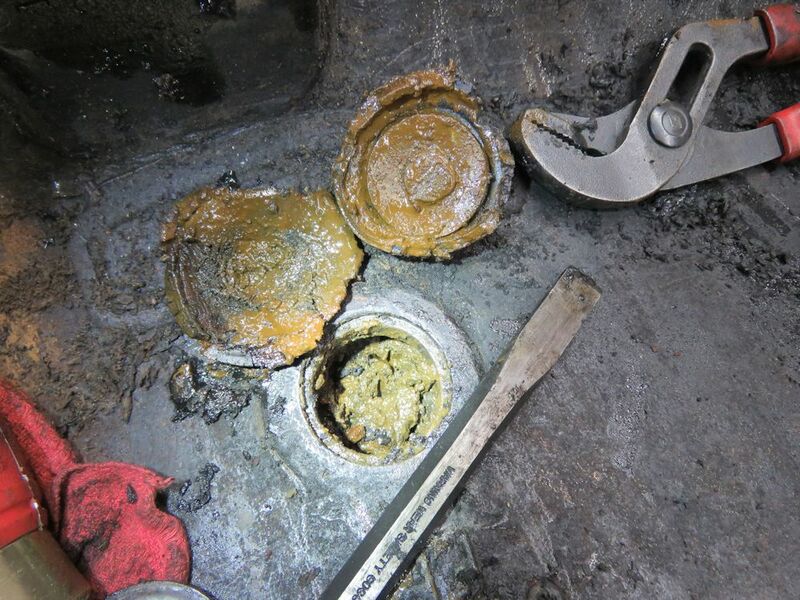 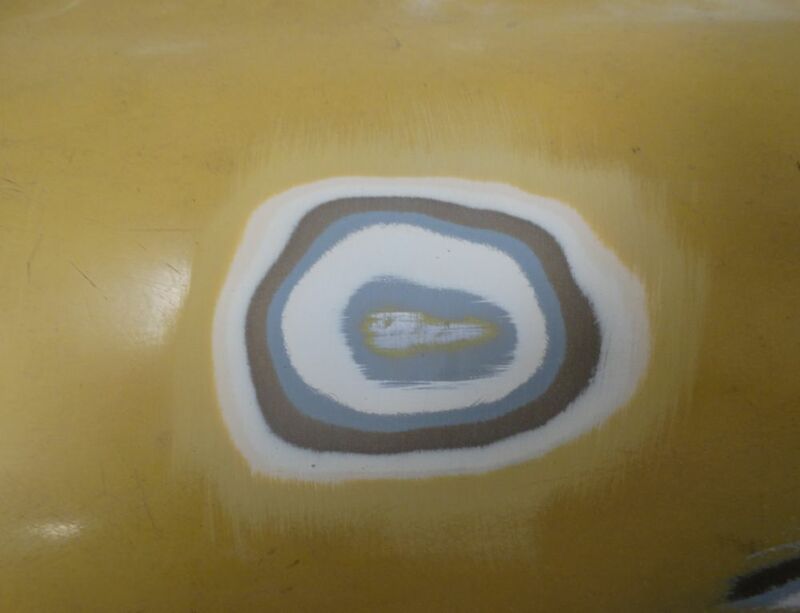 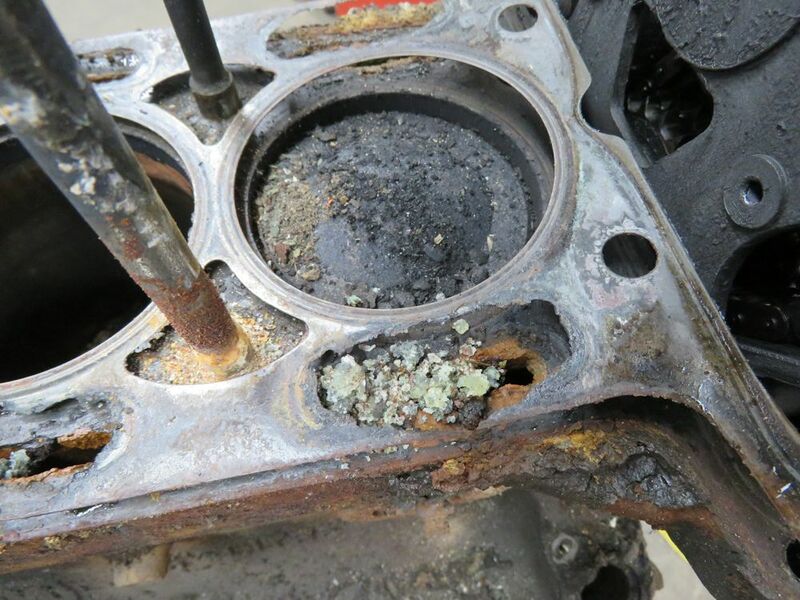 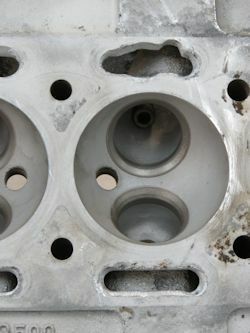 Unfortunately the cylinder head has suffered severe corrosion around the water jackets of the deck, and the block is about as gunged up with nasty deposits as any we have ever seen! Having said that, everything will be better than new once we have finished our work. I hope you enjoy watching the work progress. 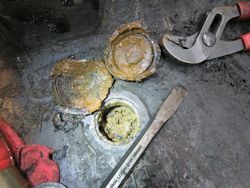 As bad as we have seen! 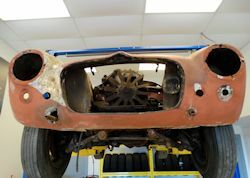 I am pleased to report that the station buck for the front of the Zagato has now been completed. 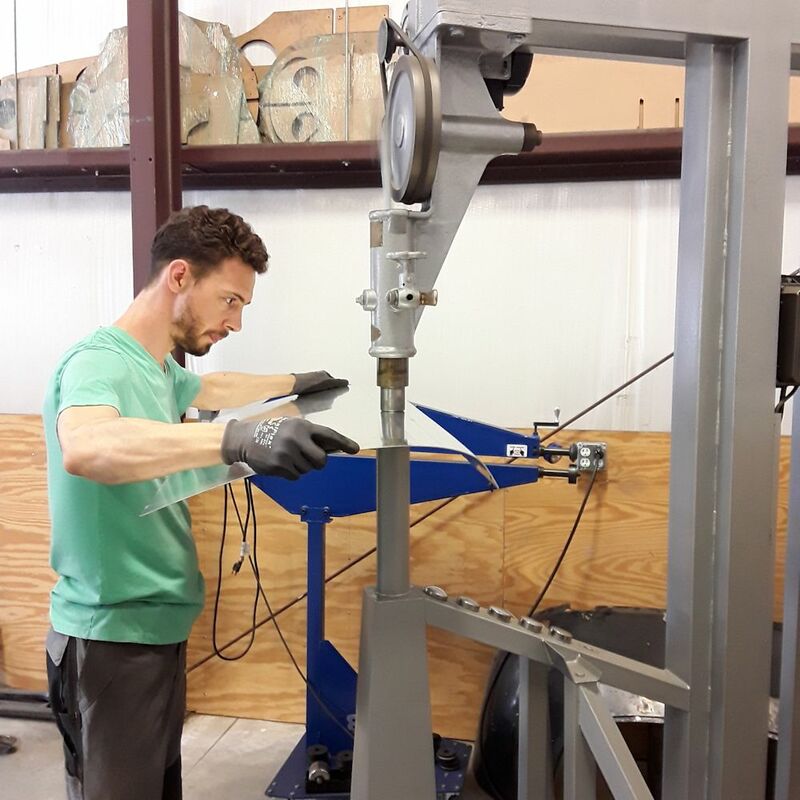 Edward is almost finished assembling the station buck. 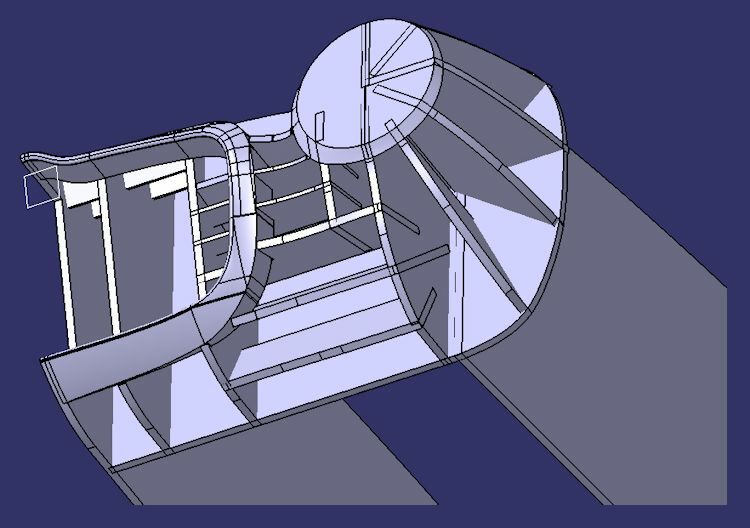 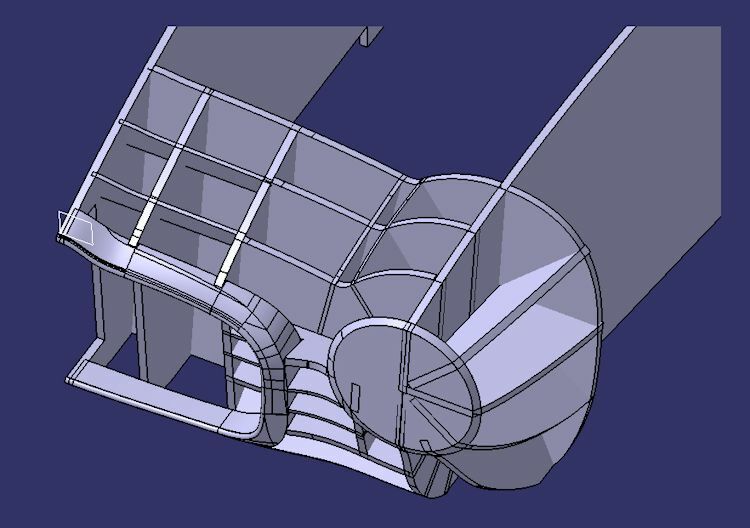 The following images are screen shots of Edward's station buck design, which is nearing completion. 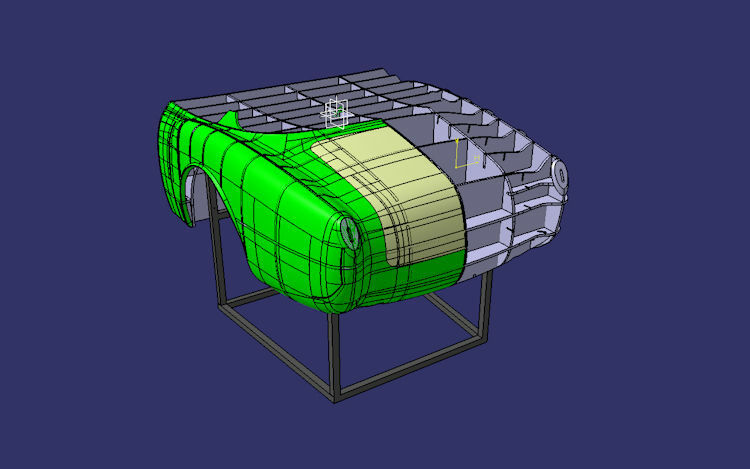 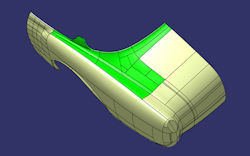 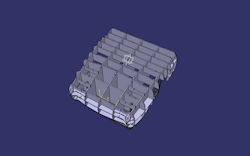 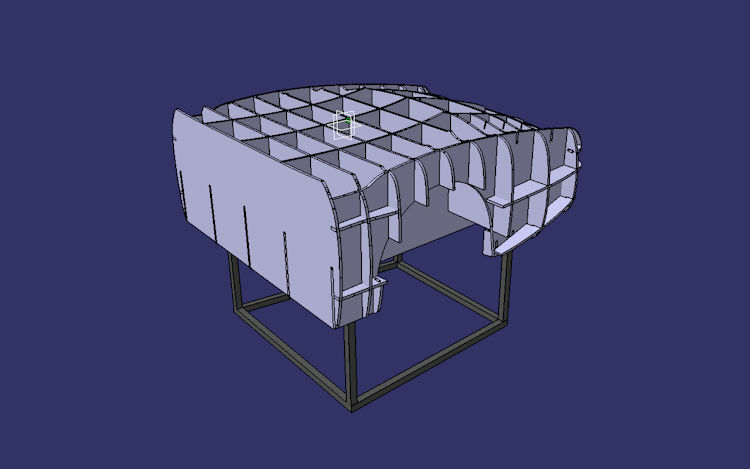 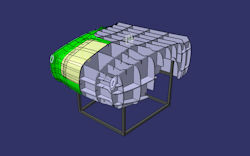 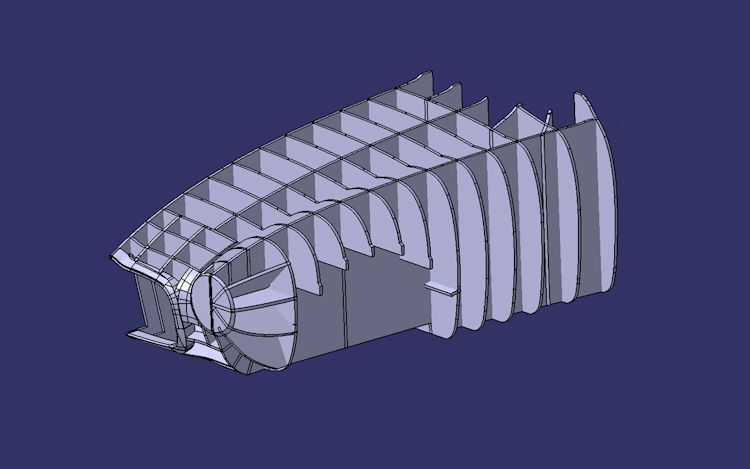 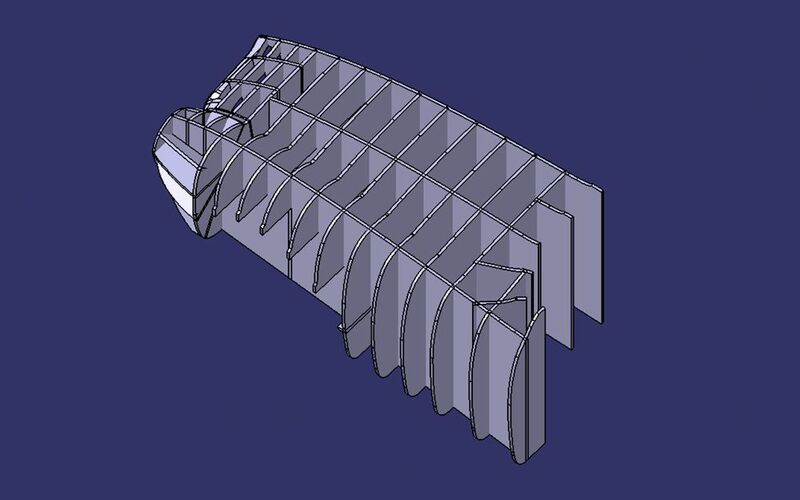 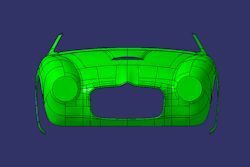 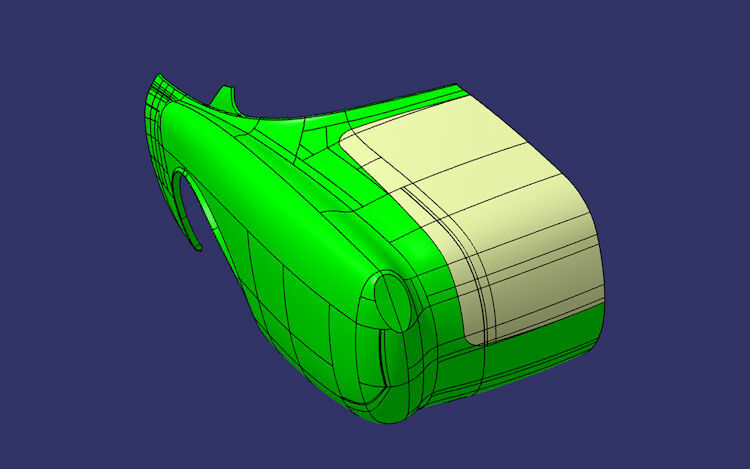 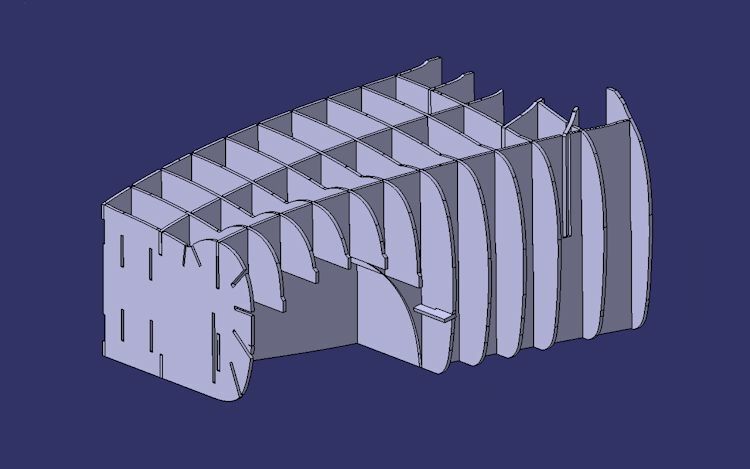 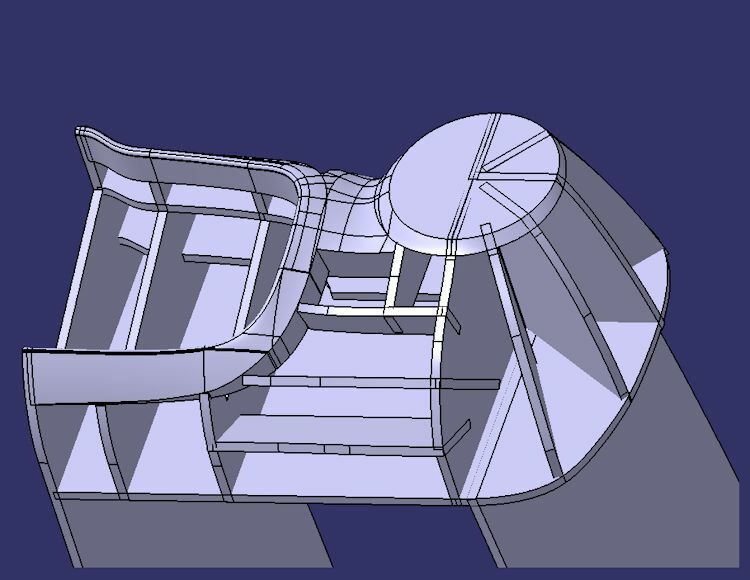 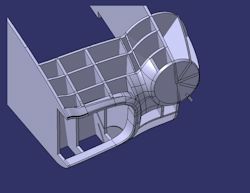 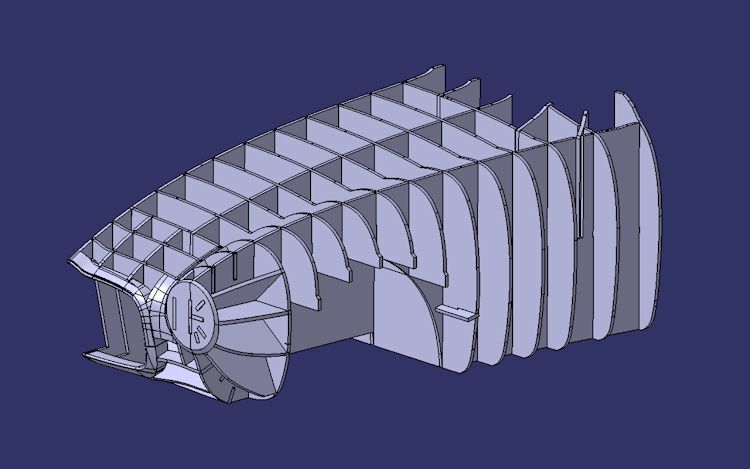 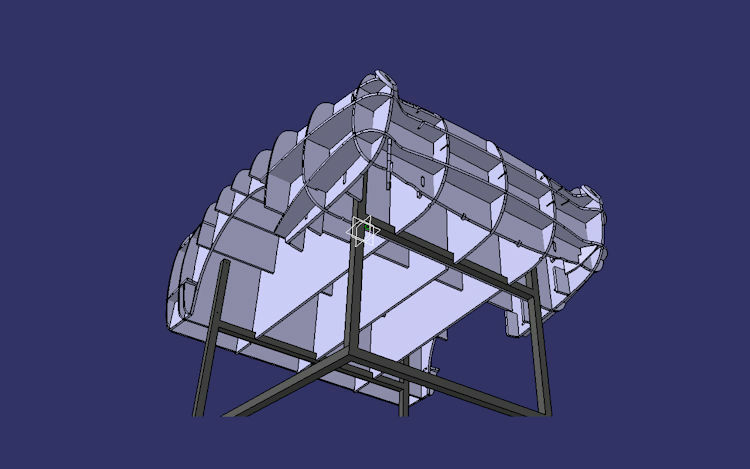 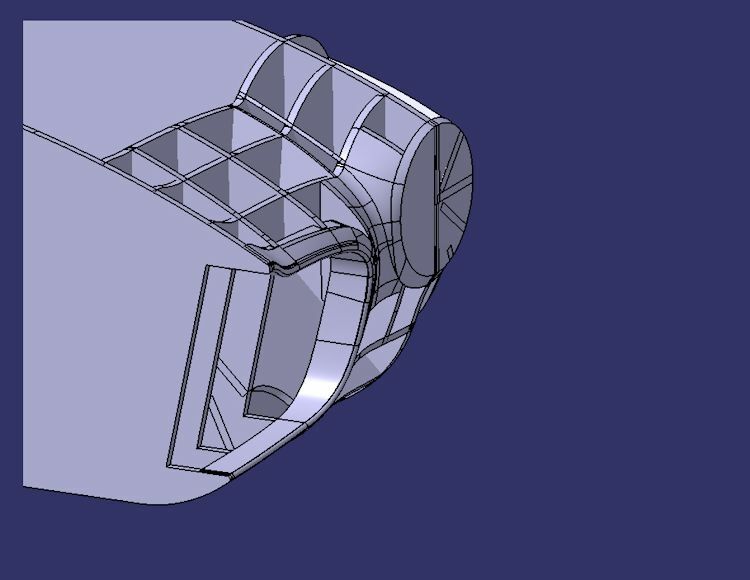 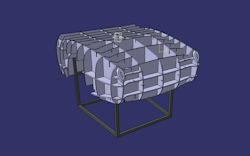 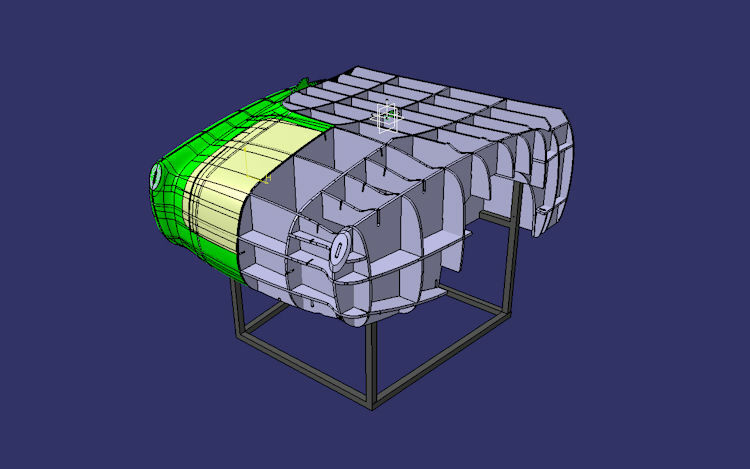 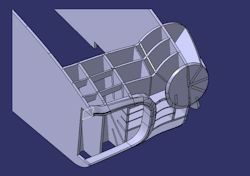 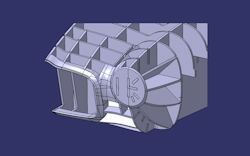 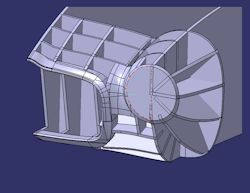 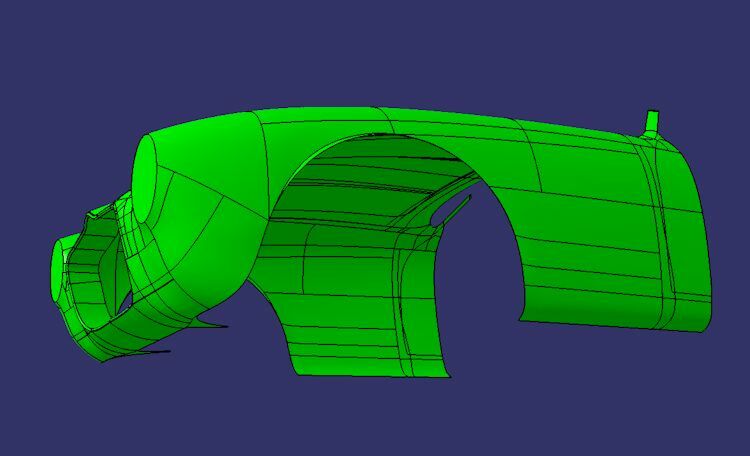 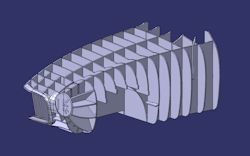 Edward has now finished the CAD model of the entire front end and has trued all surfaces. Next up is the design of the station buck, which is already underway. 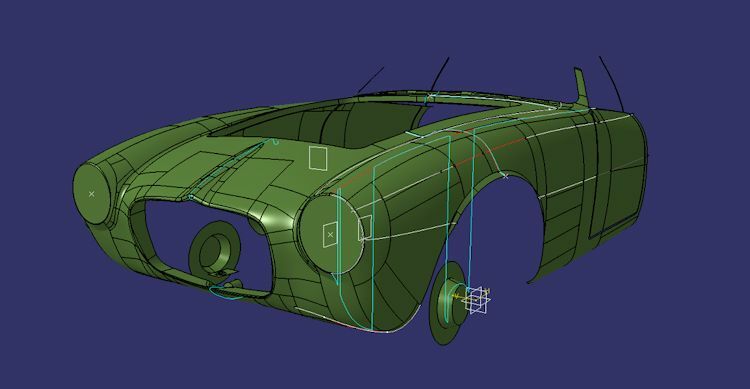 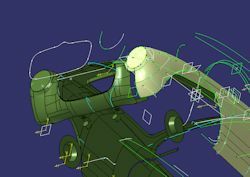 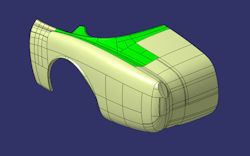 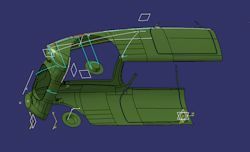 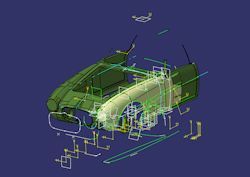 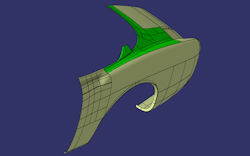 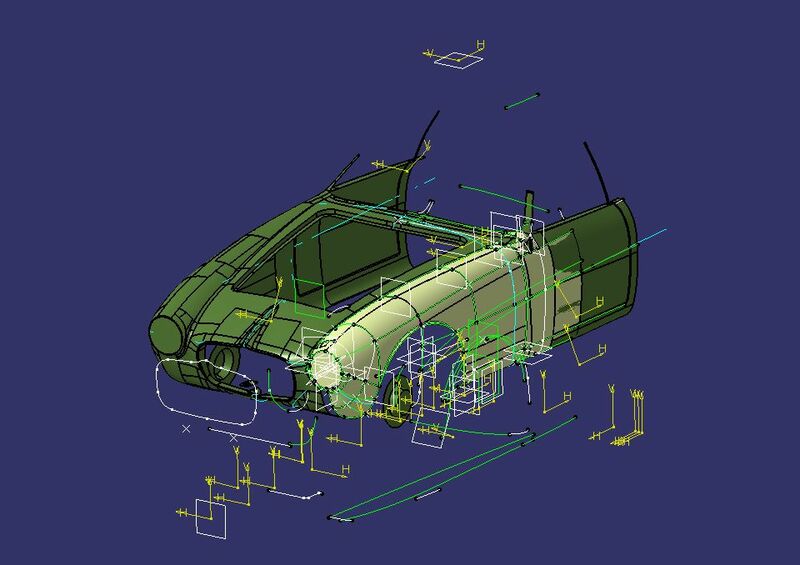 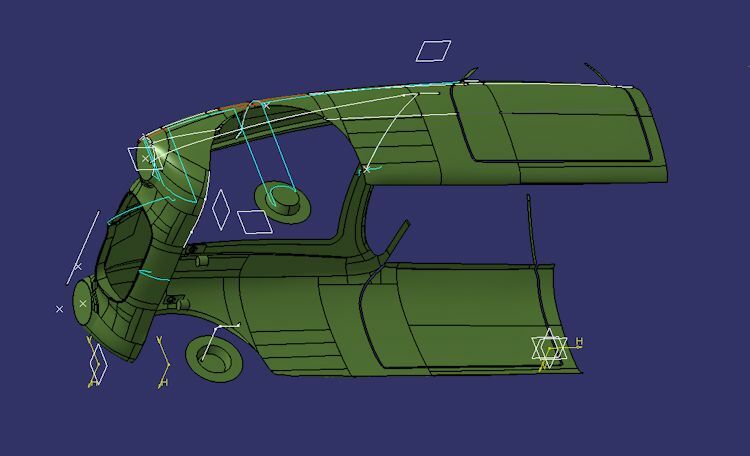 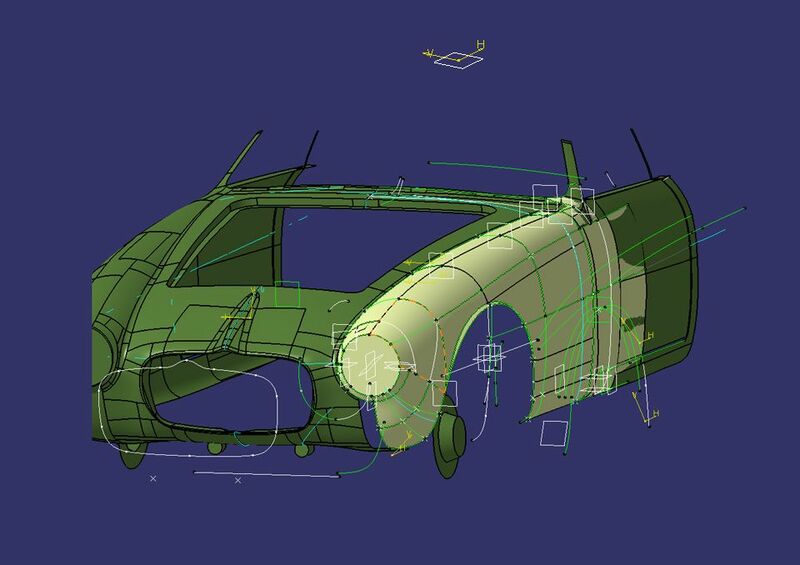 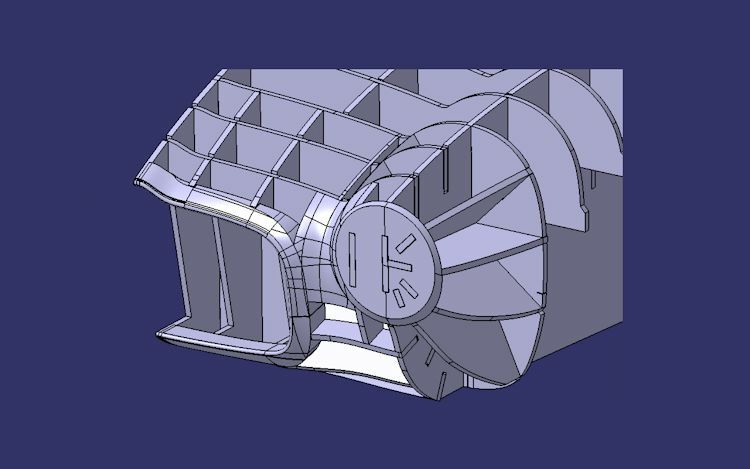 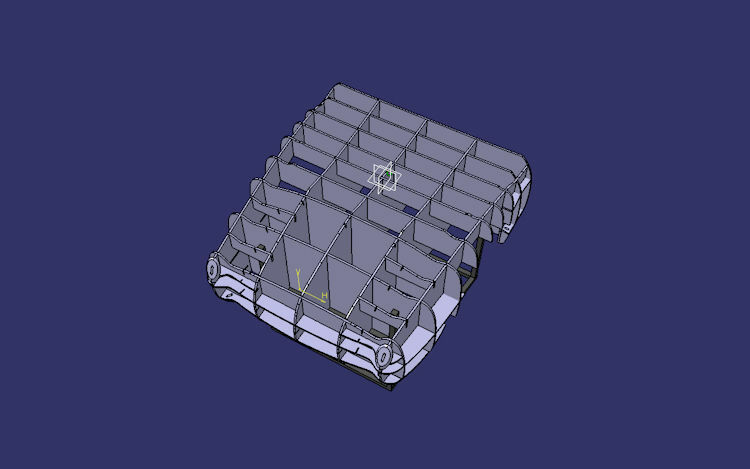 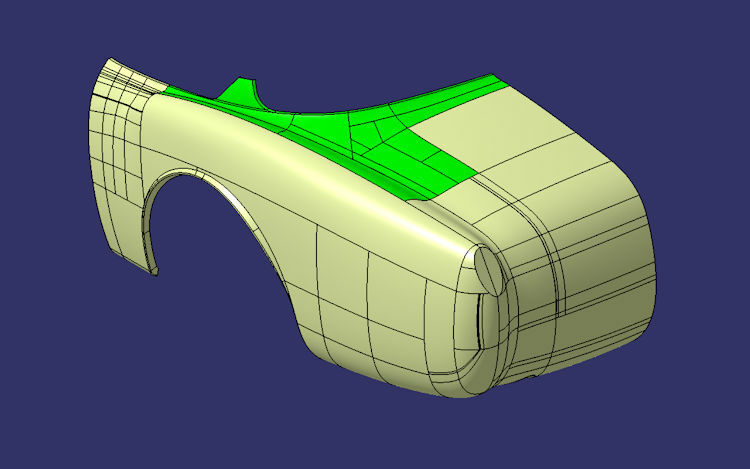 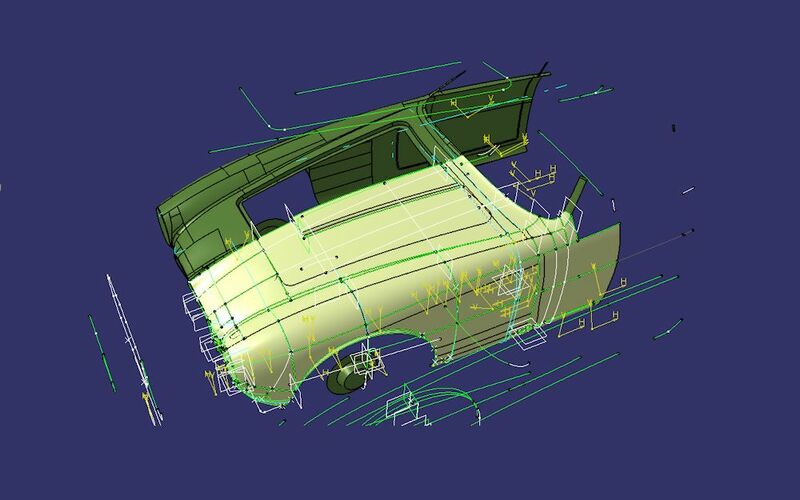 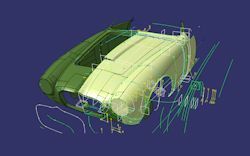 Slowly but surely, the front end of the car is taking shape in Edward's CAD drawing. 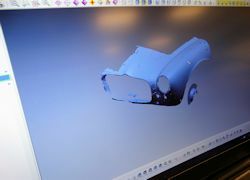 More screen shots of Edward's CAD design work. 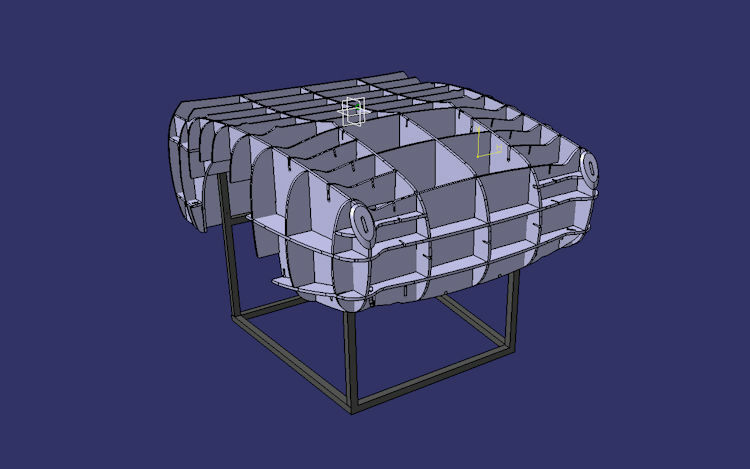 The following screenshot images show how Edward is using the raw scan data to produce a 3D model from which we can construct the station bucks needed to fabricate our new panels. 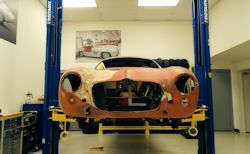 Today we are working with Mike Durham of Absolute Geometries to generate a 3D scan of the Zagato body. 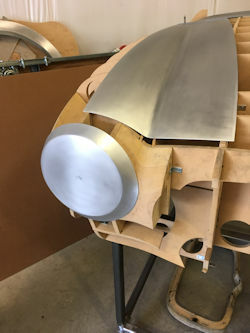 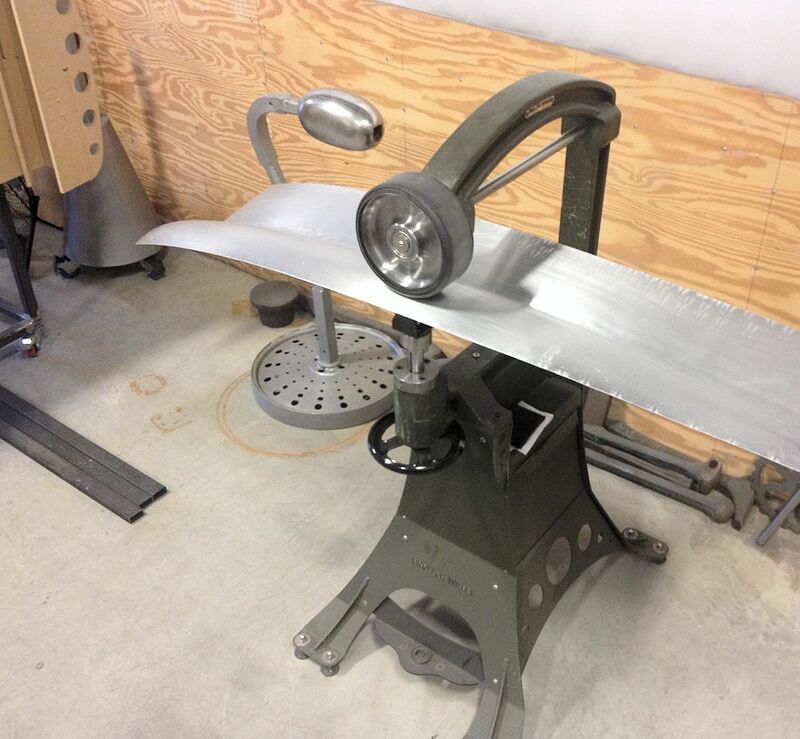 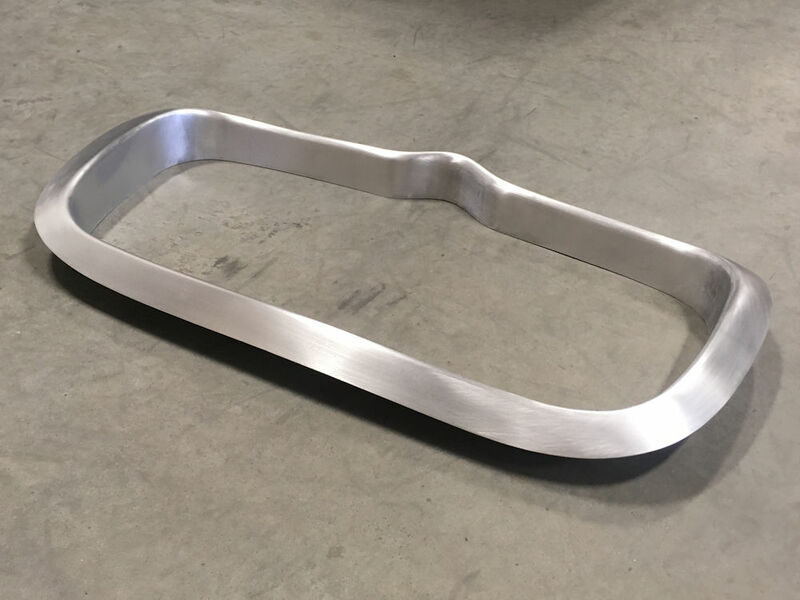 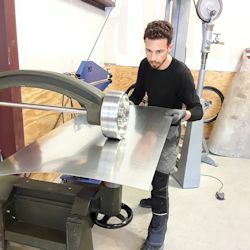 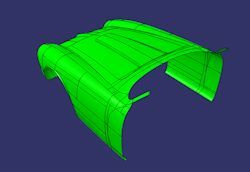 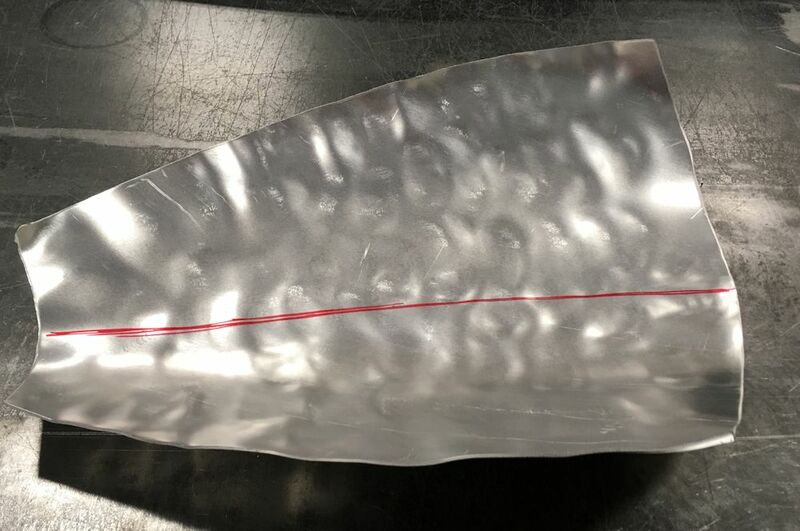 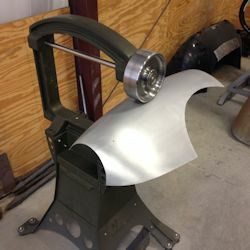 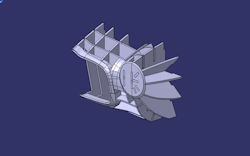 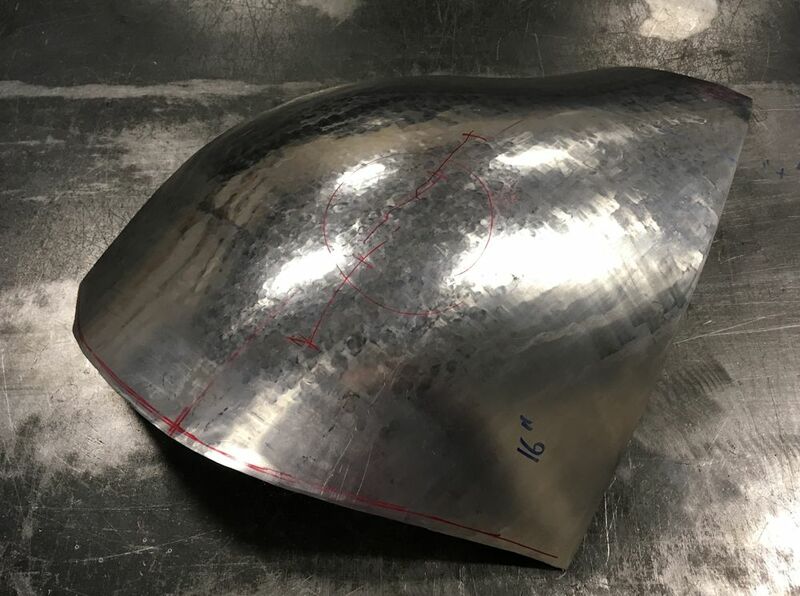 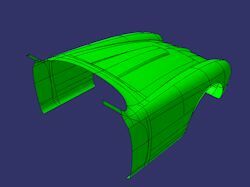 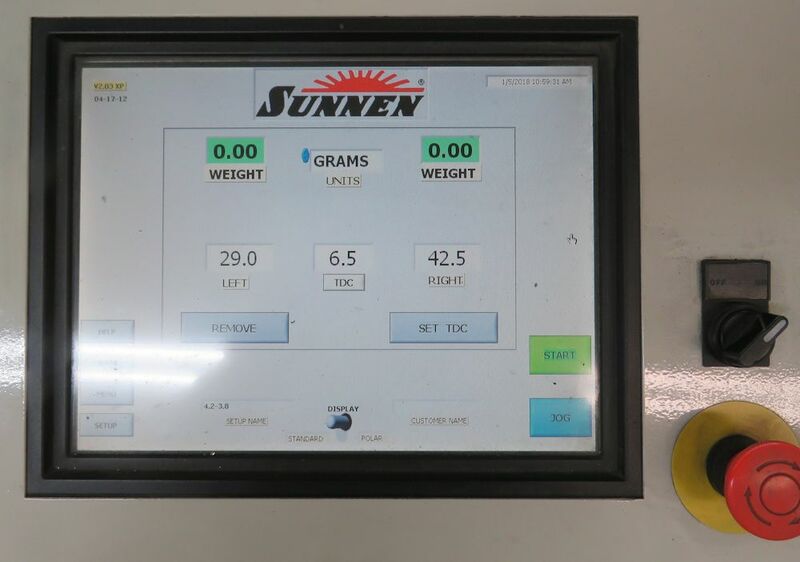 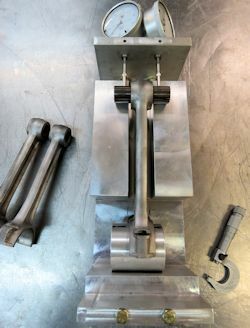 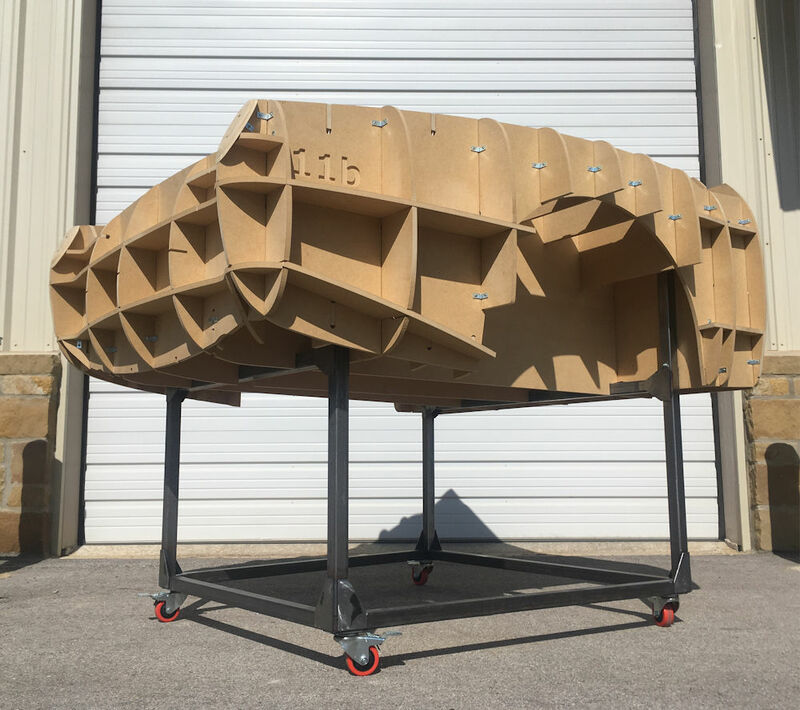 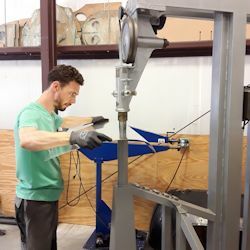 The scan will then be used by our friend Edward de Vaucorbeil of Extraordinary Metalshaping to produce a 3D CAD drawing from which we will be able to create the station (body) bucks we need to fabricate all of our replacement alloy panels. 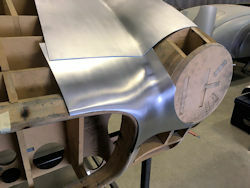 It is fascinating to watch this marriage of old world craftsmanship and computer aided design! Jake spent several hours re-aligning the front end bodywork and managed to move the nose almost an inch from the right towards the center line of the car. 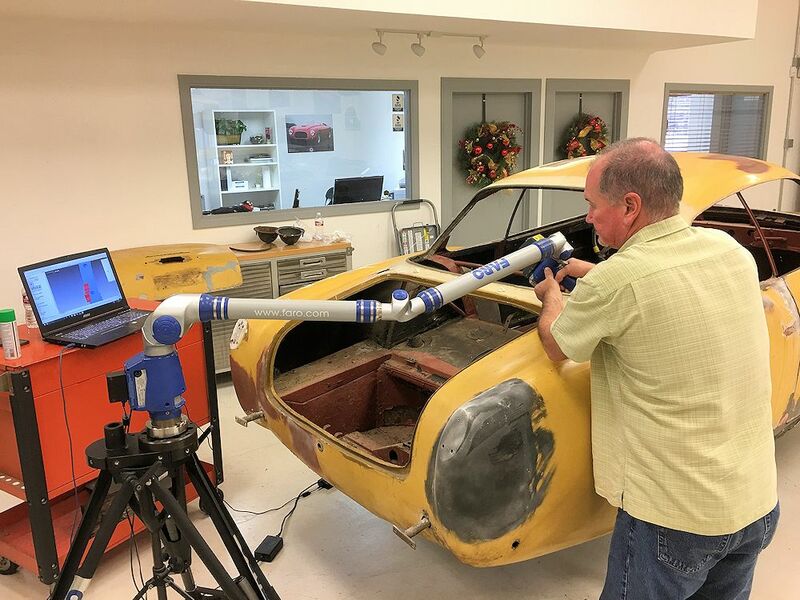 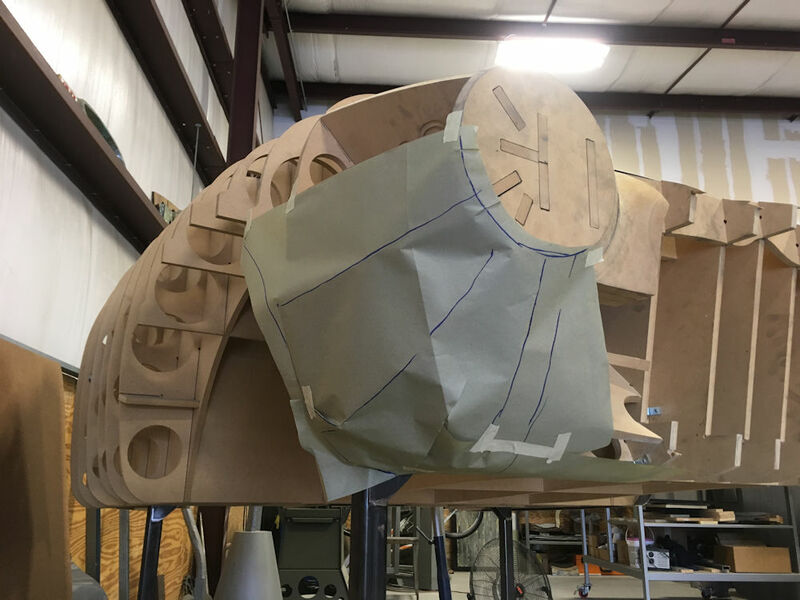 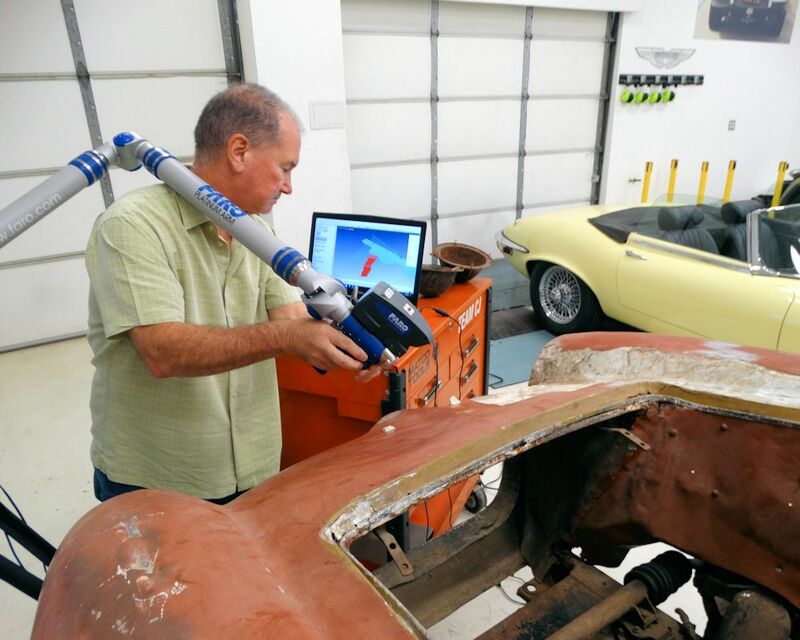 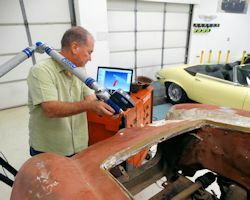 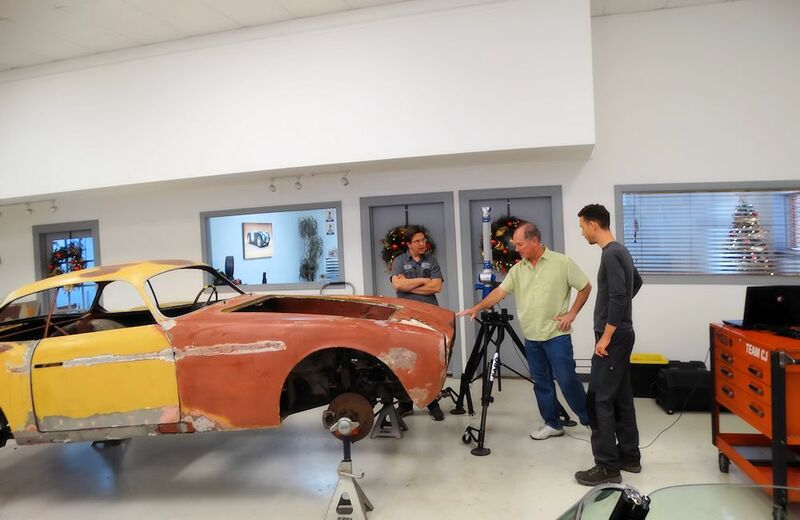 We felt it was important to get the bodywork as straight and centered as possible prior to the 3D scanning process scheduled to take place on Monday. If you look carefully at the first two photos below you can see that the front end bodywork is offset to the right hand side, undoubtedly as a result of a major accident which we now know occurred on August 13, 1975. 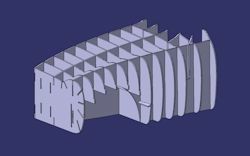 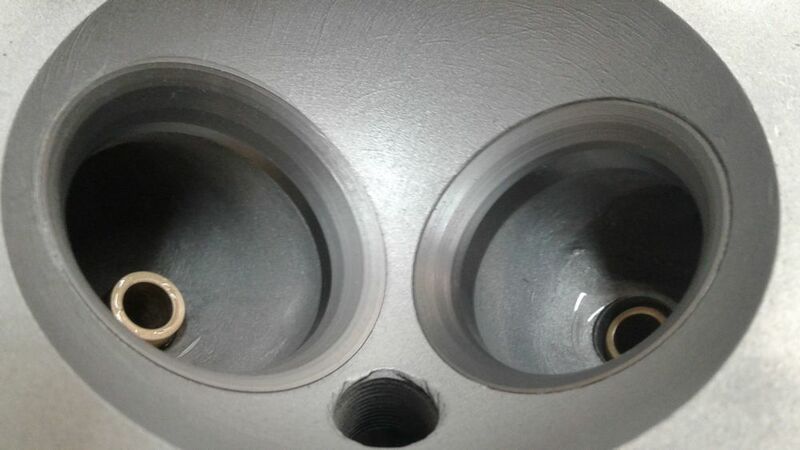 Look at the peak above the grill opening, then compare it to the center point of the fan. 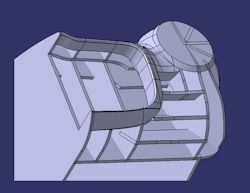 The two should be aligned, although the body has clearly been shifted to the right. 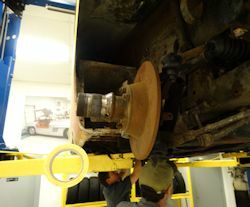 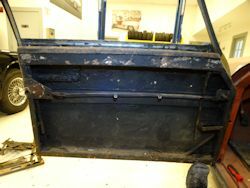 Before we have the car scanned next week, we are going to reposition the body so that it is more centered on the chassis. 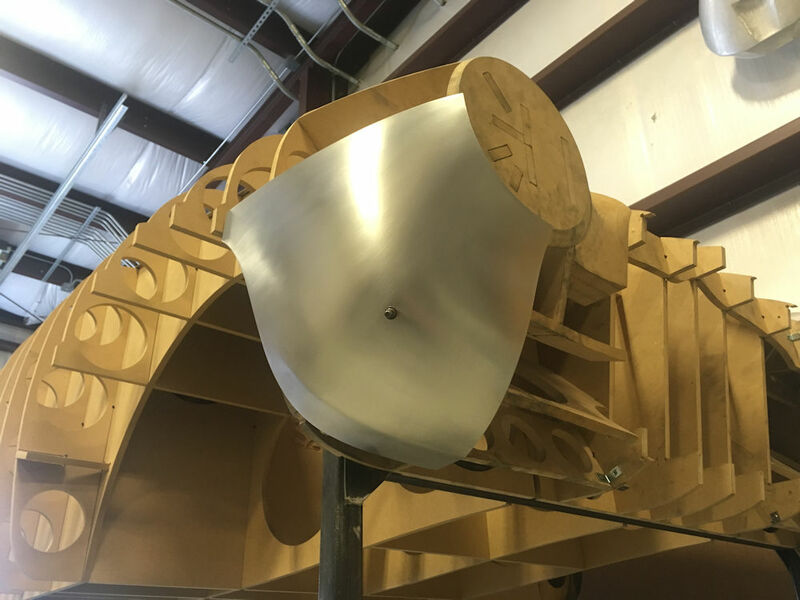 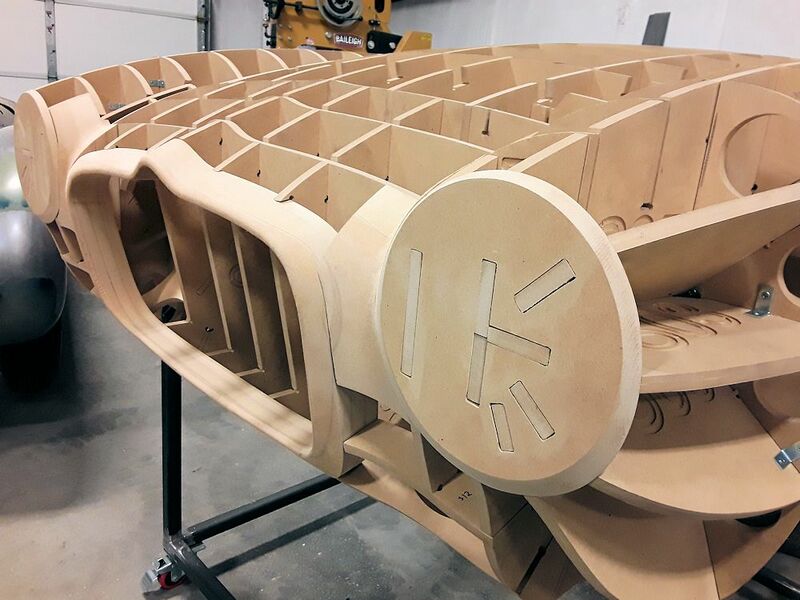 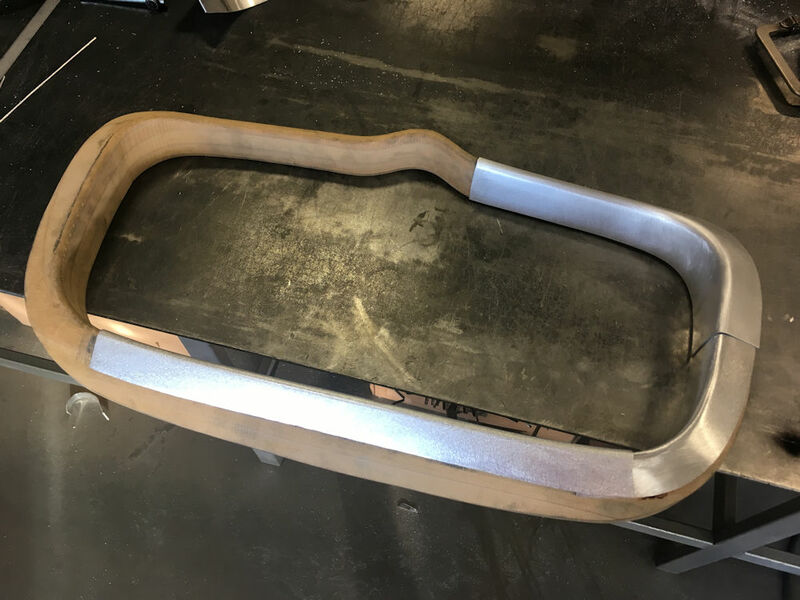 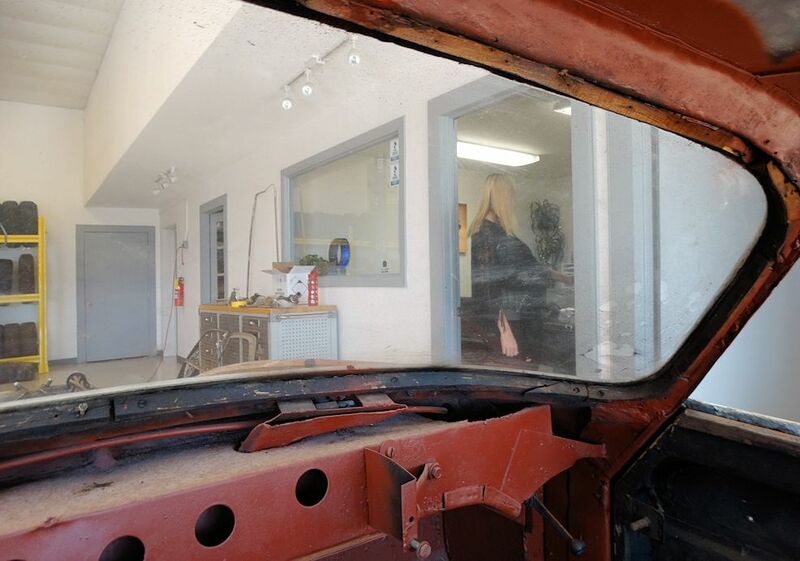 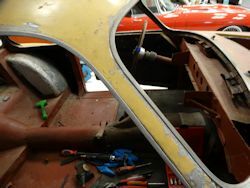 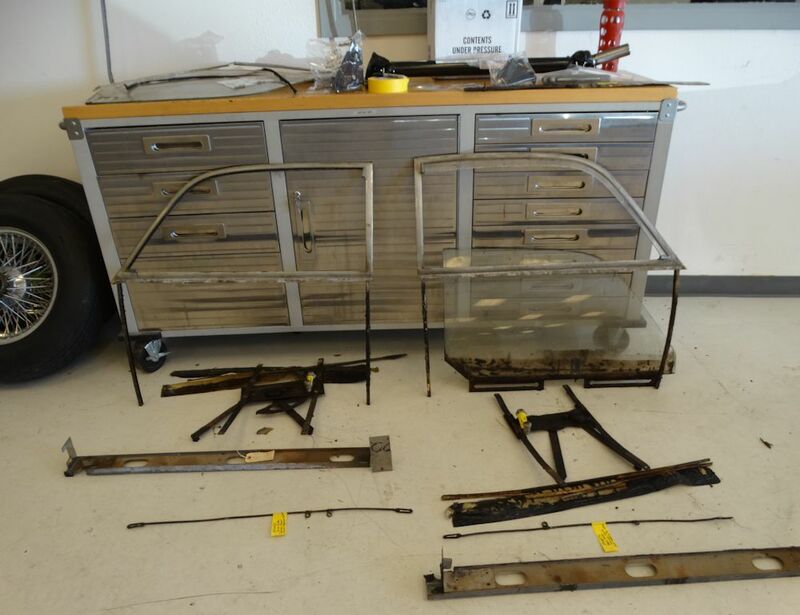 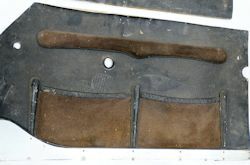 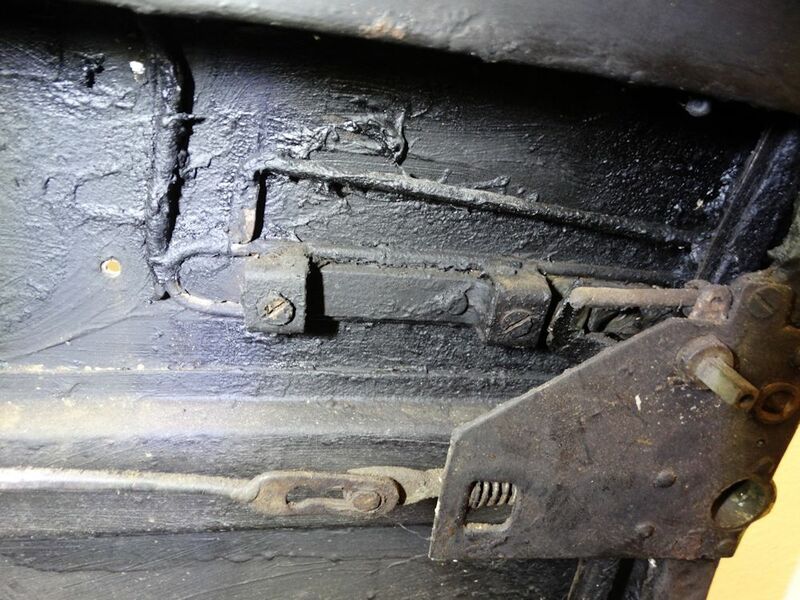 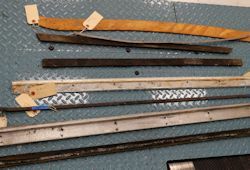 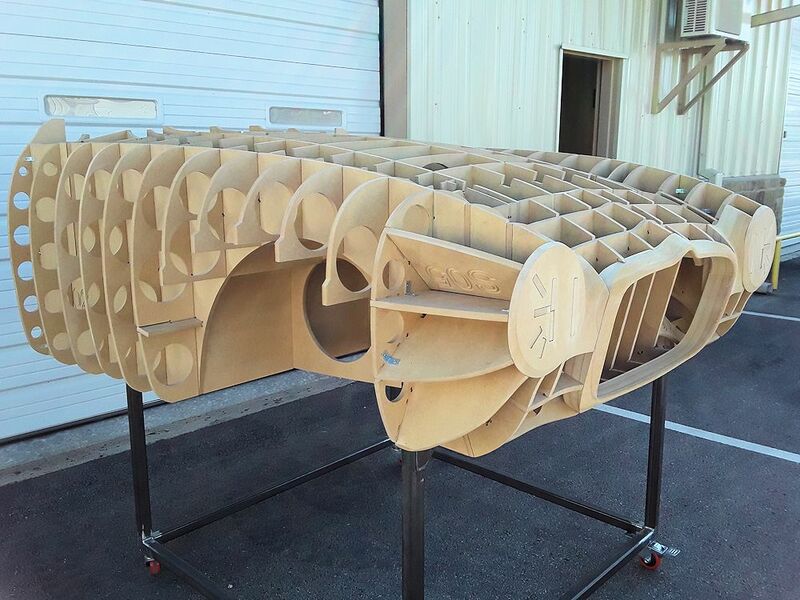 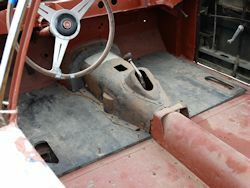 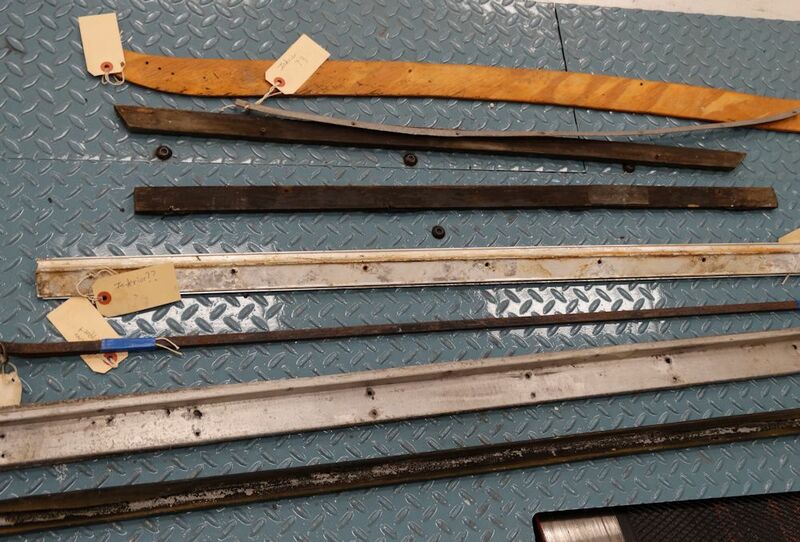 In this way, the wooden station buck, and the panels we make using the buck, will return the front end of the car to the shape it was prior to the accident back in 1975. 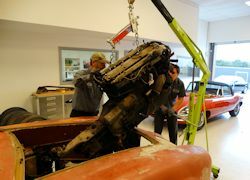 In order to correct the front end misalignment, it was necessary to remove the engine and gearbox, which Ray and Jake did earlier today. 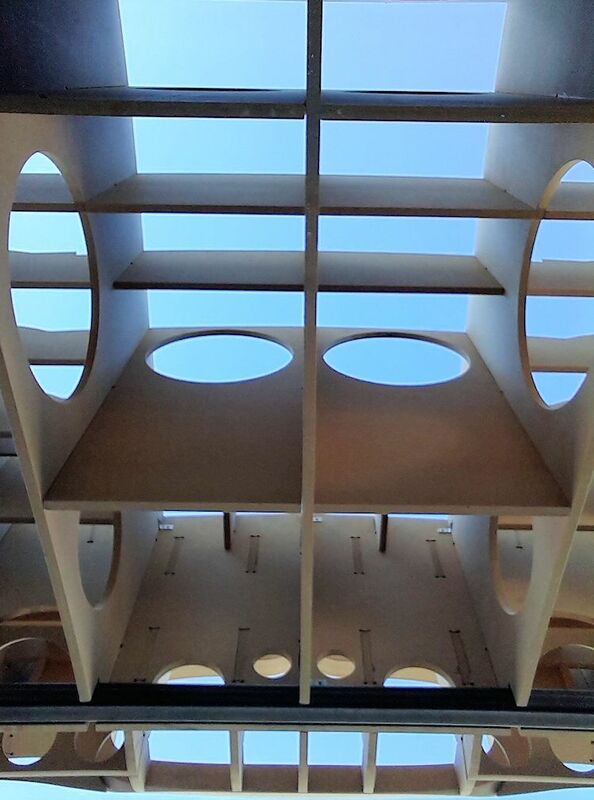 I am excited to report that we now have this very important restoration underway! 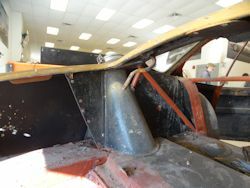 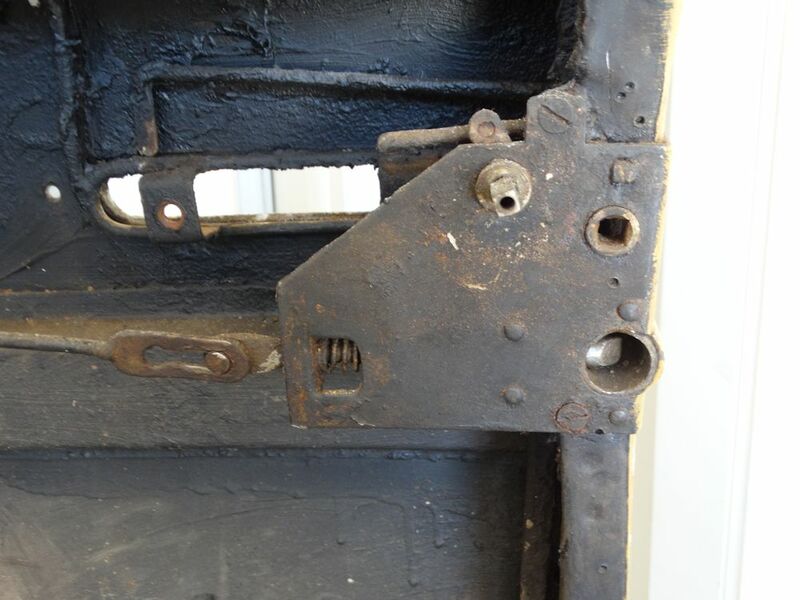 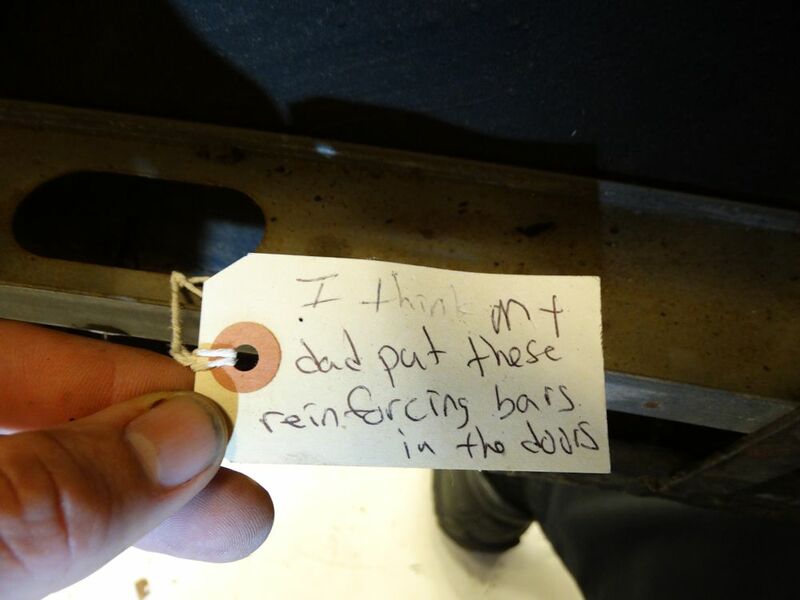 As we got the tear down underway earlier this week, we immediately made a very surprising discovery. 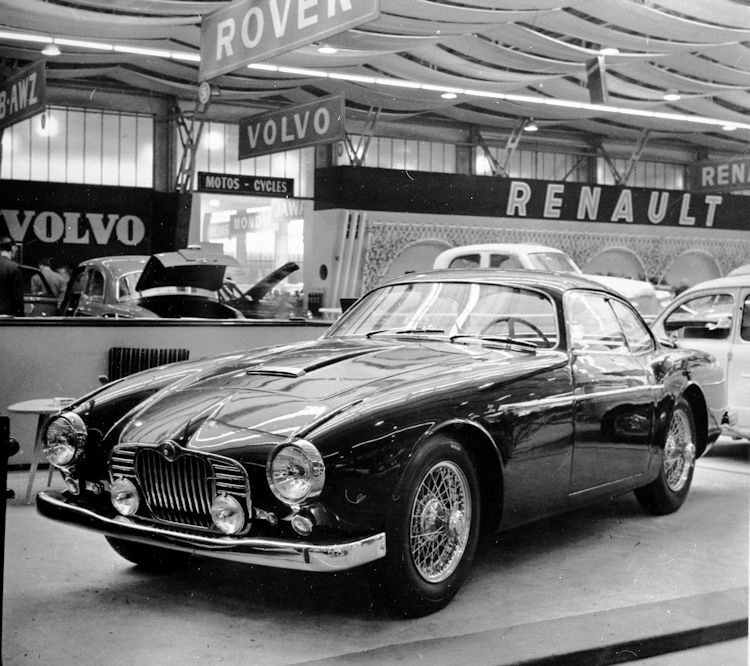 We had always thought the Jaguar XK150 Zagato was originally black, although this was based entirely upon an apparently enhanced photograph that we now know was taken at the Geneva Motor Show in March 1958. 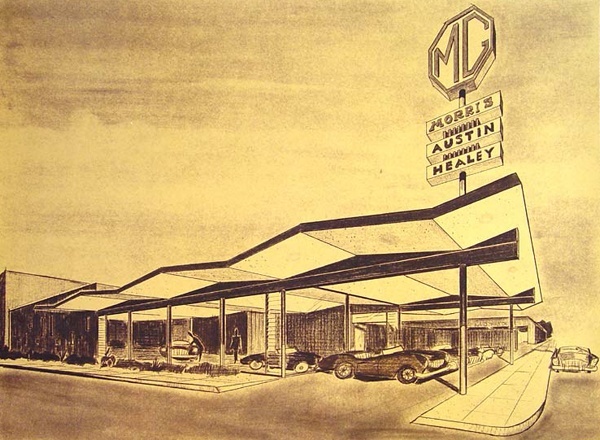 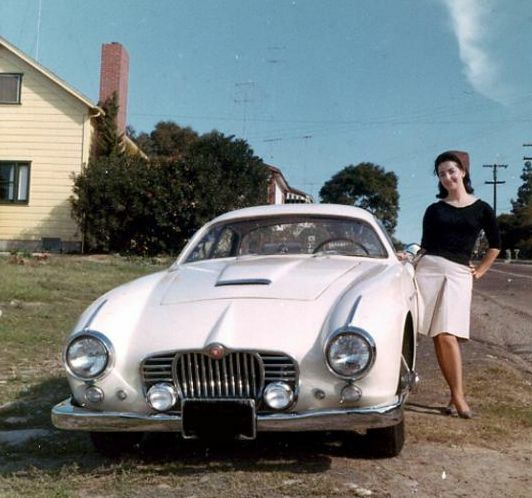 On closer examination of the 'newsprint' photograph of the car on page 229 of The Motor magazine dated March 19, 1958, it is clear that the car was actually a lighter hue than black. 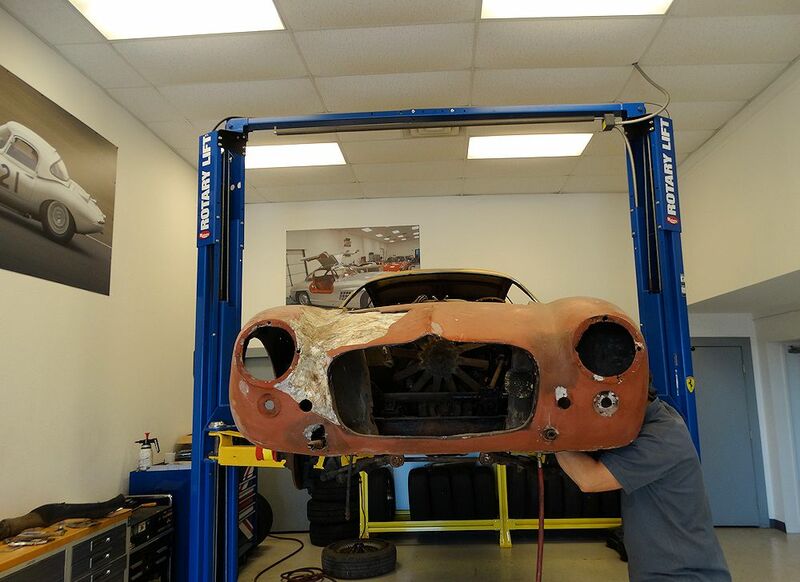 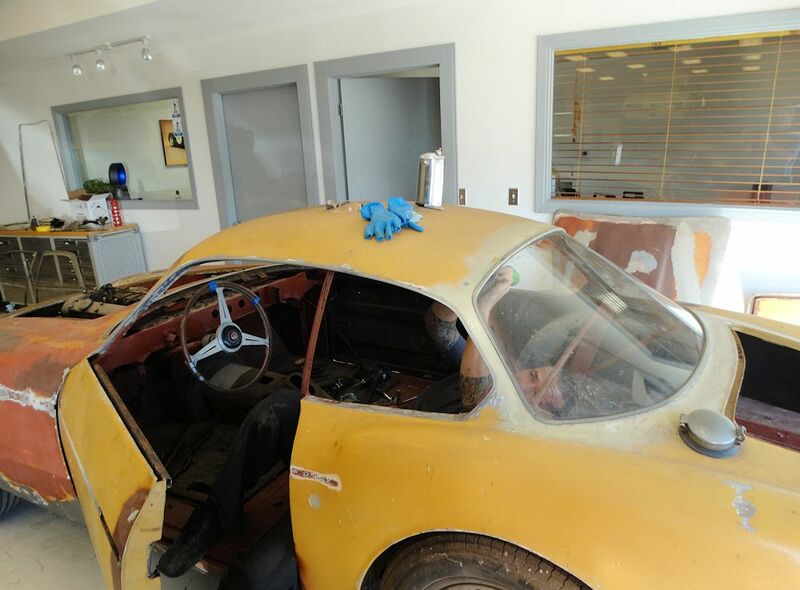 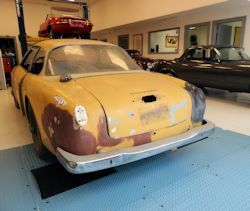 Fast forward to today, when we sanded away several layers of paint and primer to find that the car was originally dark bronze! 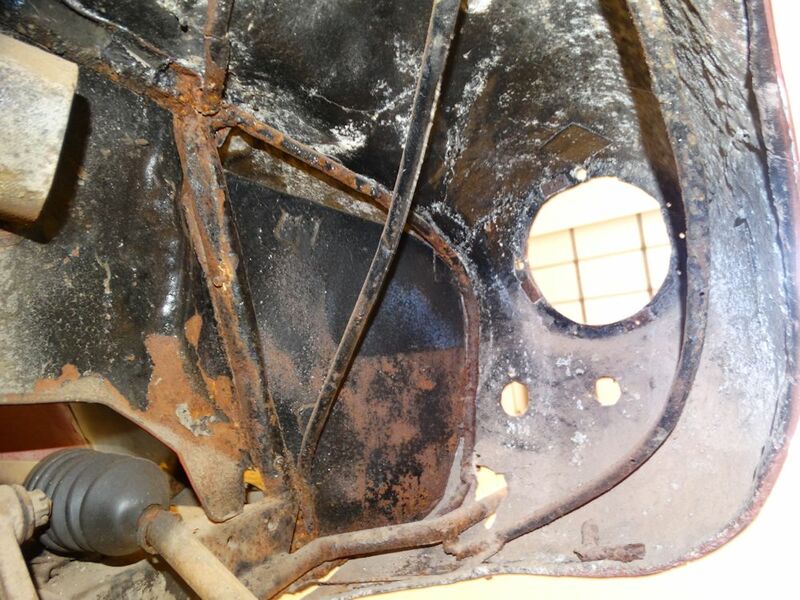 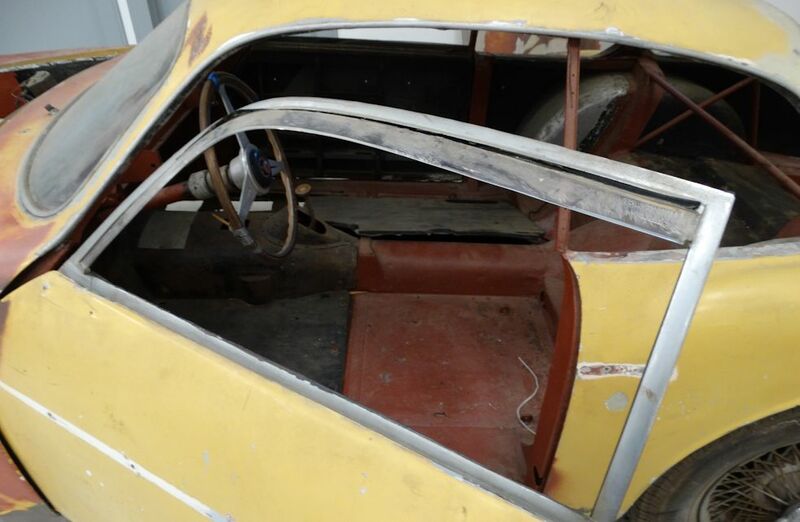 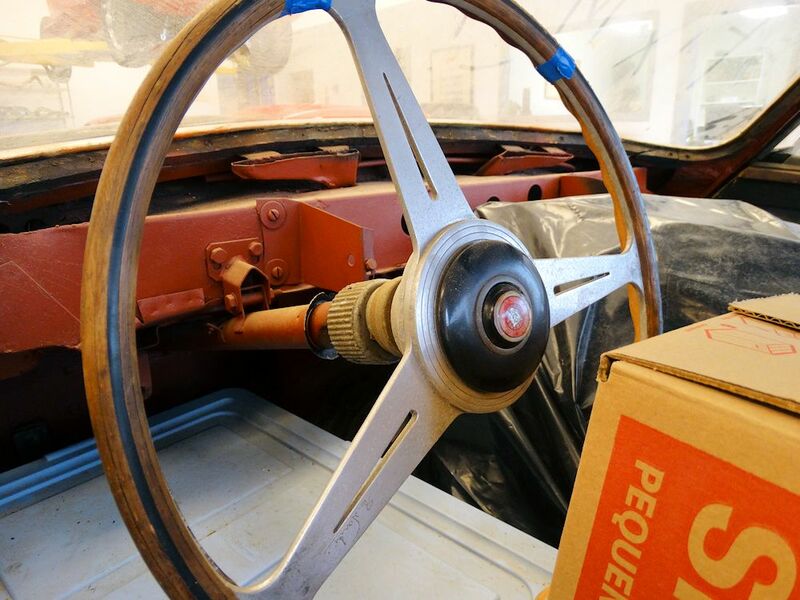 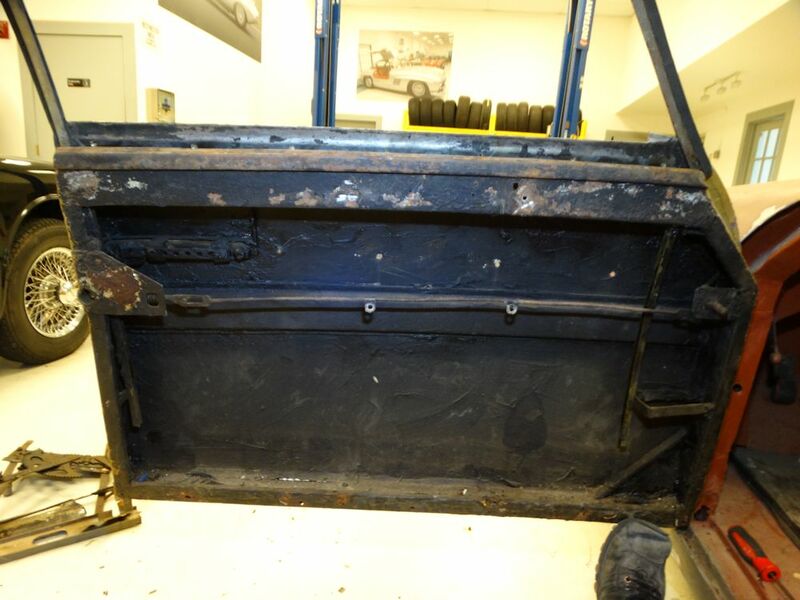 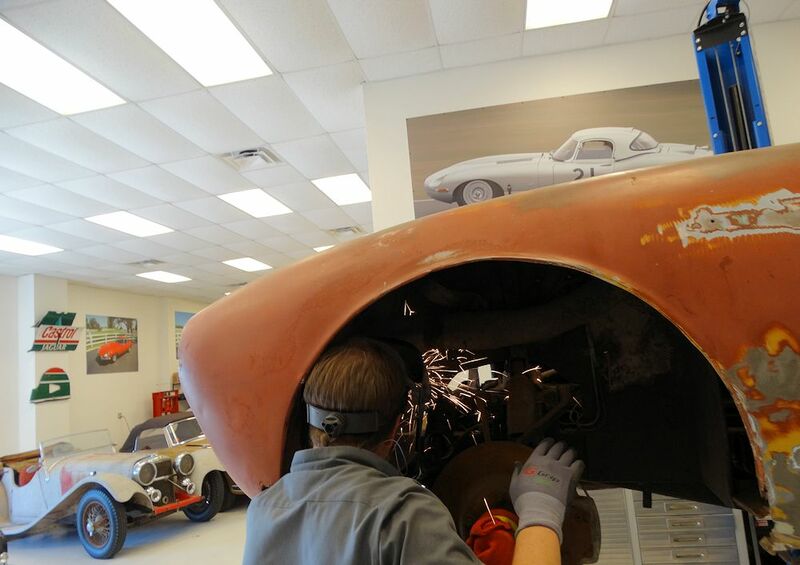 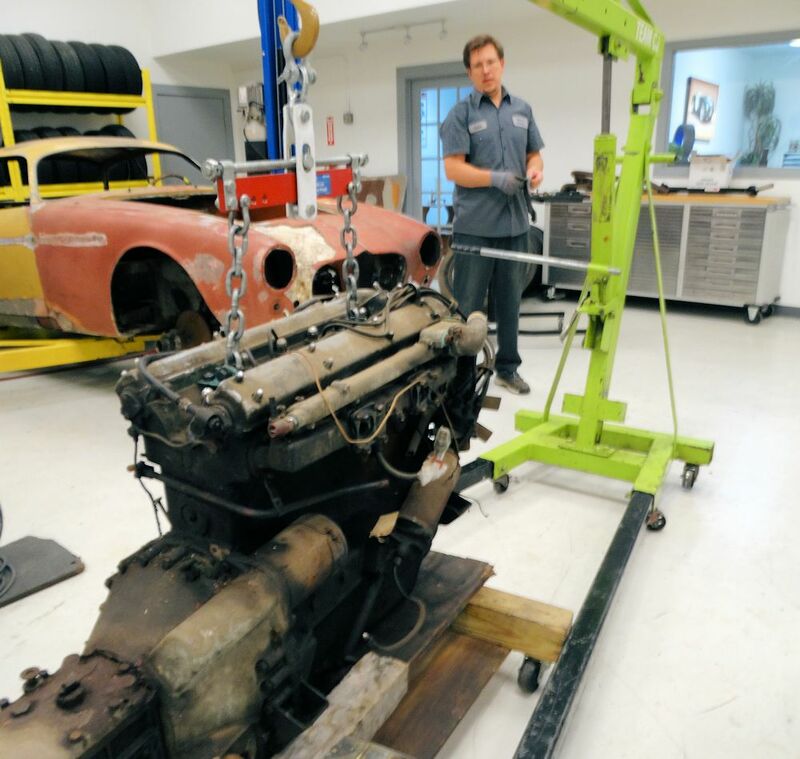 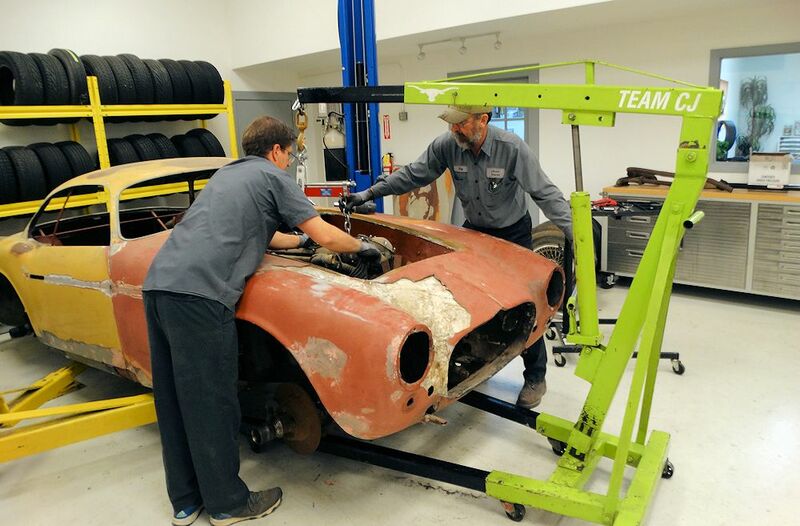 We can find no evidence of any black paint anywhere on the car, including in all the nooks and crannies that were not stripped when the car was repainted white shortly before it was imported into the US in 1960. 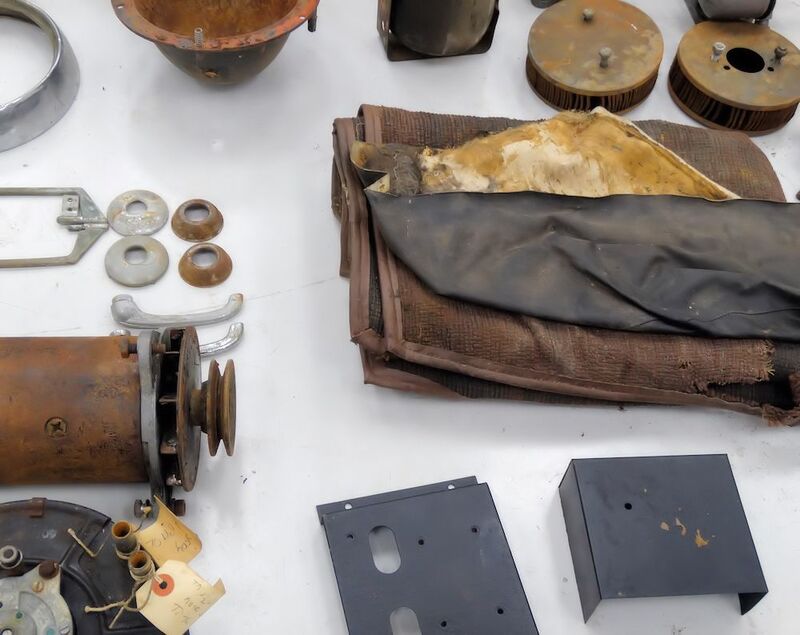 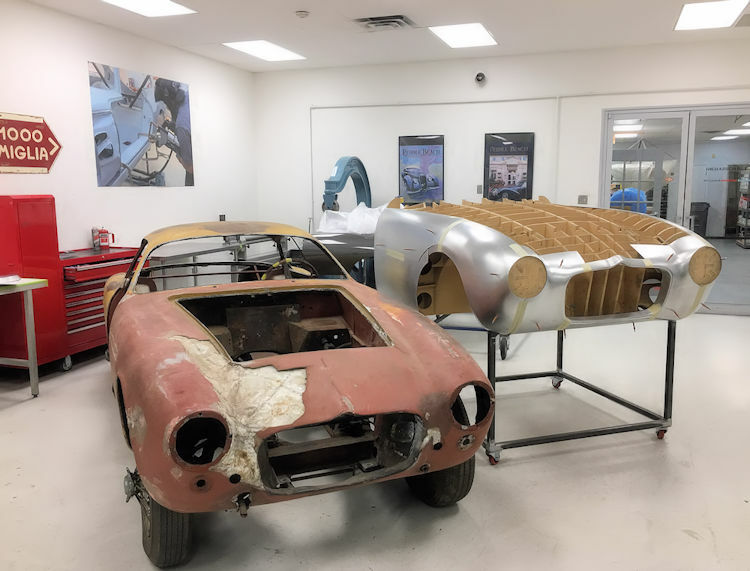 In the first two photos below, you can clearly see the various substrate layers from the aluminum up, as well as the dark metallic bronze color we now believe was the color of the car when it was displayed at the Geneva Motor Show in 1958. 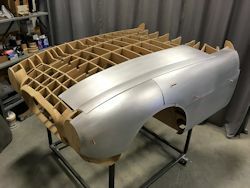 The first layer is a green etching primer, followed by a grey sealer, followed by cream colored body filler, followed by another application of sealer, followed by a single stage dark metallic bronze lacquer. 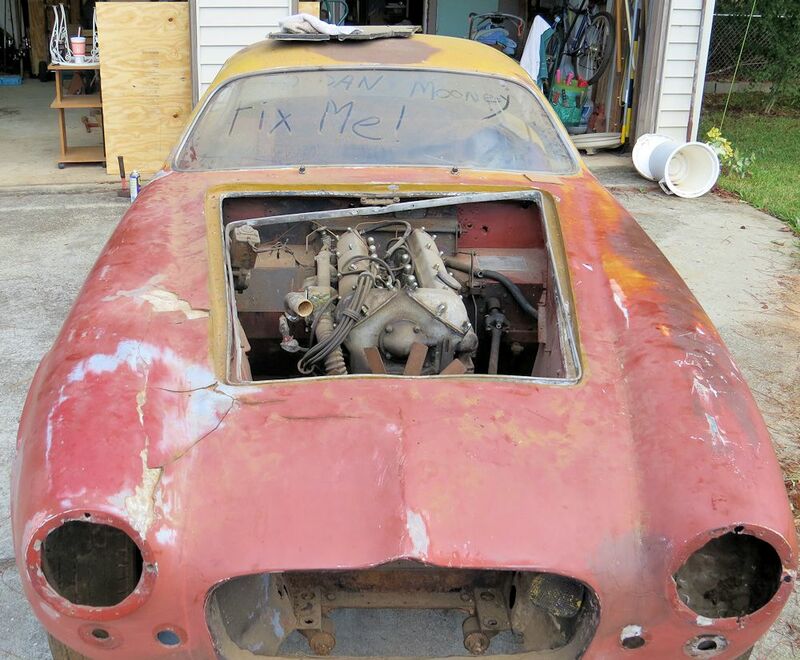 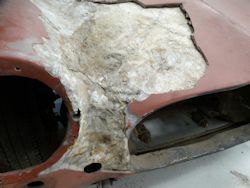 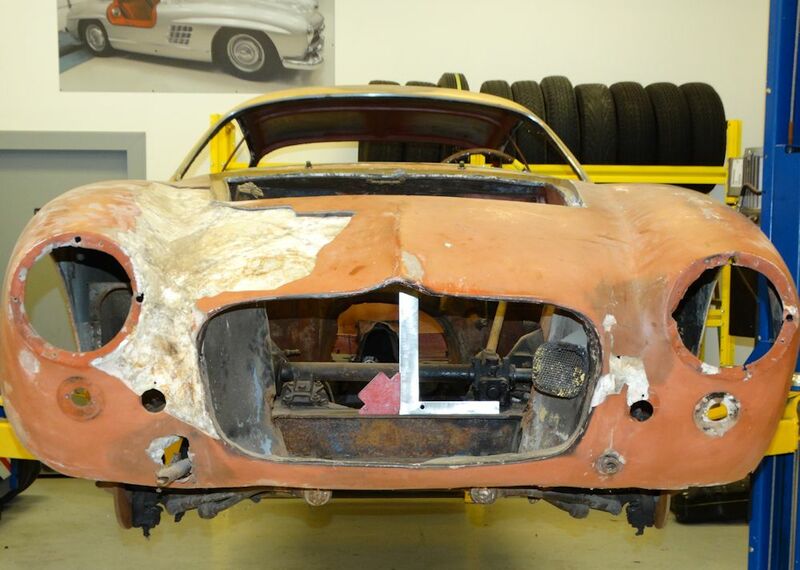 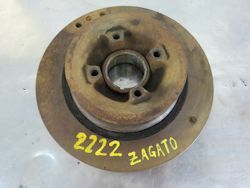 Unfortunately, the body of our Zagato is very badly damaged. 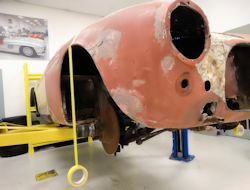 Clearly the car was in a major accident which deformed the front and front right corner of the body, leading to some very extensive repairs, mostly in bondo. 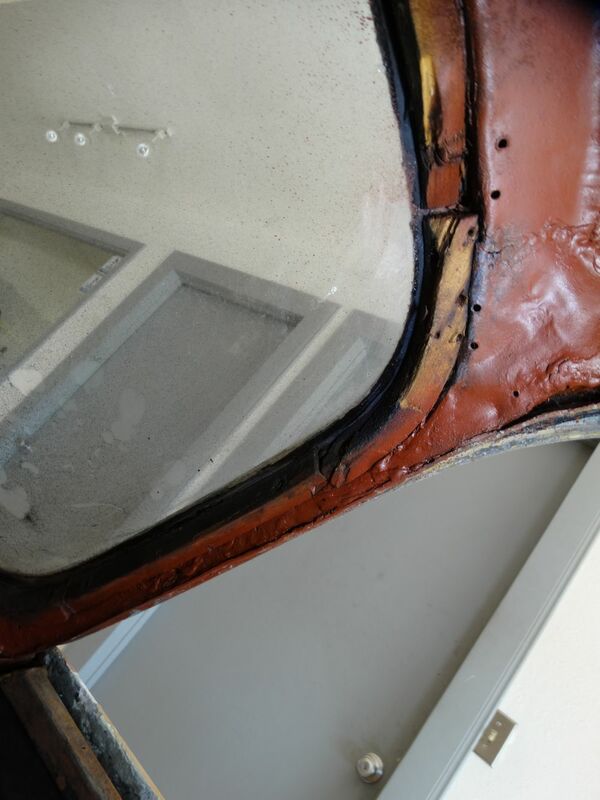 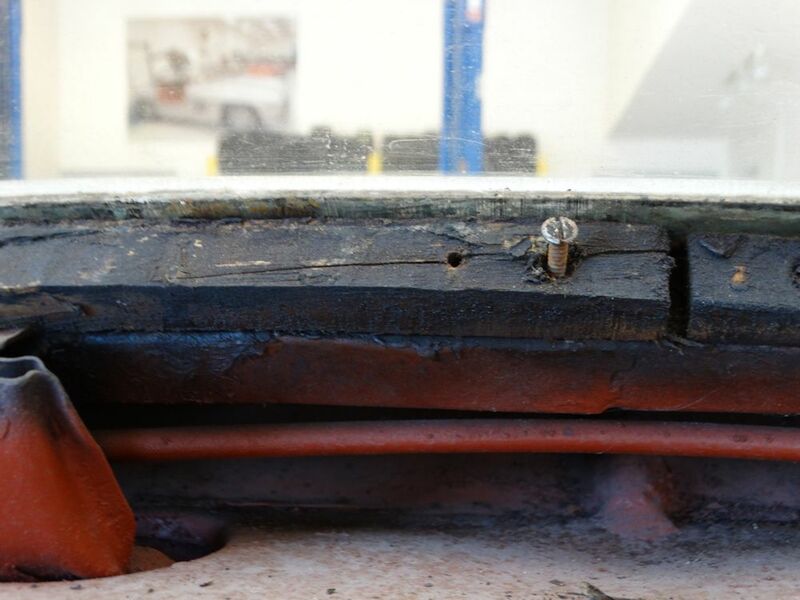 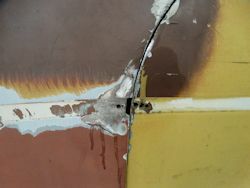 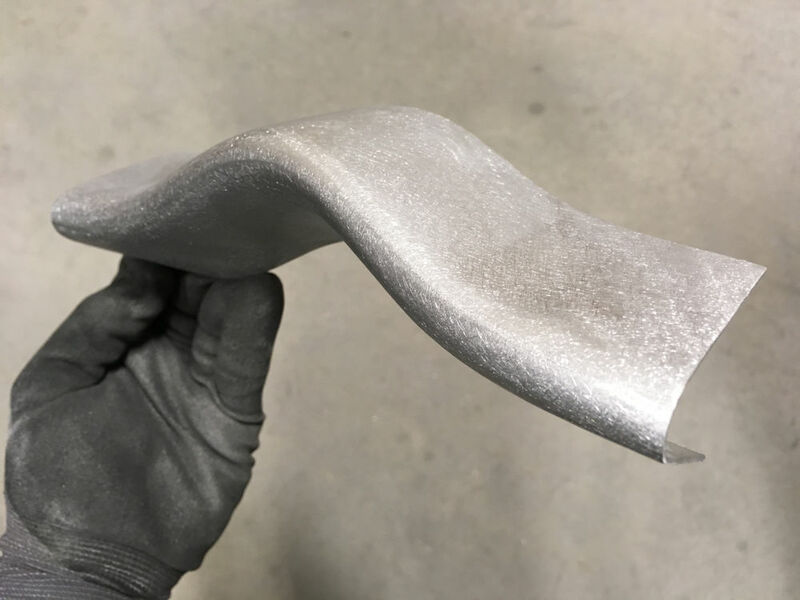 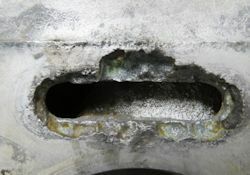 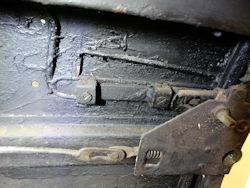 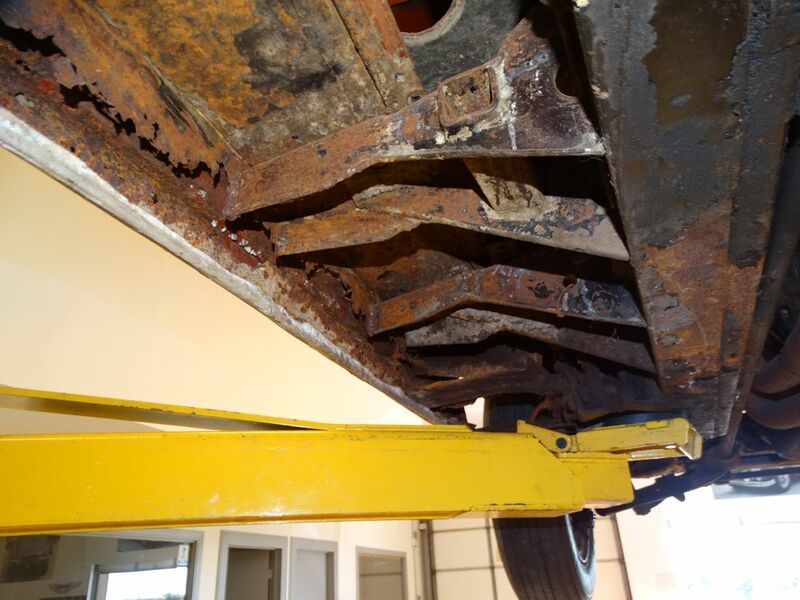 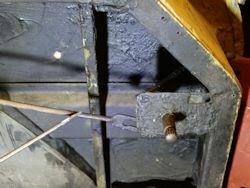 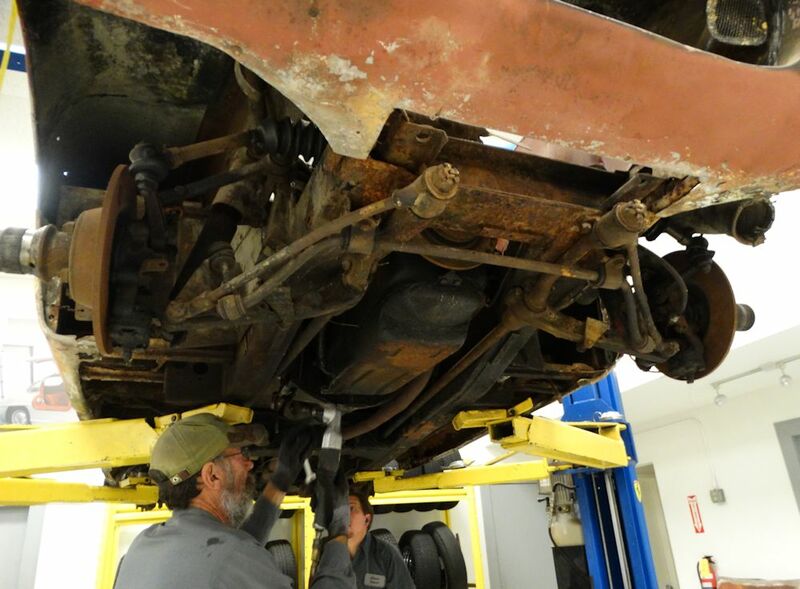 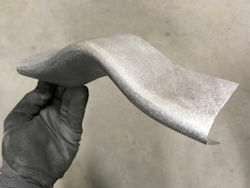 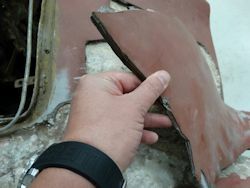 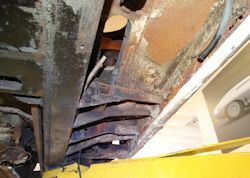 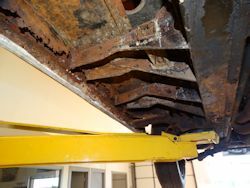 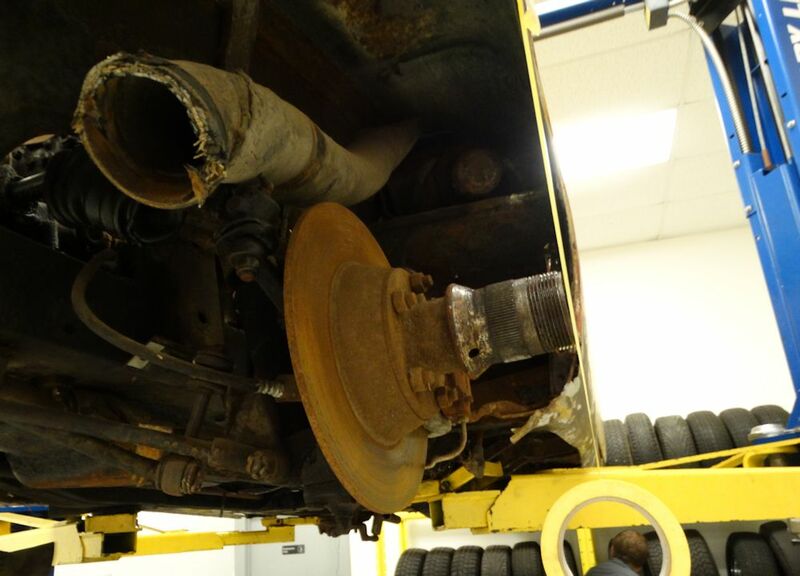 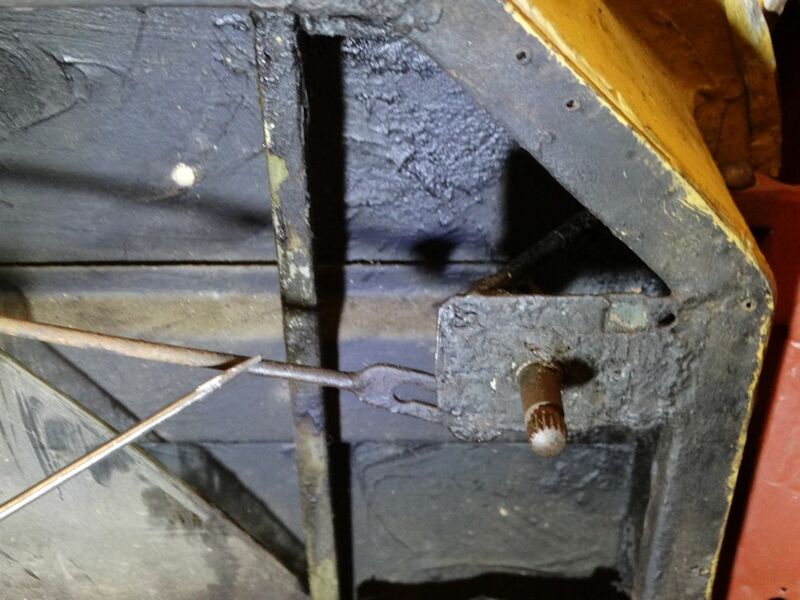 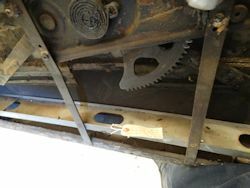 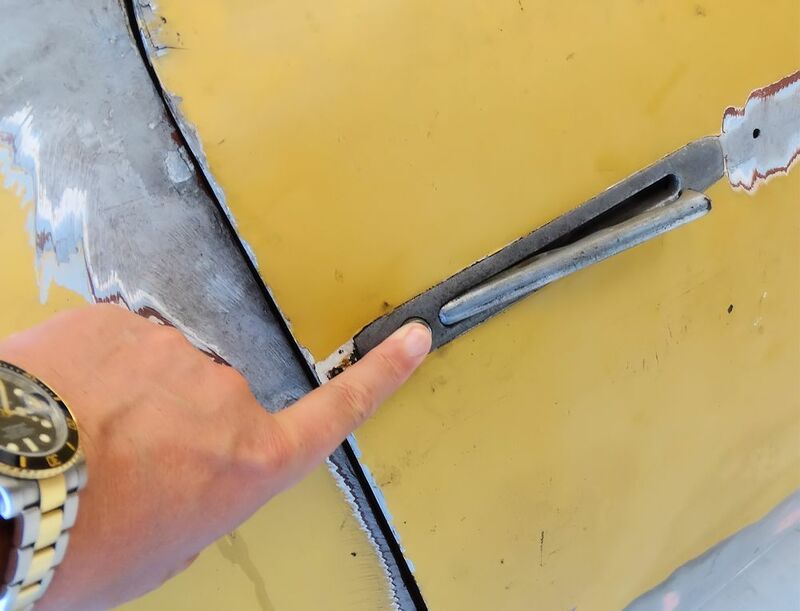 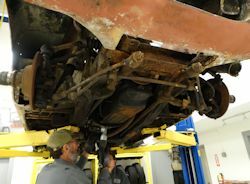 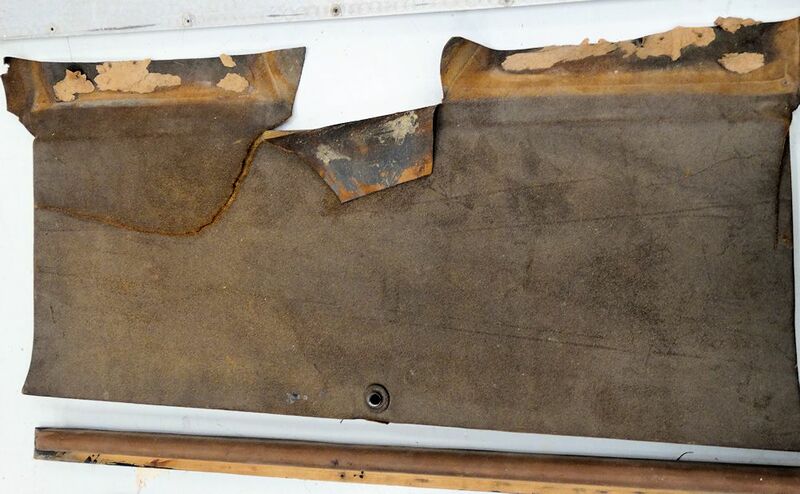 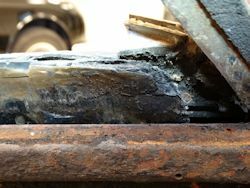 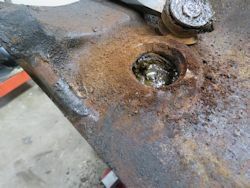 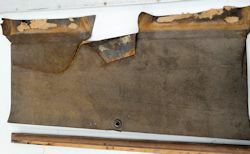 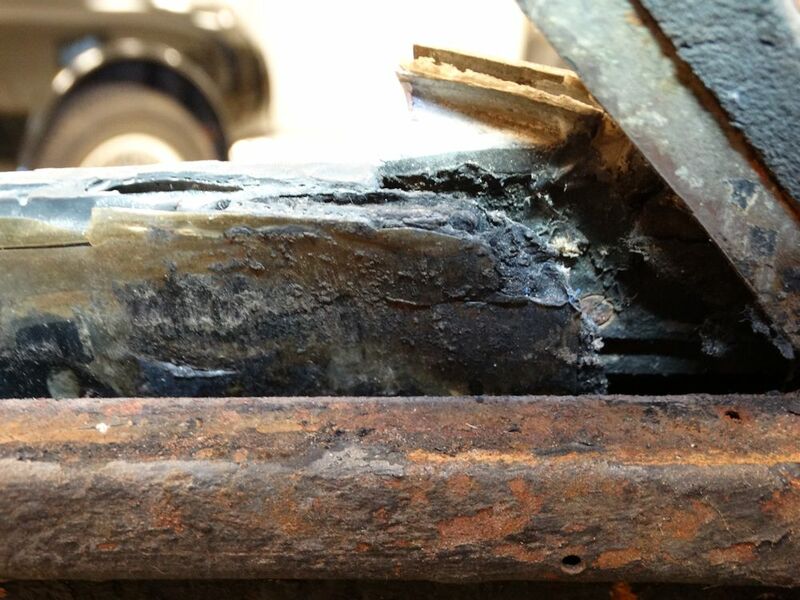 Furthermore, there is extensive galvanic corrosion throughout the car, which means that many panels will have to be fabricated and replaced. 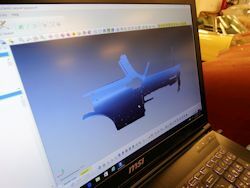 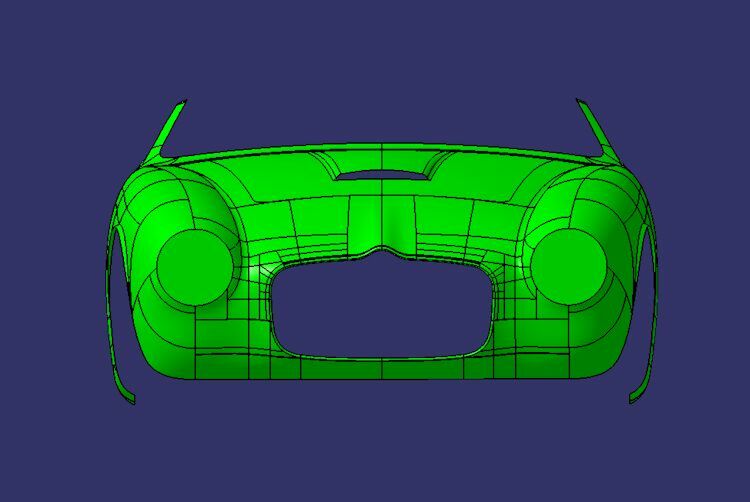 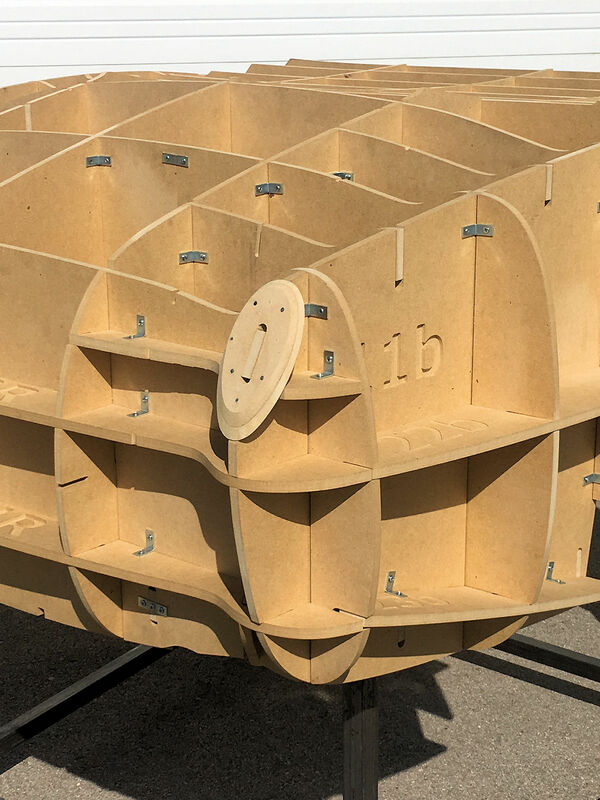 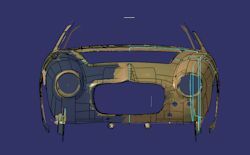 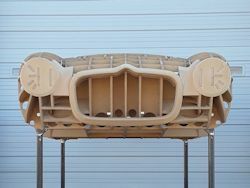 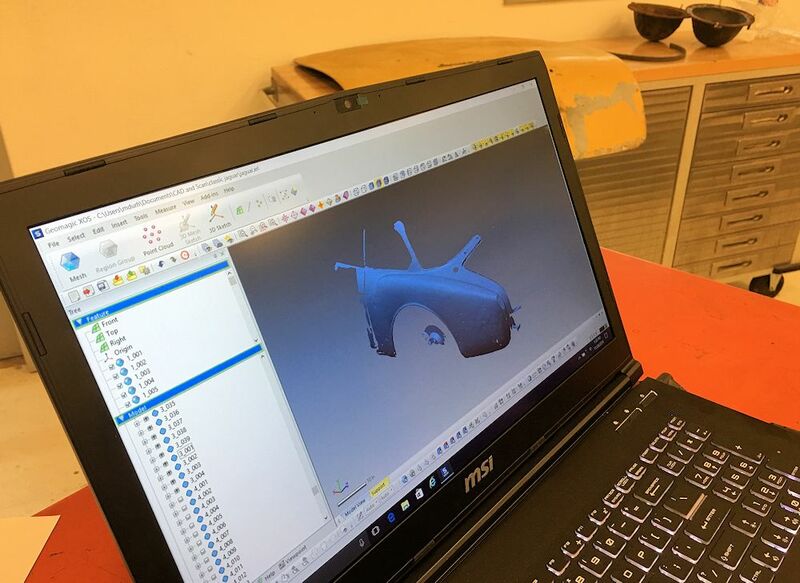 To this end, we have decided to have the car scanned to produce a 3D 'model', from which we will construct a wooden body buck, allowing us to form new alloy replacement panels. 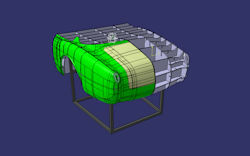 We will cover the process in some detail, as I'm sure it will be interesting to many observers. 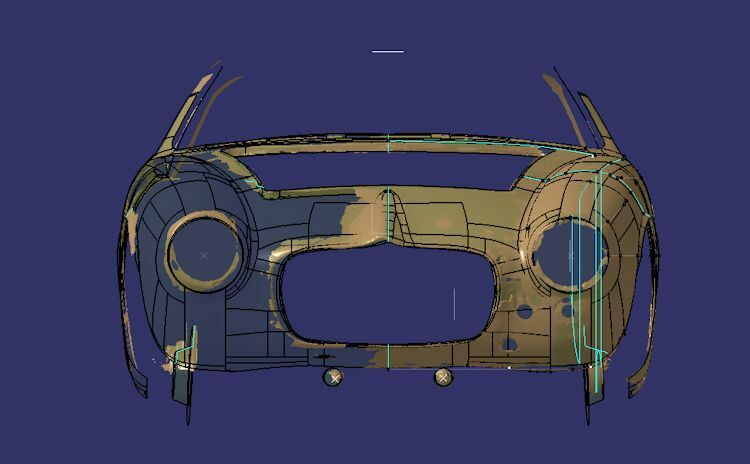 It should be a delightful mix of old world craftsmanship and new age computer aided design! 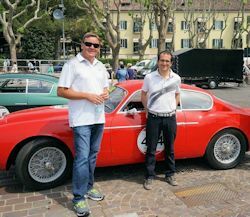 Last week I was thrilled to receive an invitation to meet with Andrea Zagato while I was in Italy attending the Mille Miglia. 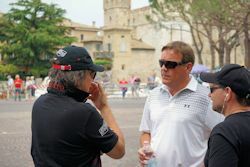 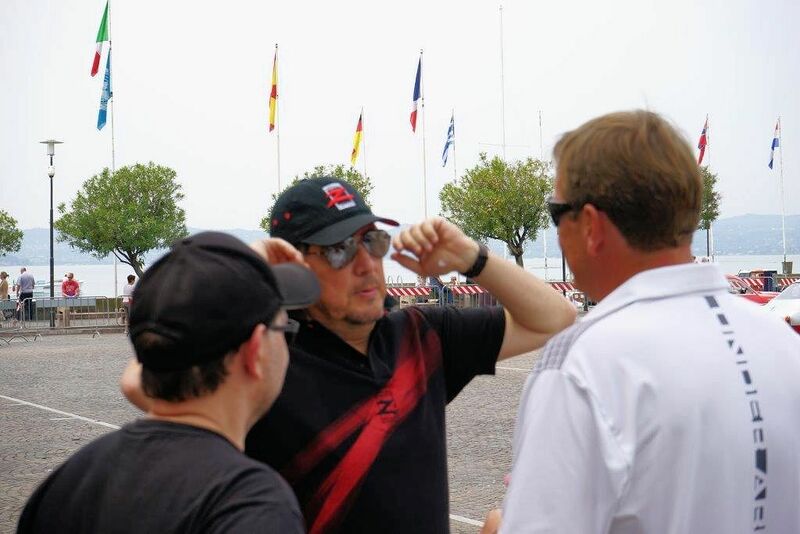 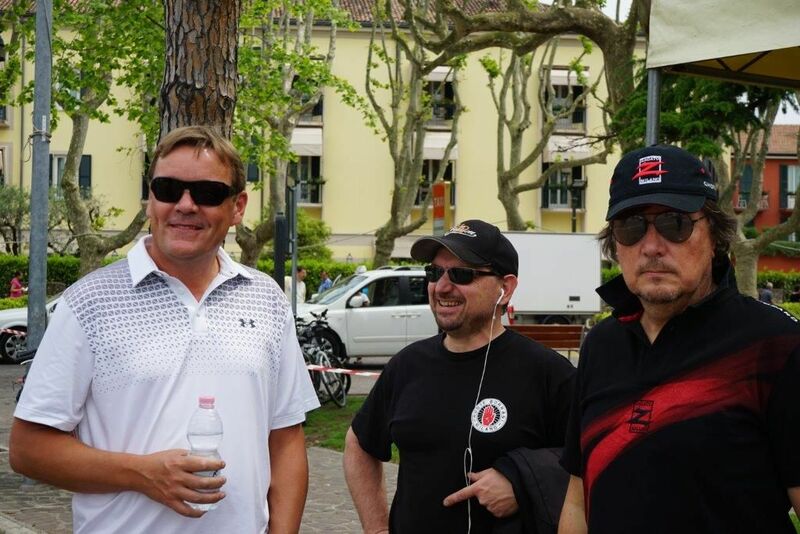 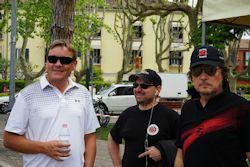 The following photographs were taken in the picturesque town of Sirmione, on Lake Garda, where Andrea and several other Mille Miglia competitors were practicing for the legendary race. 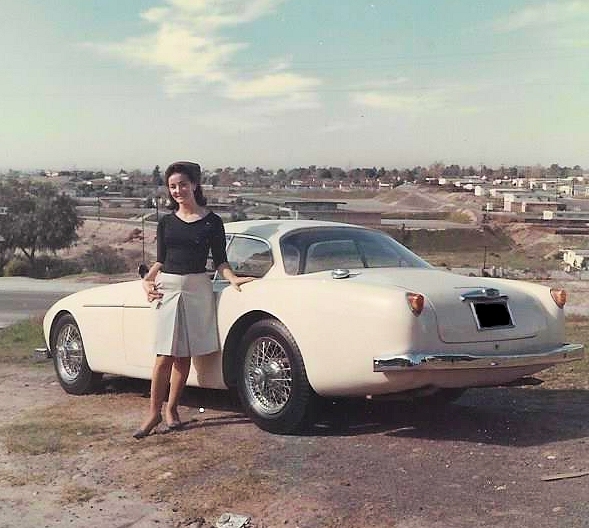 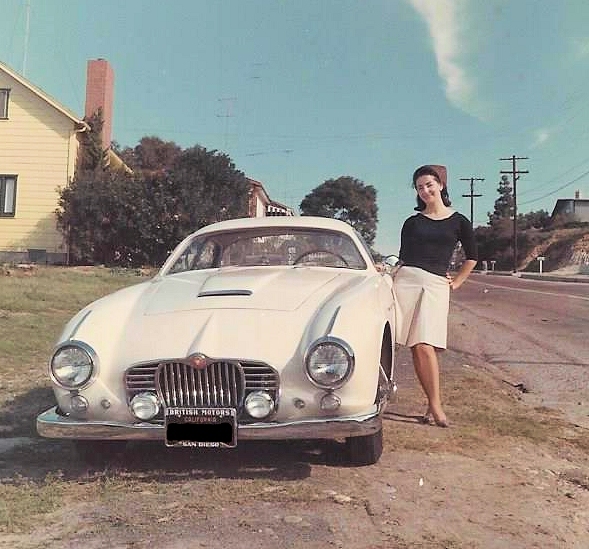 Andrea was driving a beautiful 1956 Alfa 1900 C Super Sprint Zagato. Andrea was excited to speak to me about our restoration of the XK150 Zagato that his father had built more than 55 years ago. 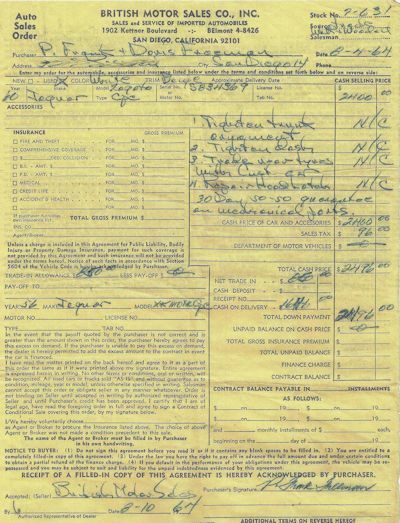 We were delighted recently to receive the original sales order relating to Frank Freeman's purchase of his Jaguar XK150 Zagato from British Motor Sales in San Diego in August 1964. 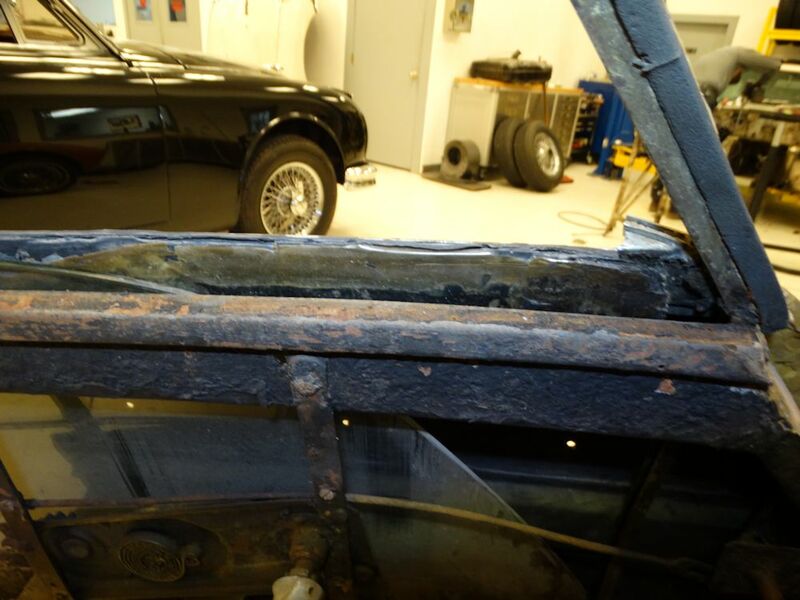 Although the car was barely 4 years old at that point, the coachwork had already been changed from black to white. 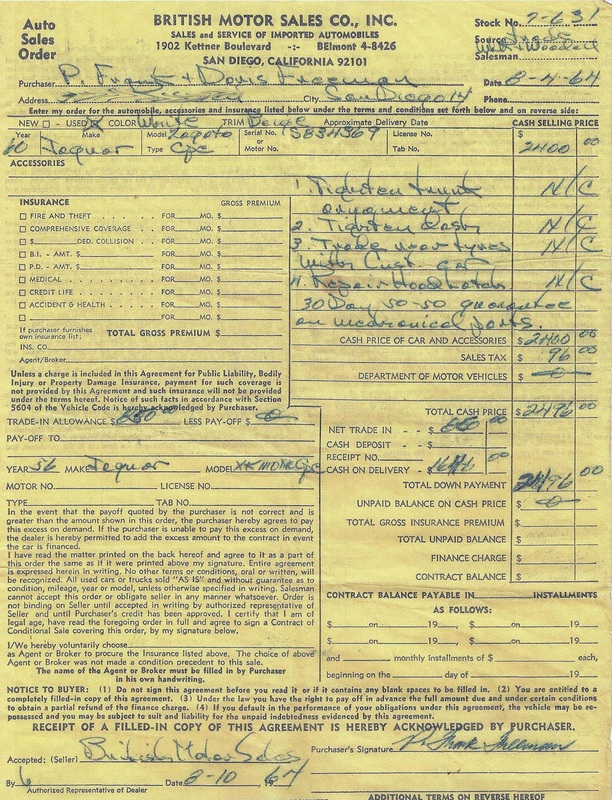 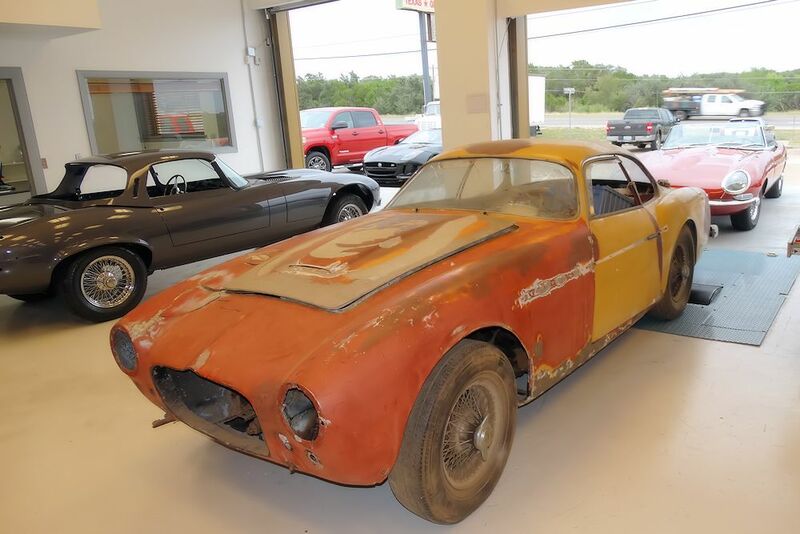 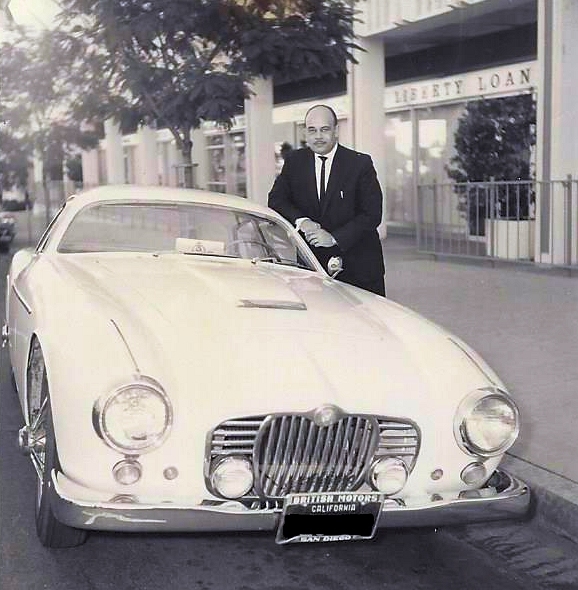 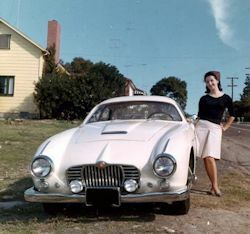 Mr. Freeman paid $2,496.00 for the exotic Zagato, less a trade-in allowance of $850.00 against his 1956 Jaguar XK140 coupe. 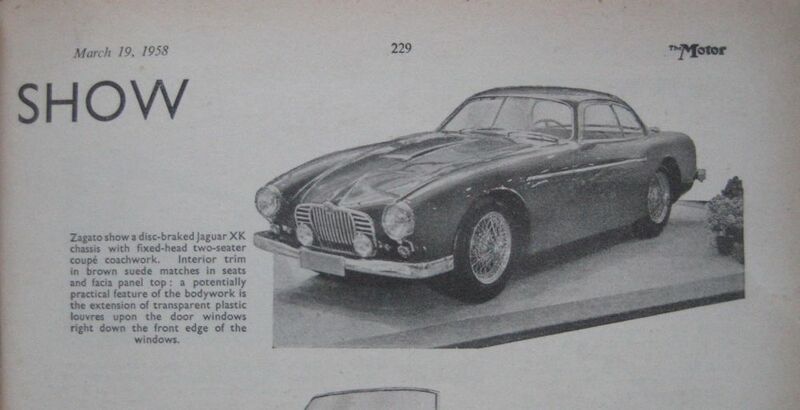 We have also included a couple of images showing how British Motor Sales would have looked at the time, and how it looks today. 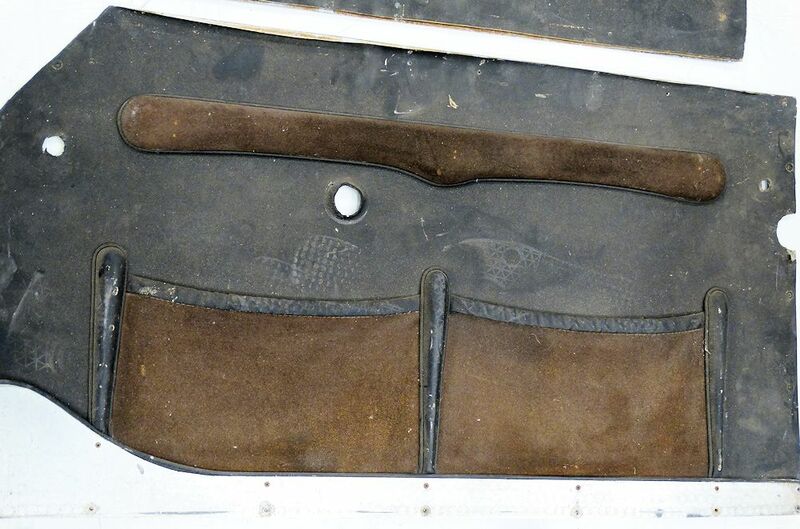 We have now unpacked and inspected the car, paying particular attention to the materials used when the car was first trimmed at the Zagato factory. I am pleased to report that your car has been safely delivered to the Team CJ workshops. 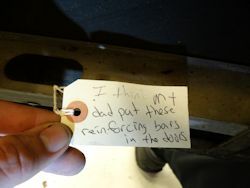 Another message from the owner! 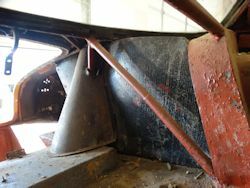 I am delighted to report that we will have this exciting restoration underway early next year.